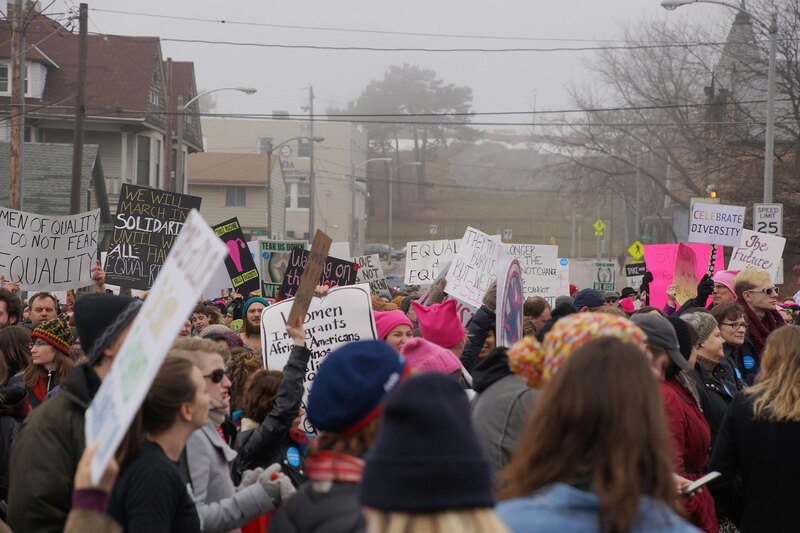 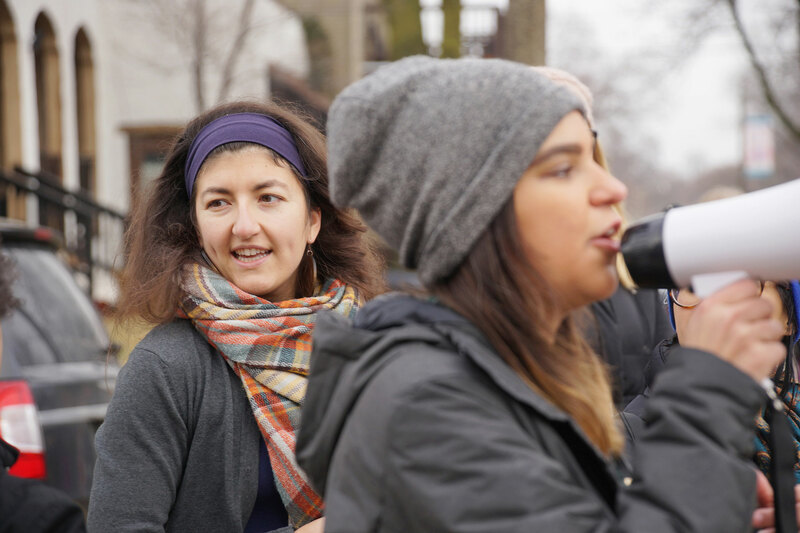 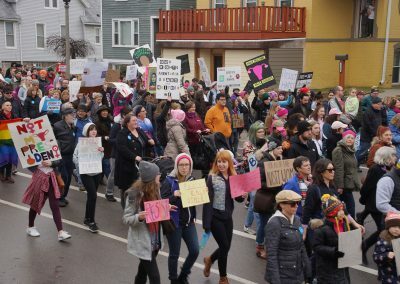 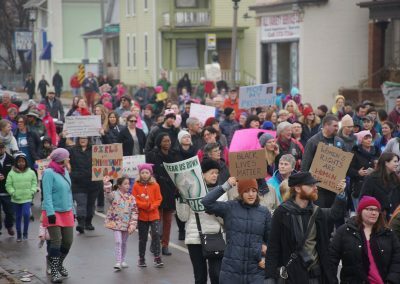 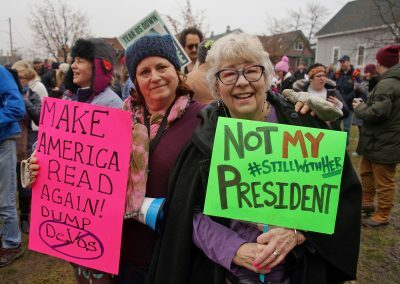 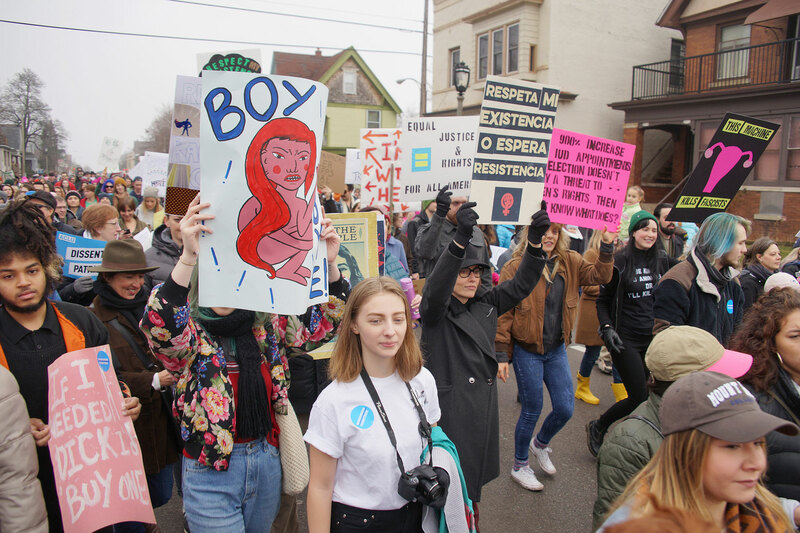 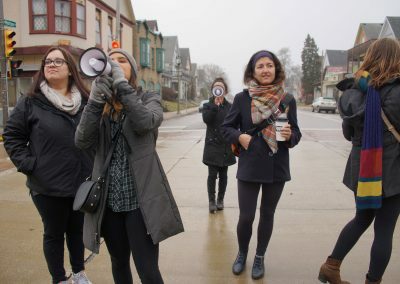 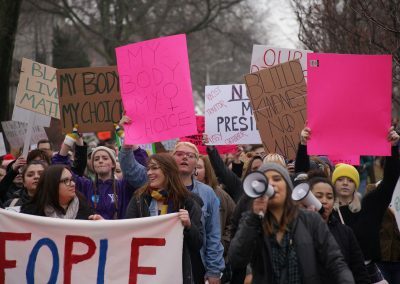 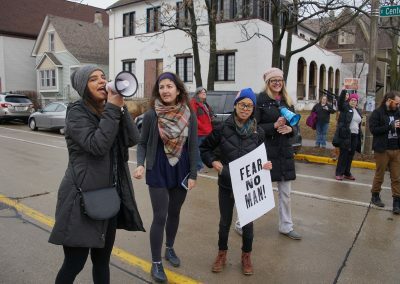 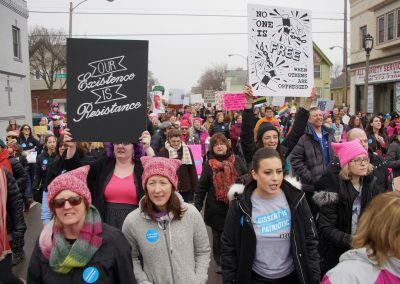 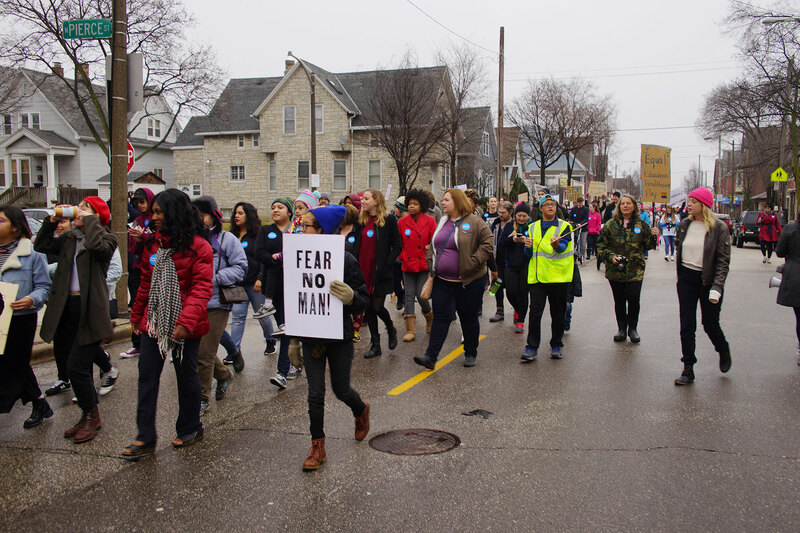 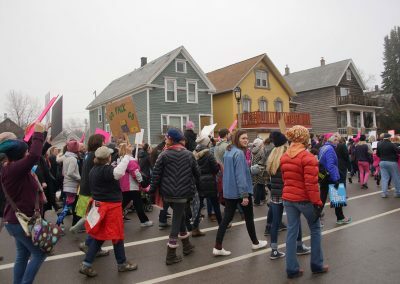 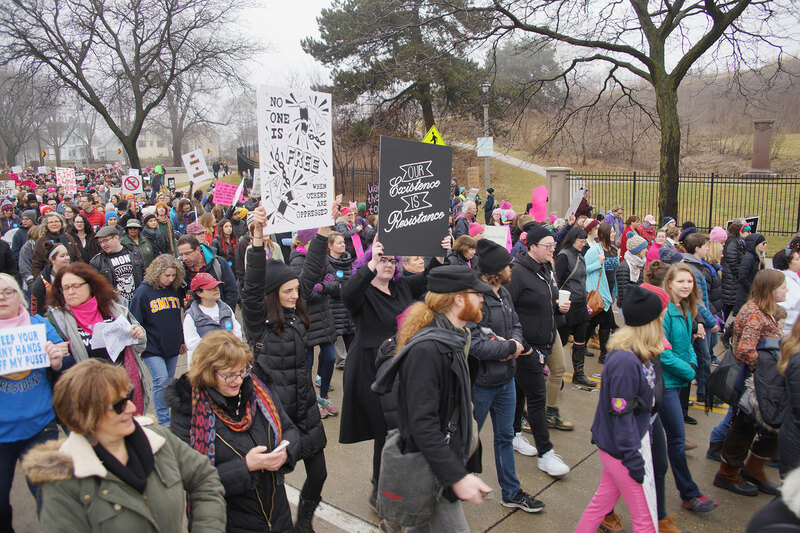 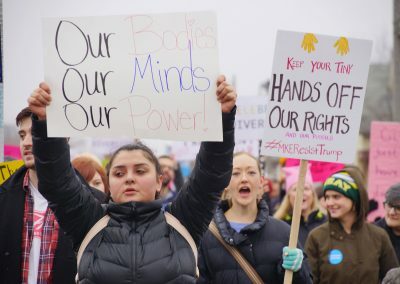 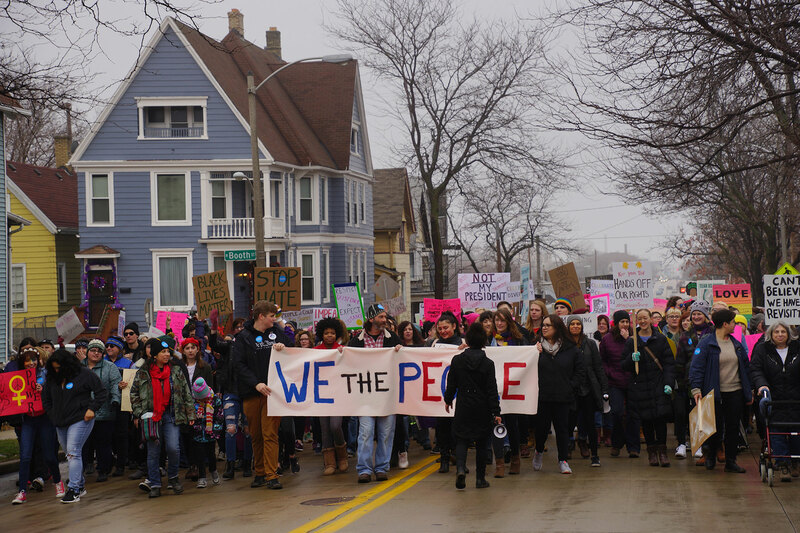 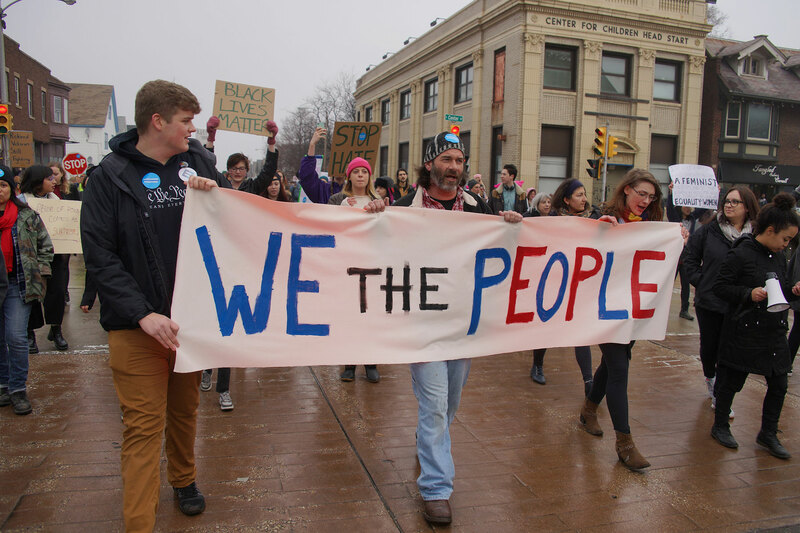 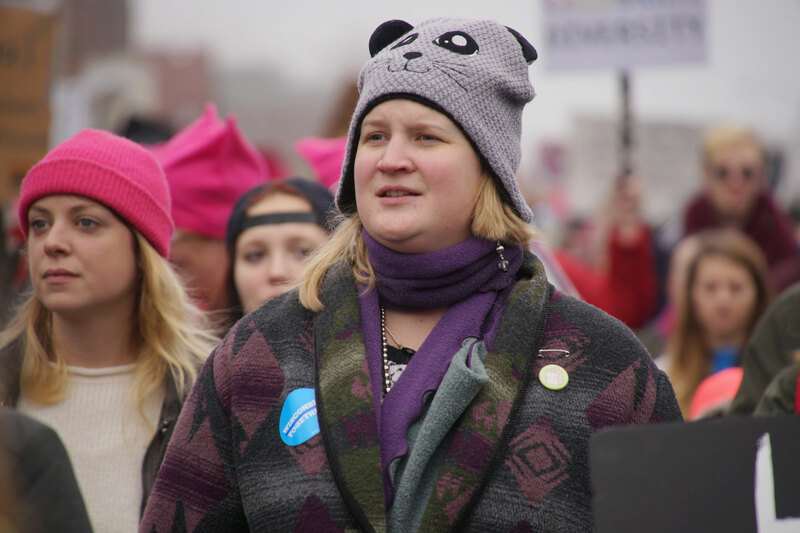 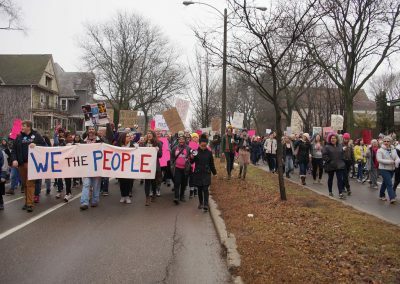 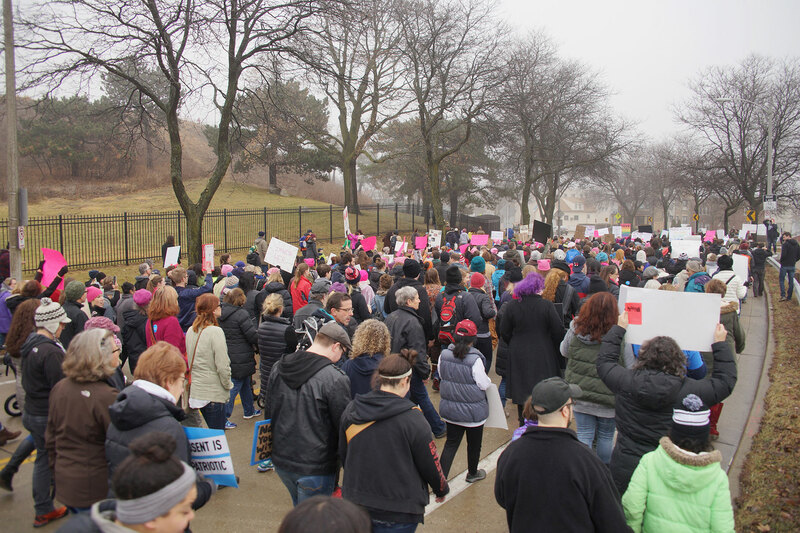 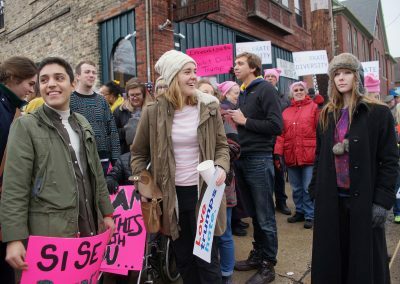 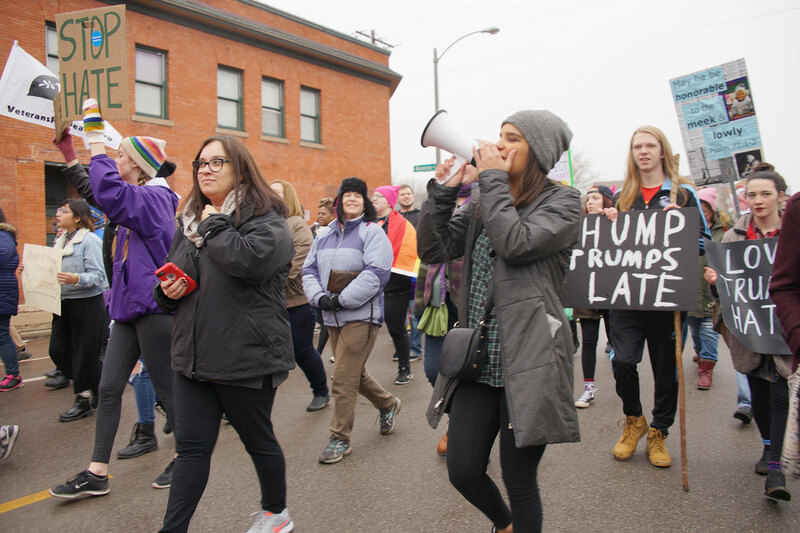 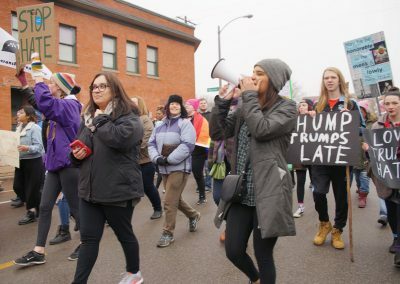 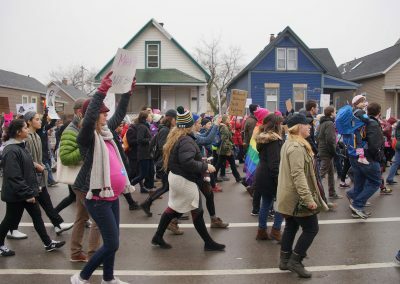 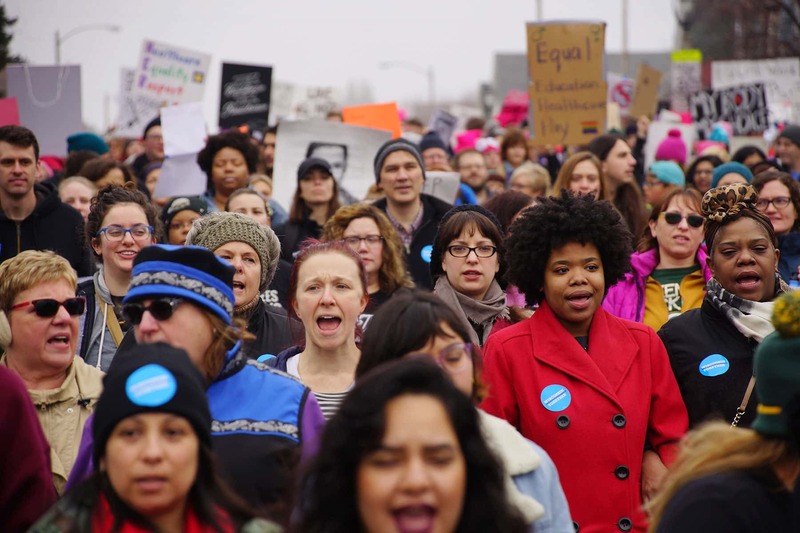 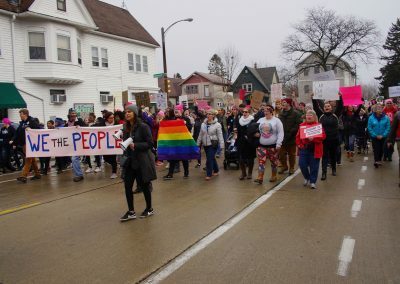 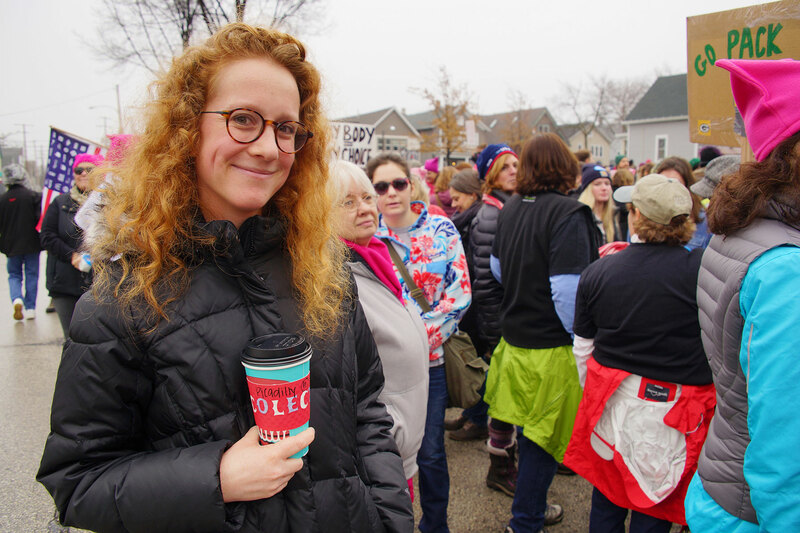 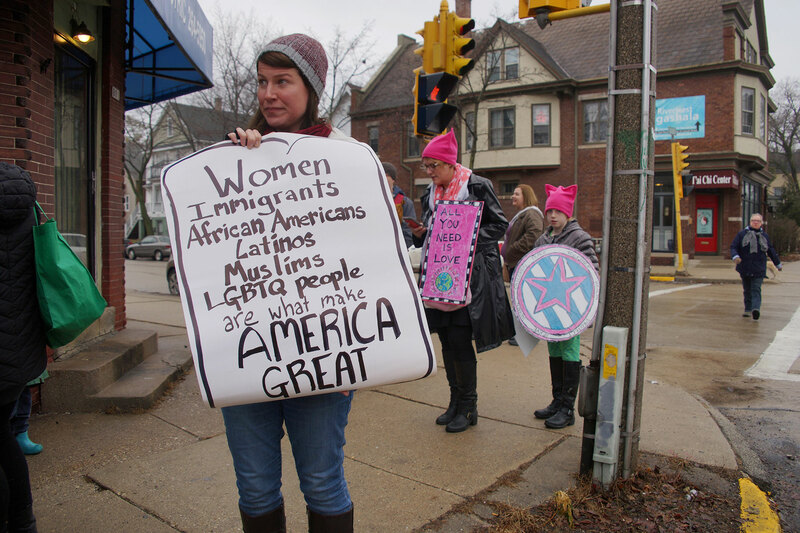 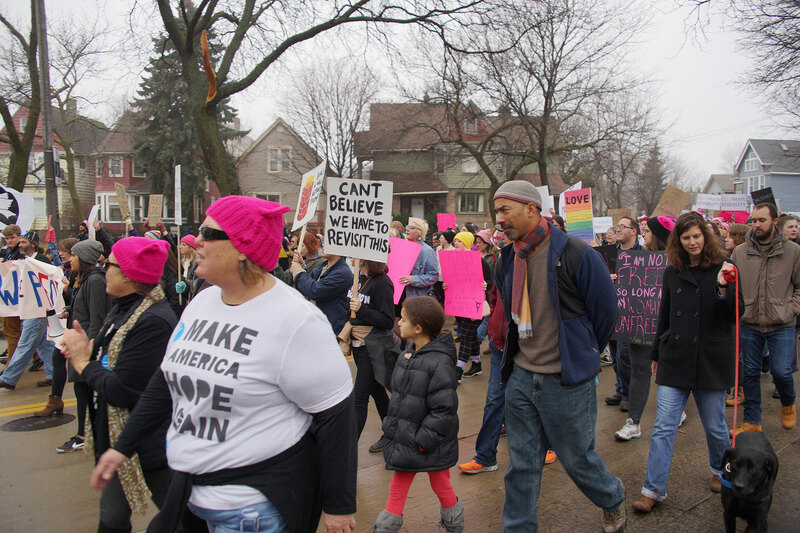 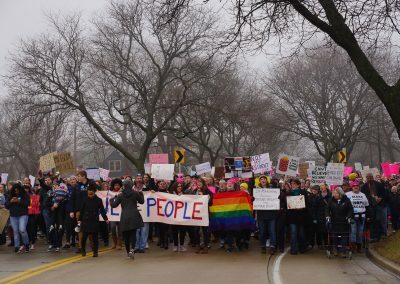 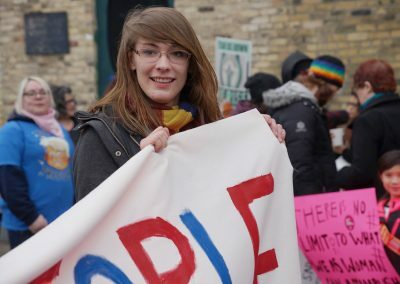 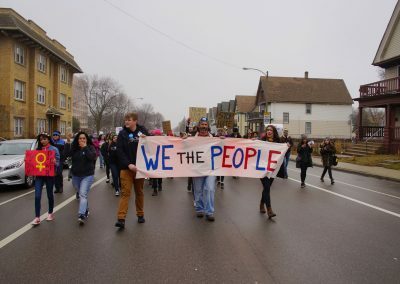 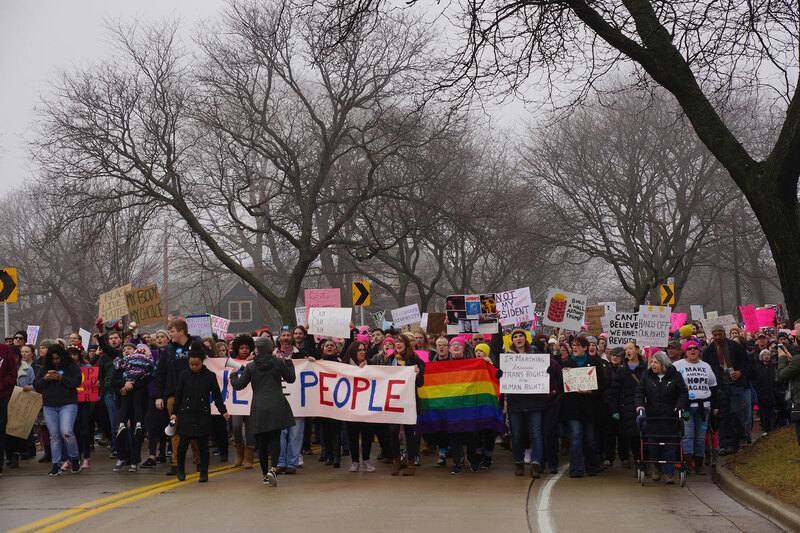 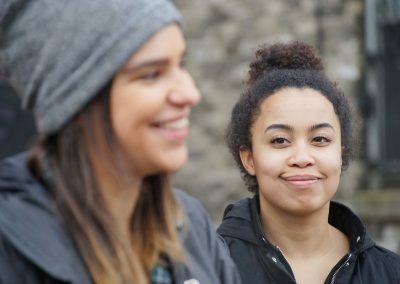 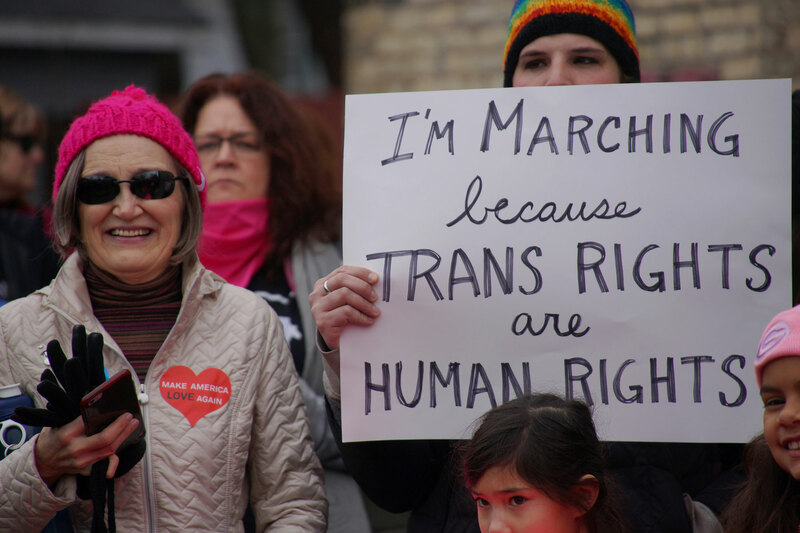 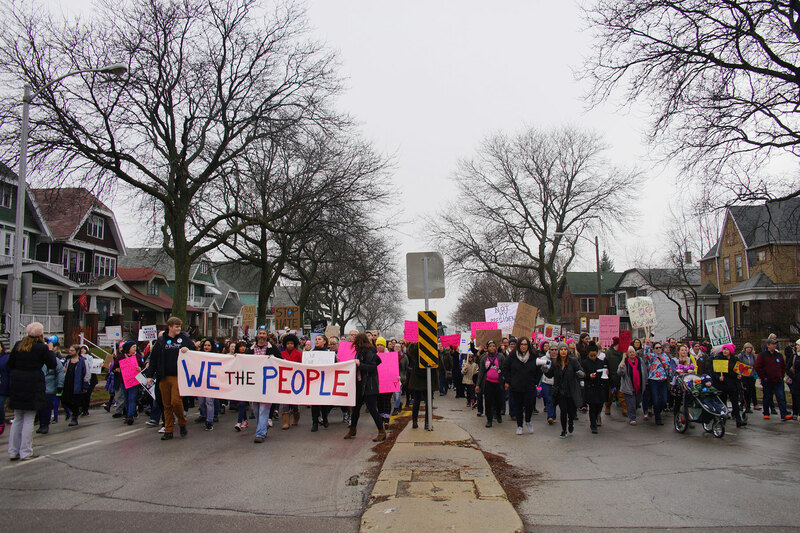 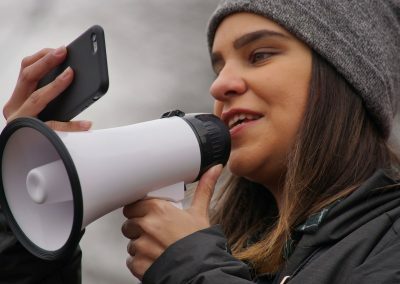 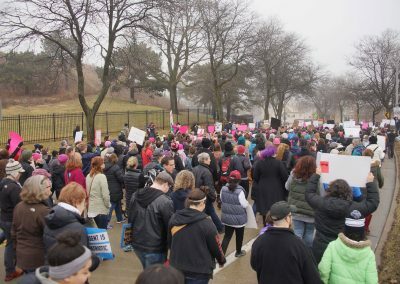 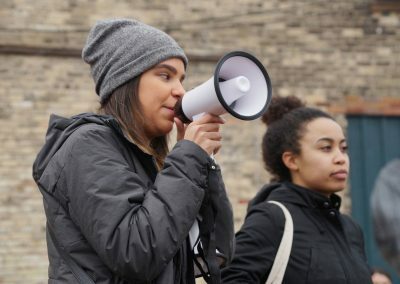 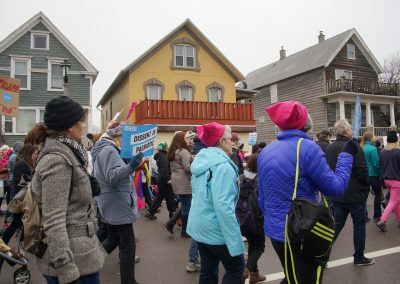 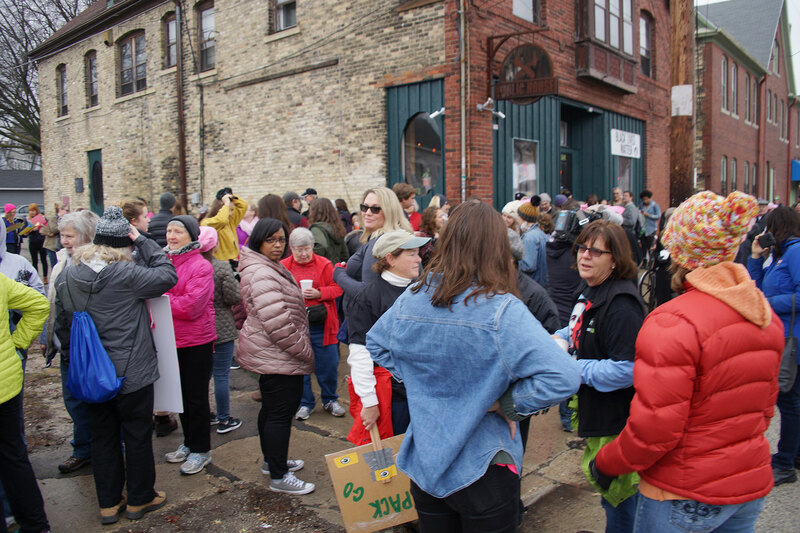 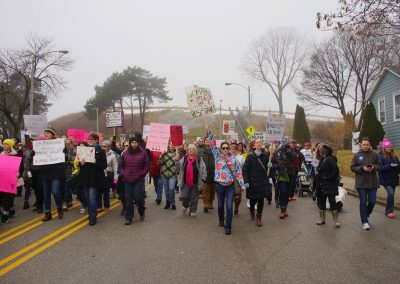 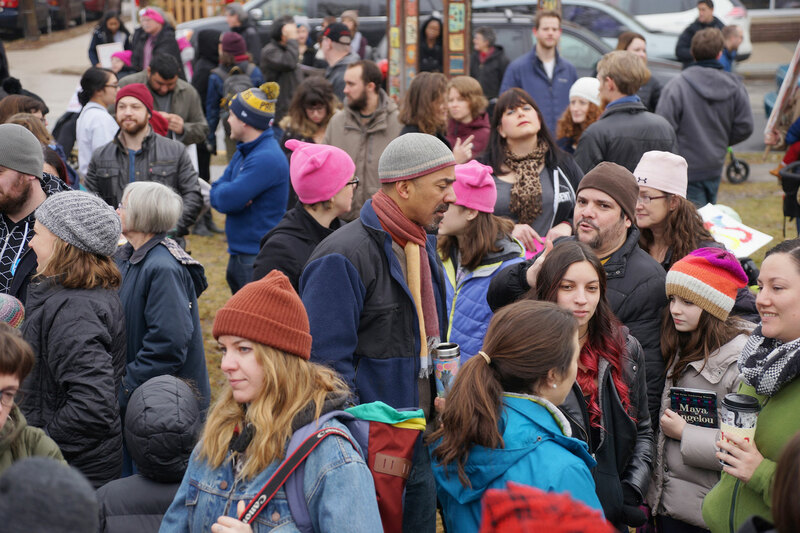 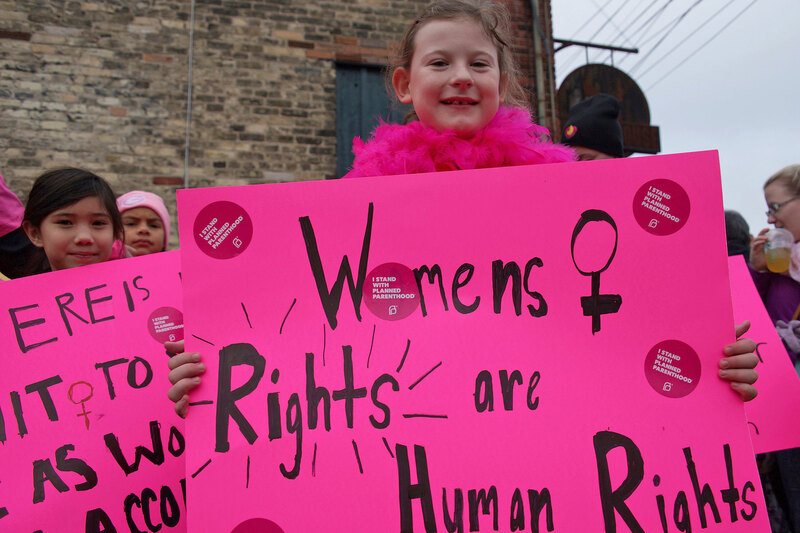 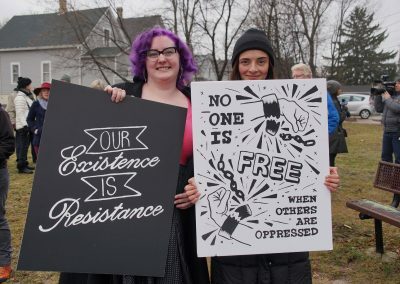 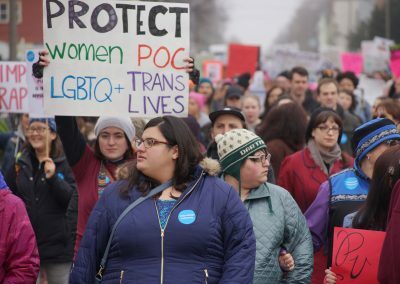 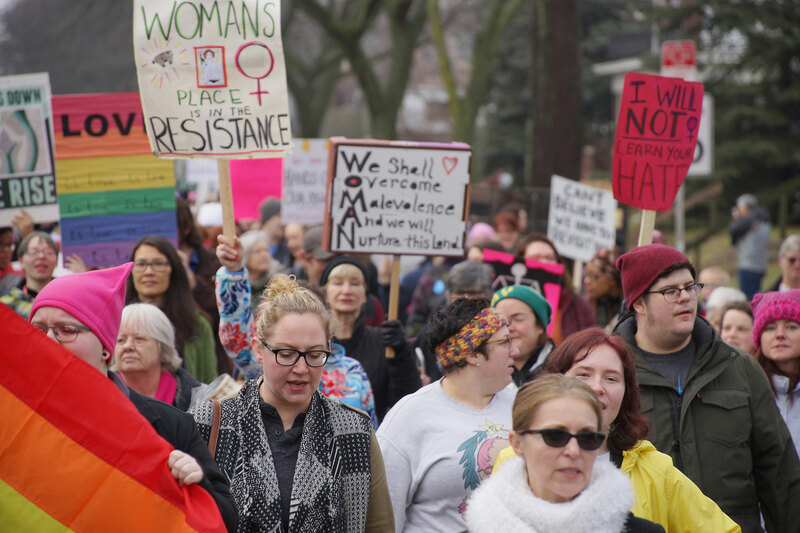 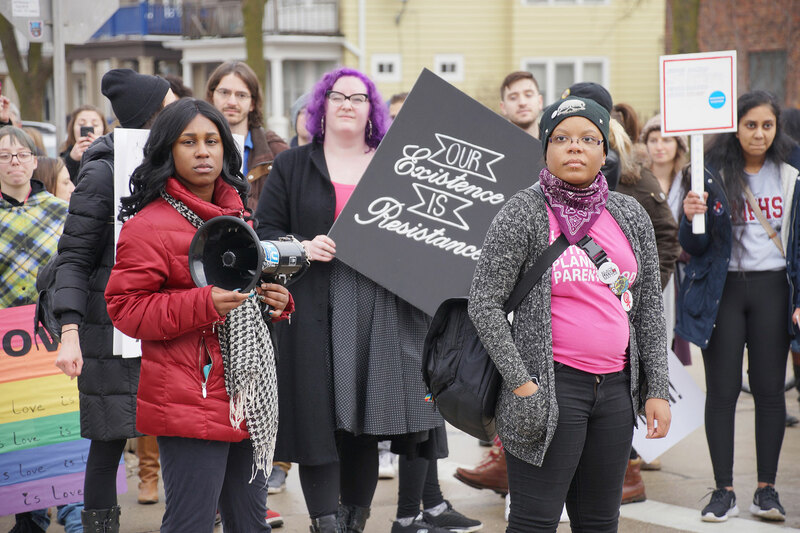 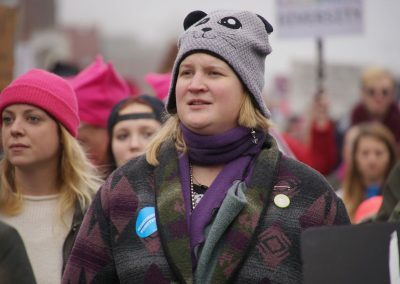 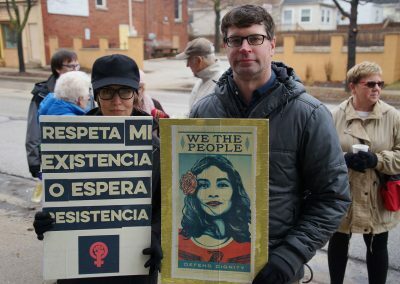 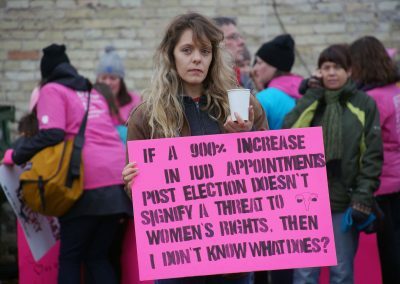 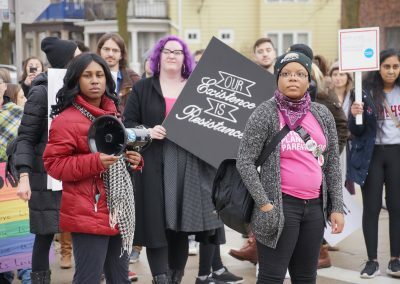 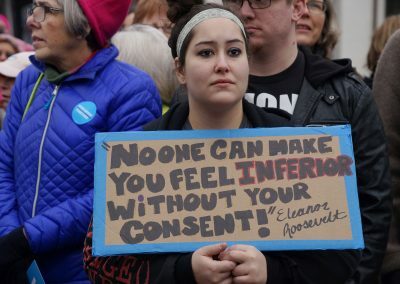 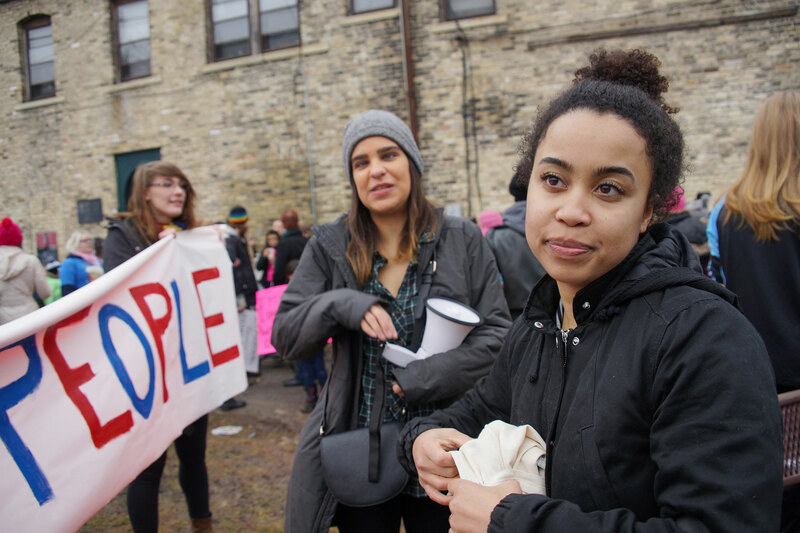 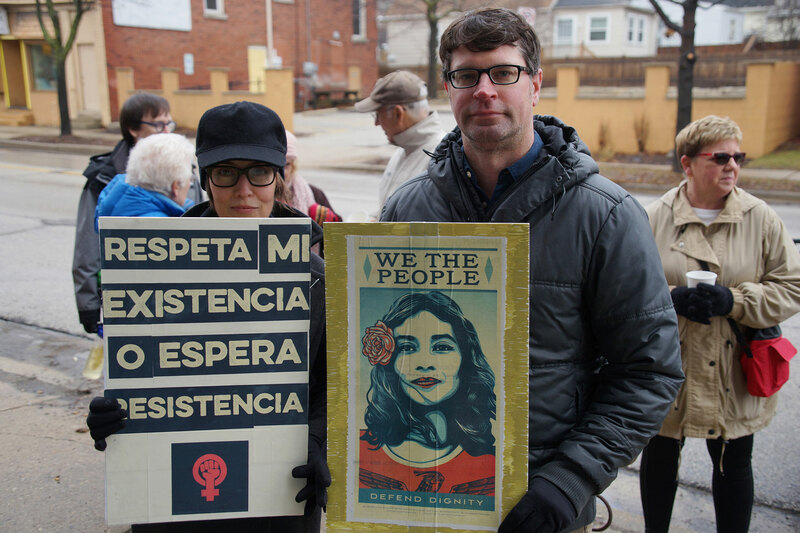 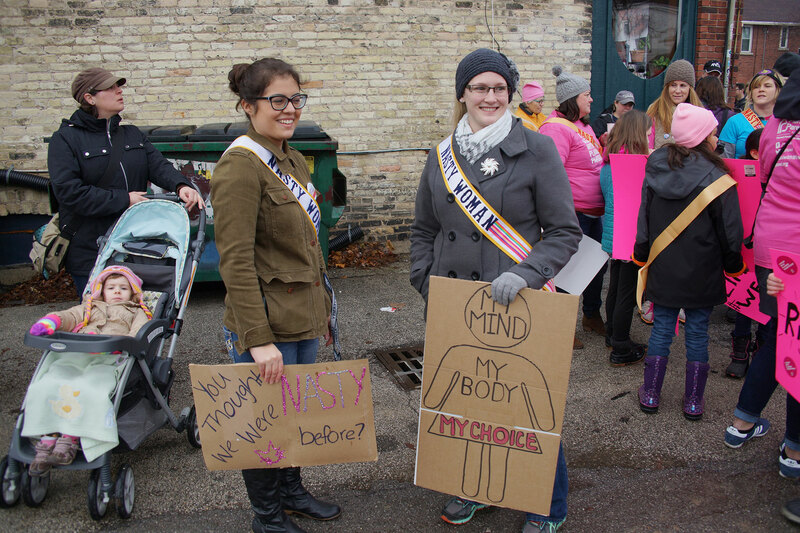 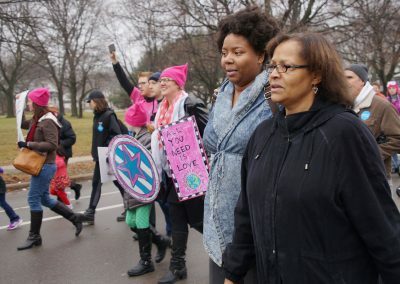 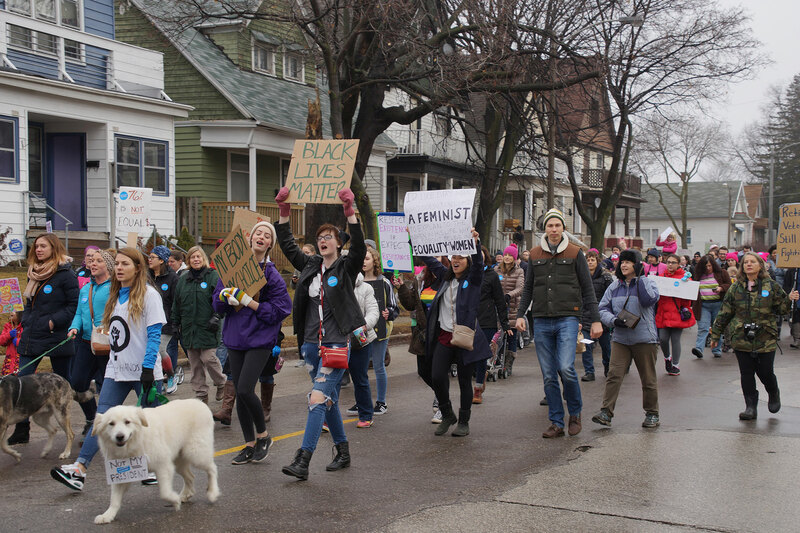 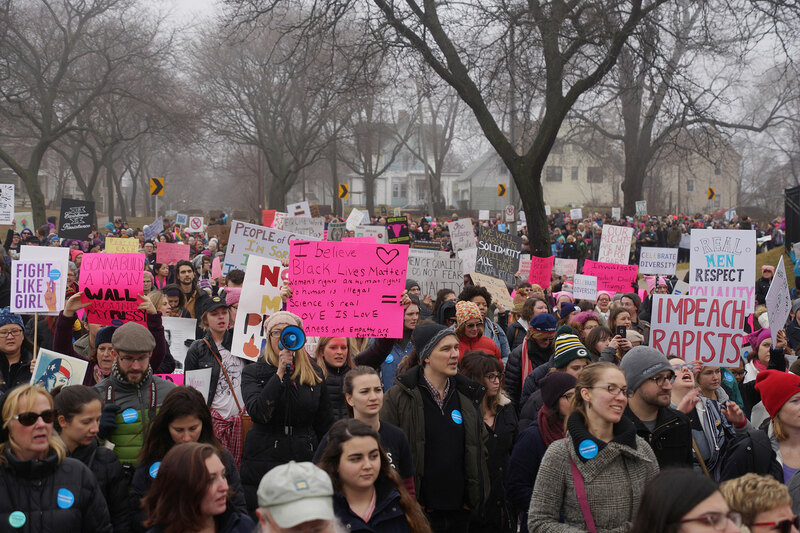 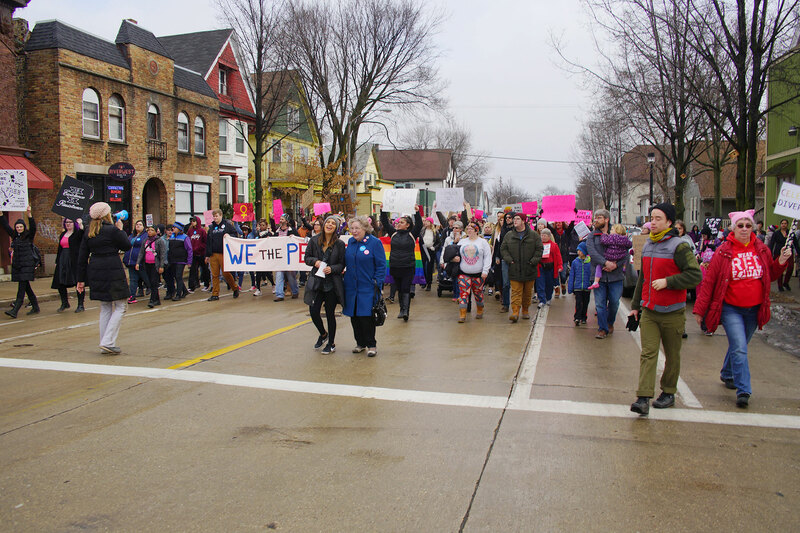 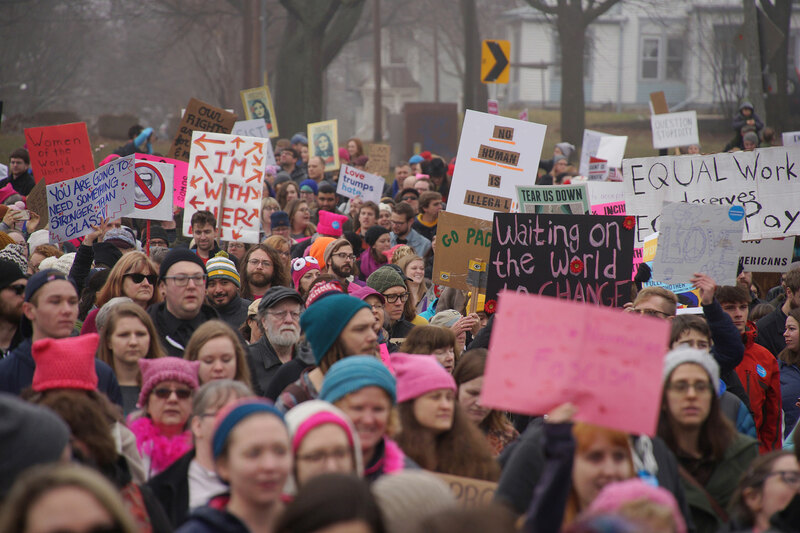 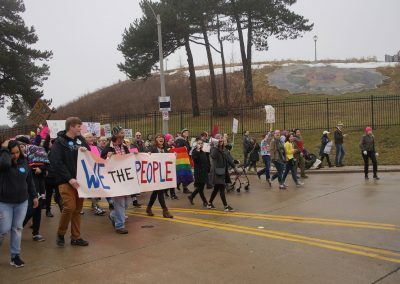 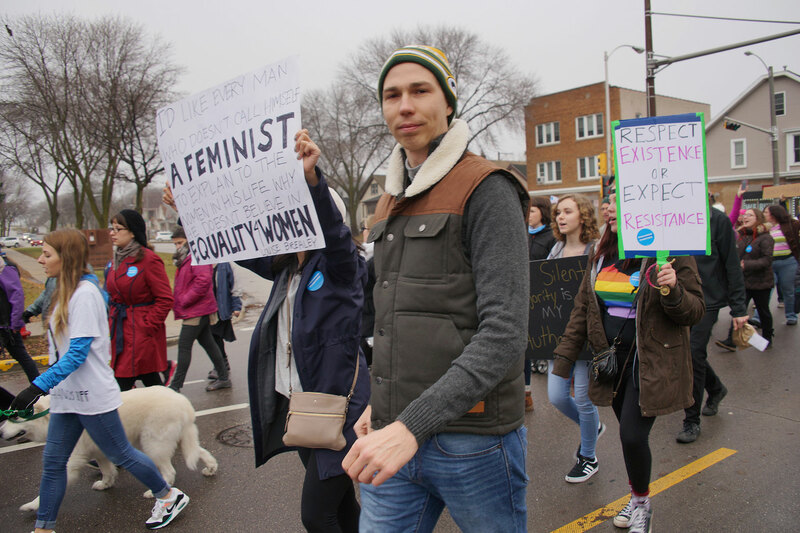 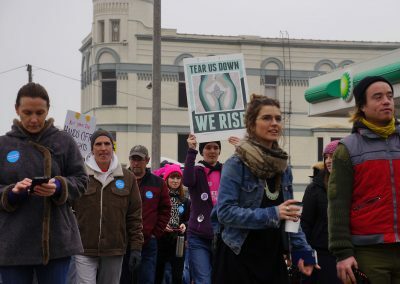 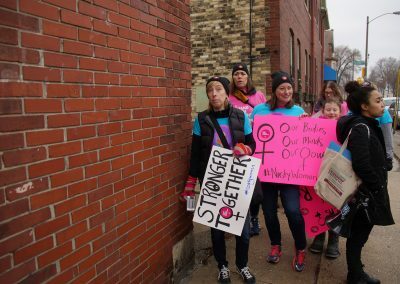 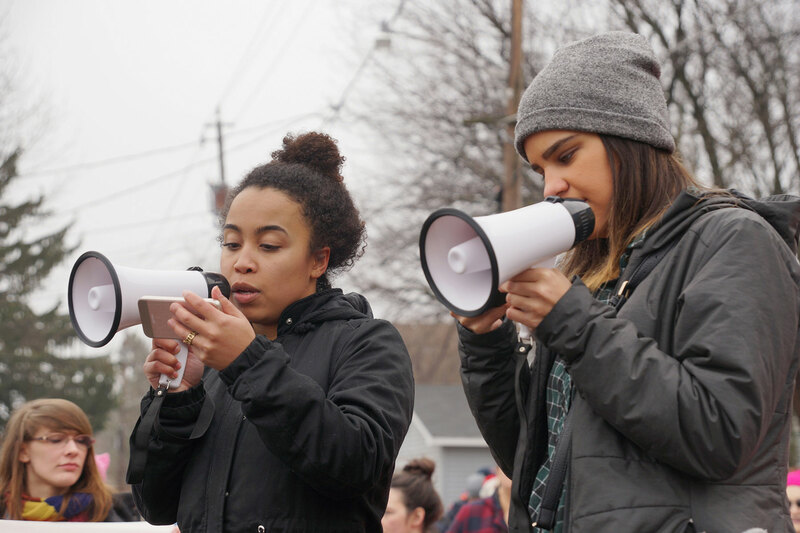 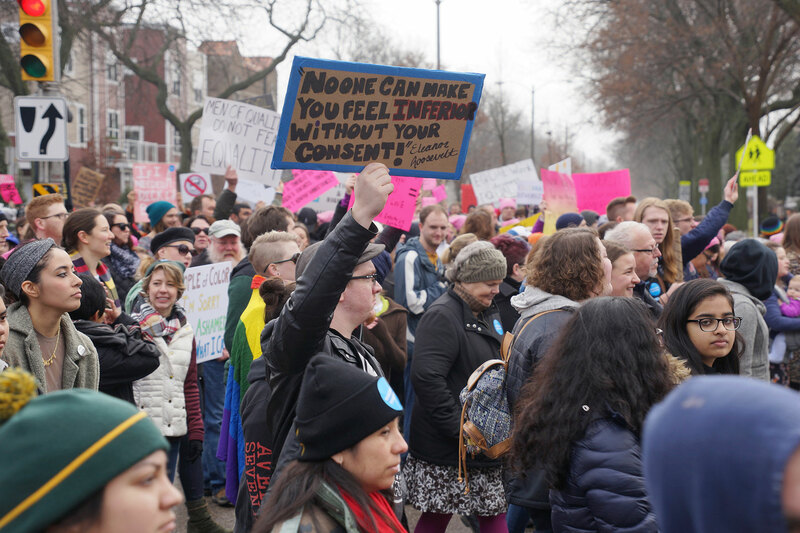 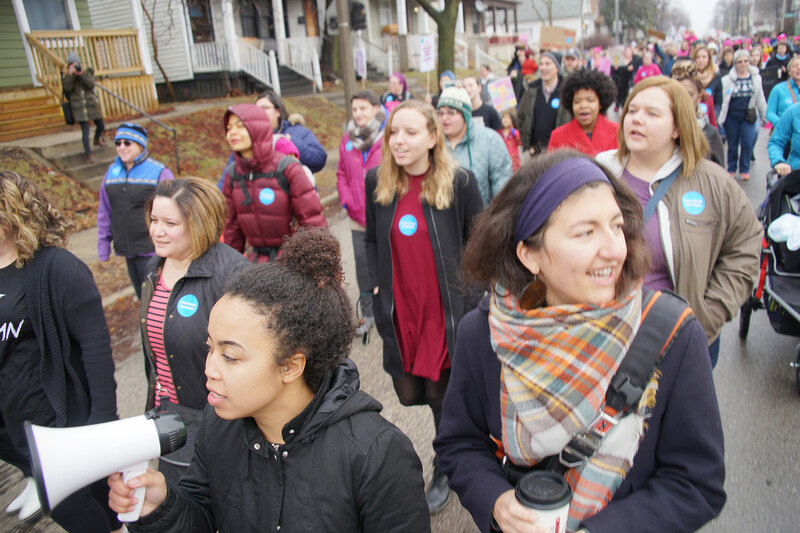 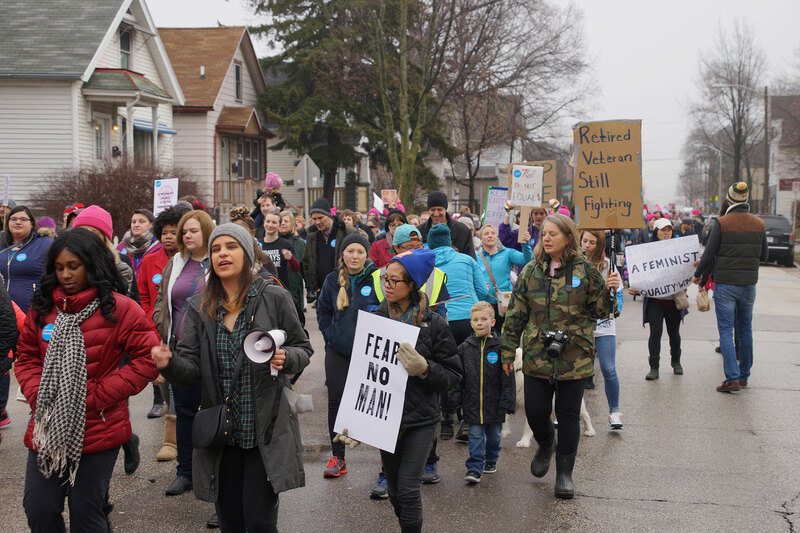 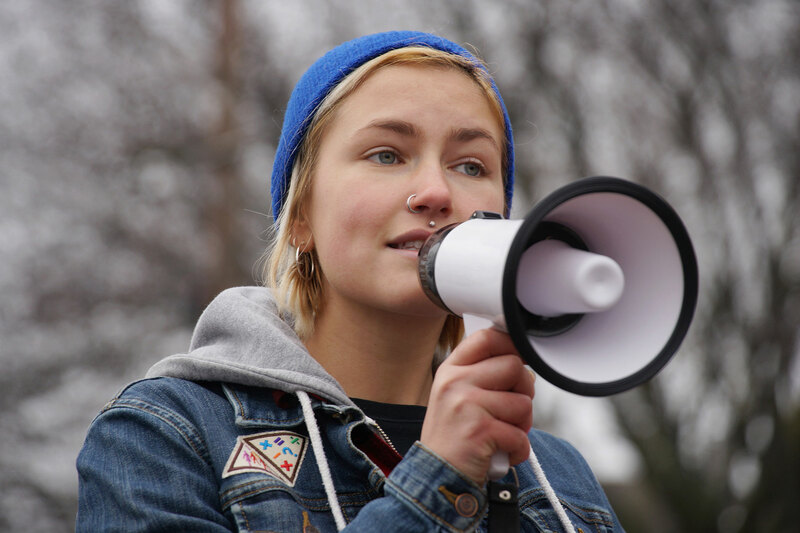 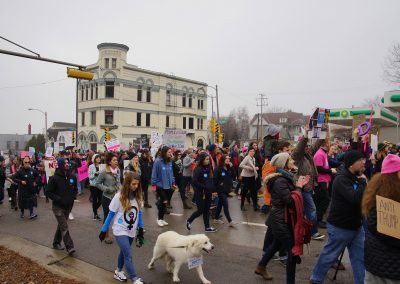 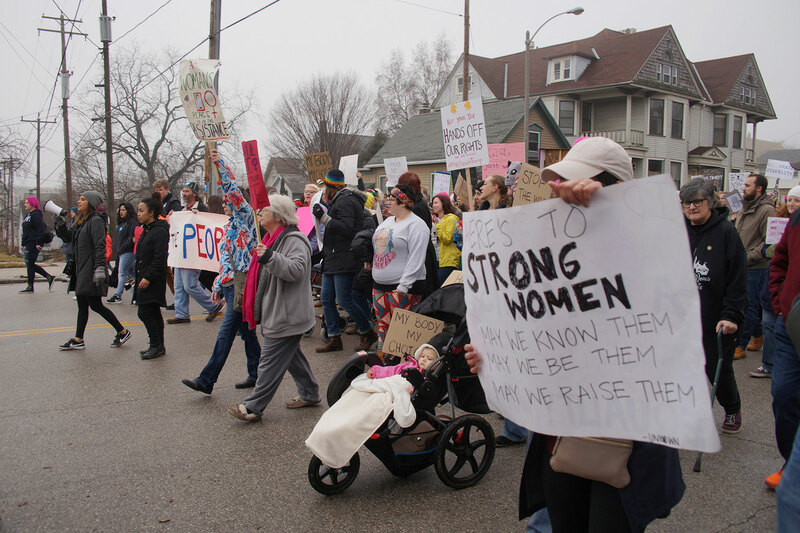 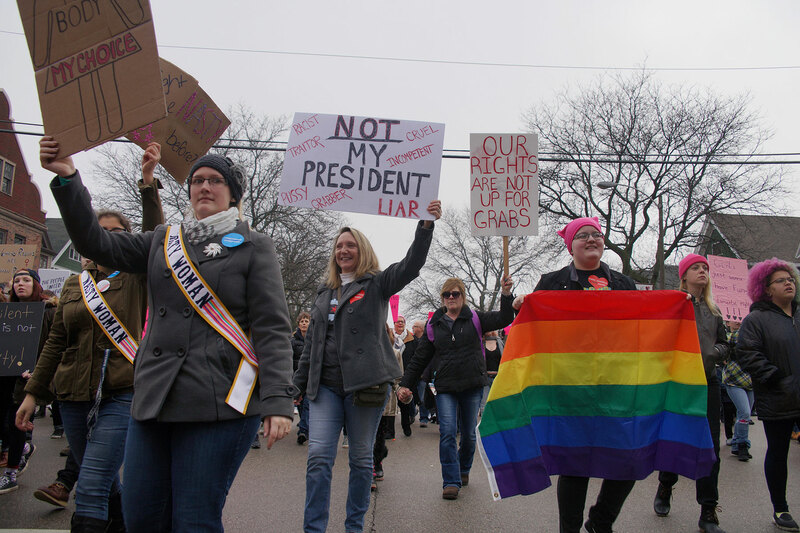 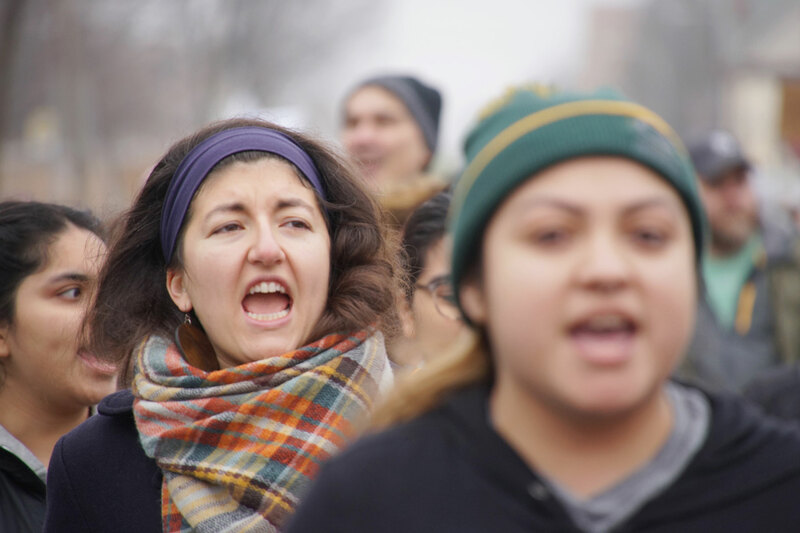 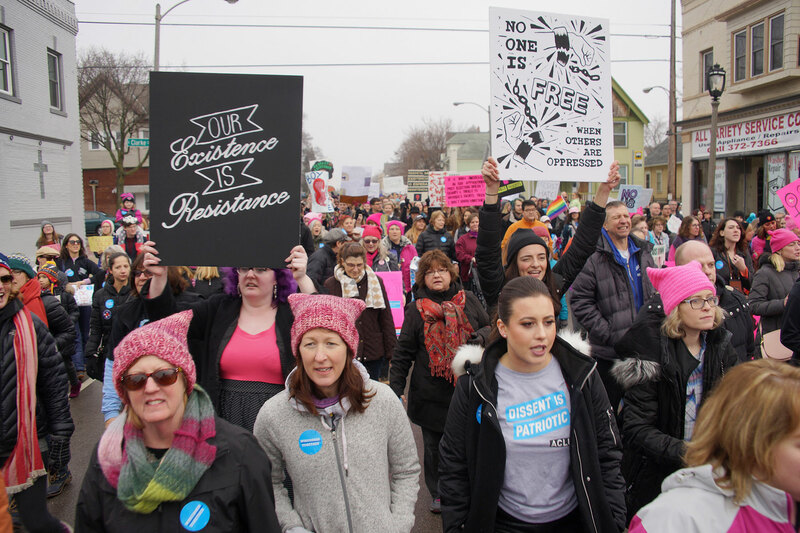 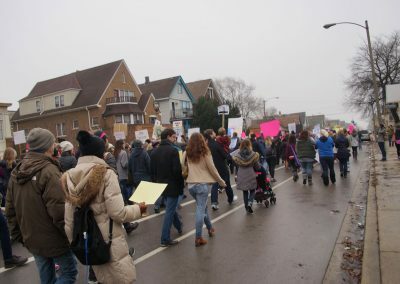 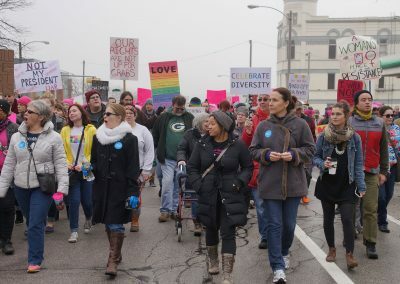 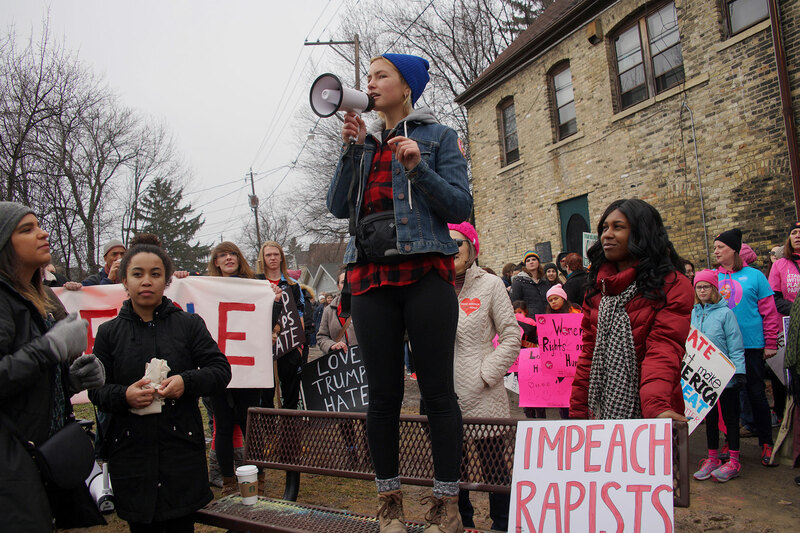 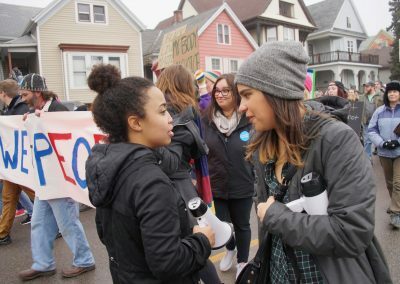 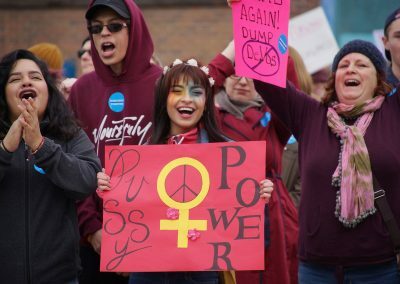 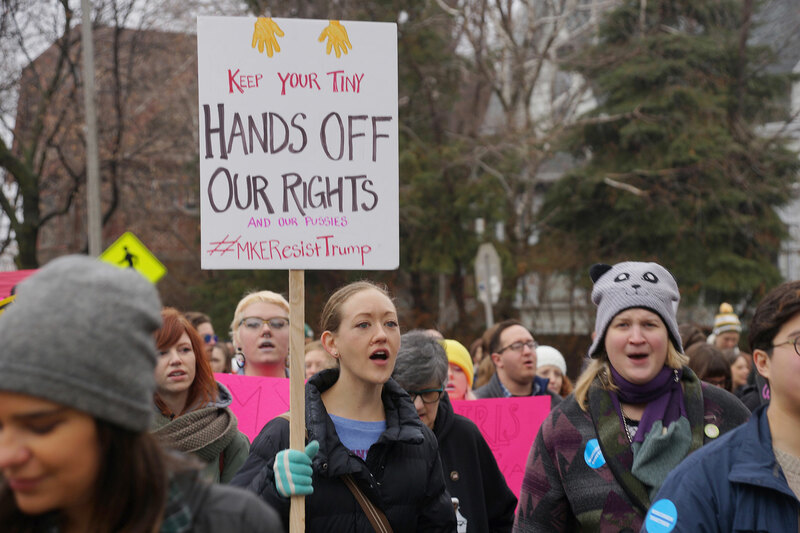 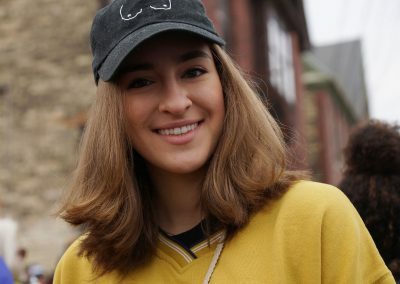 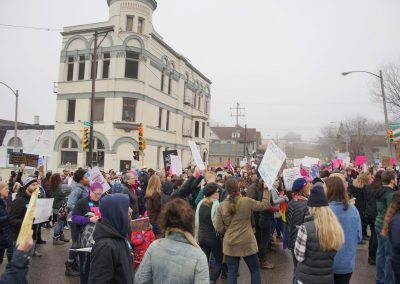 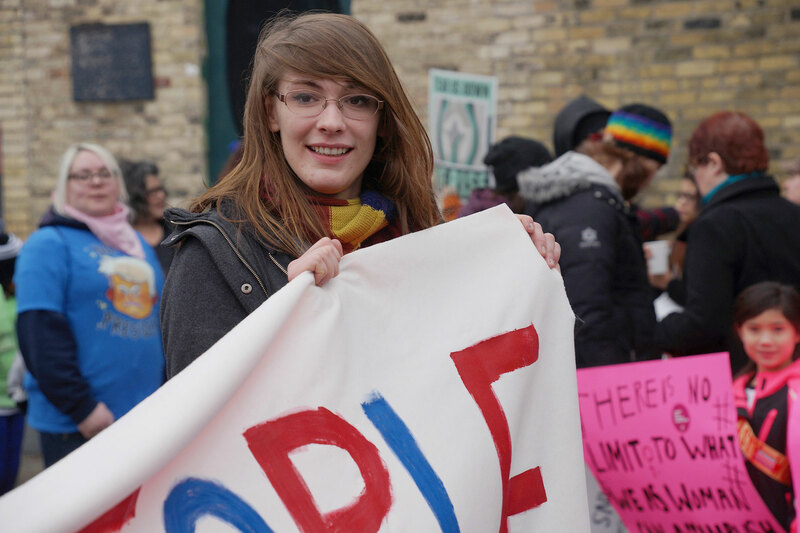 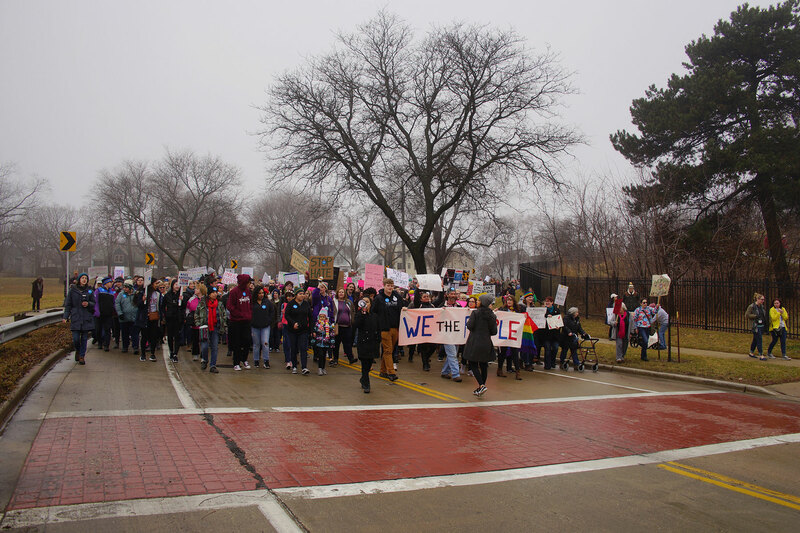 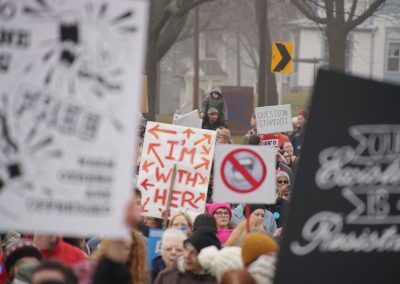 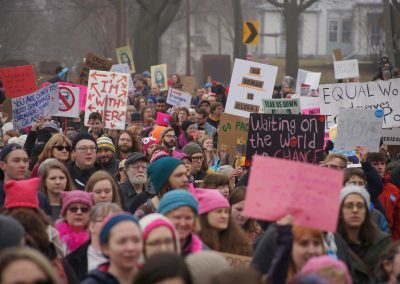 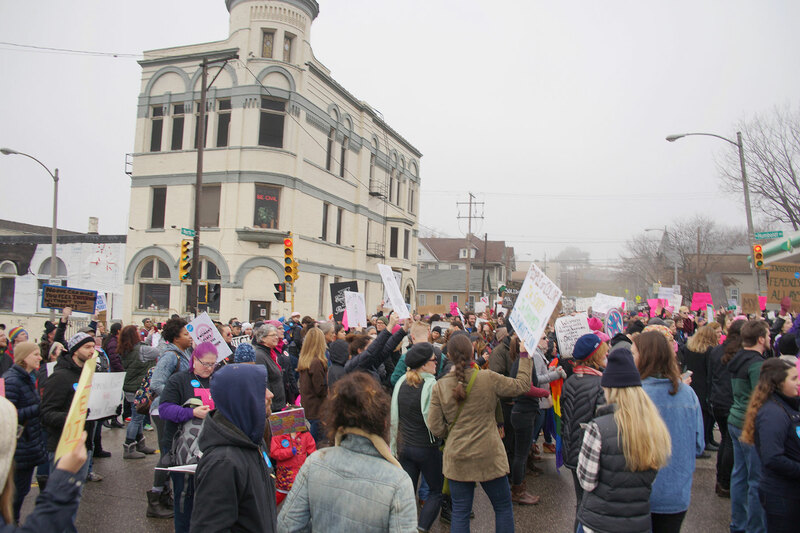 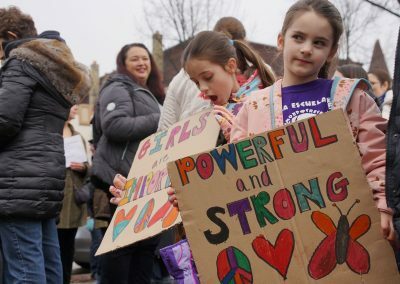 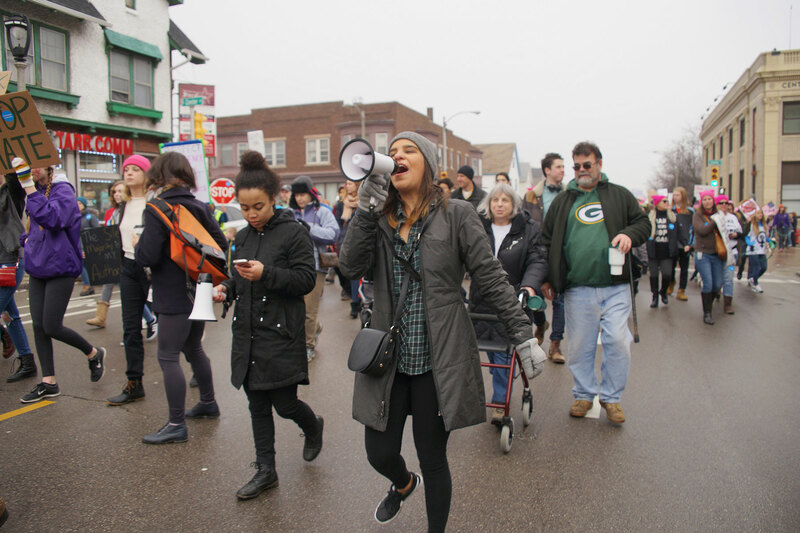 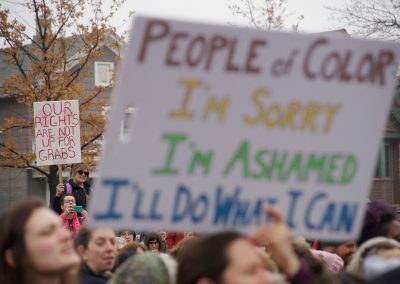 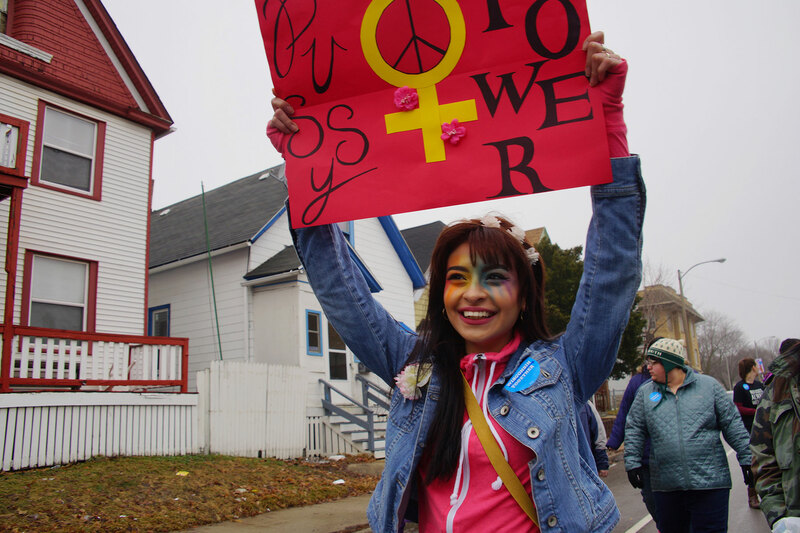 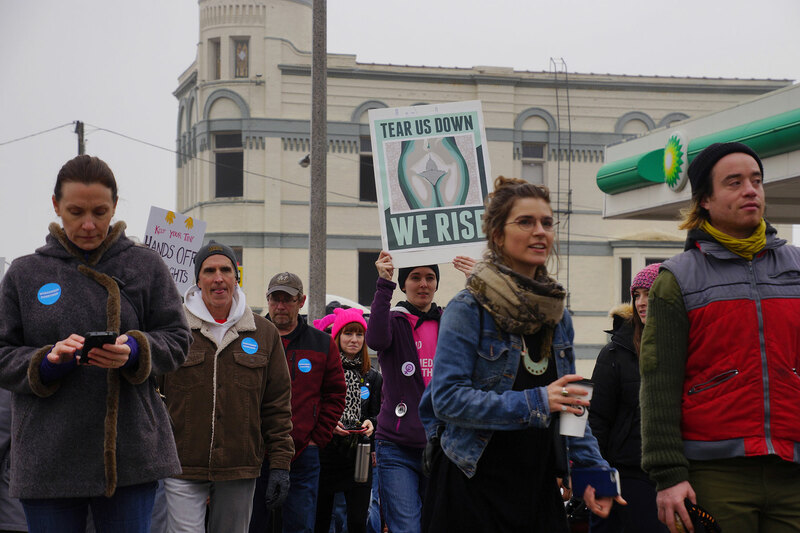 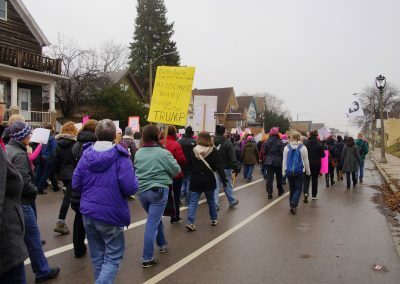 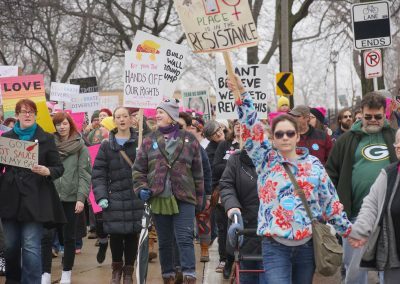 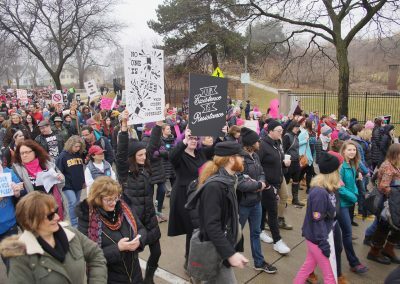 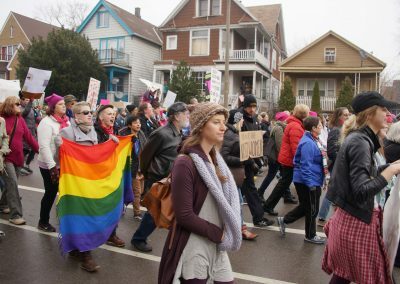 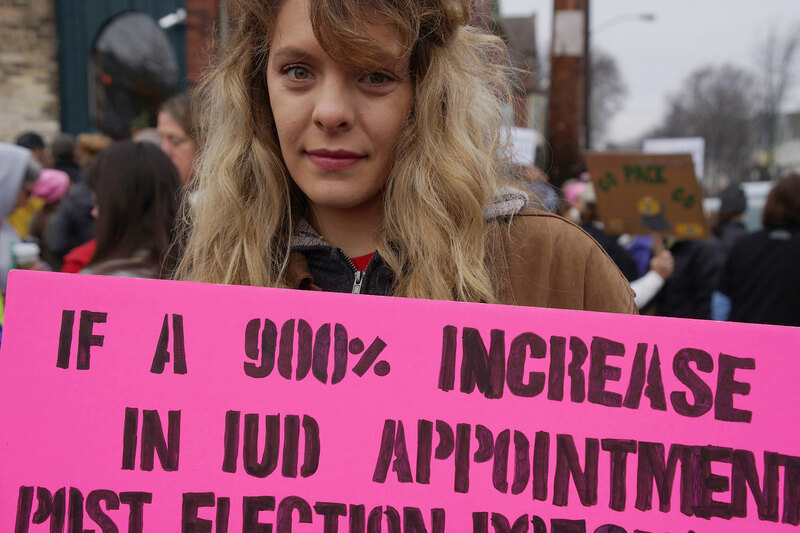 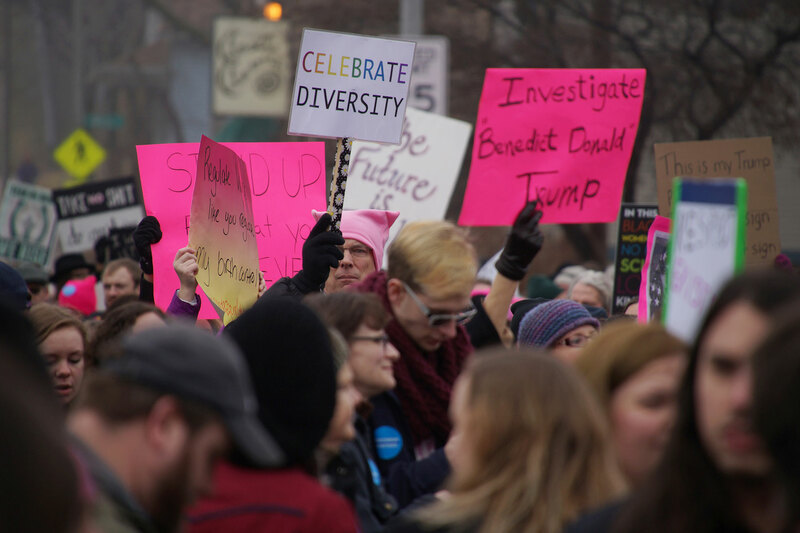 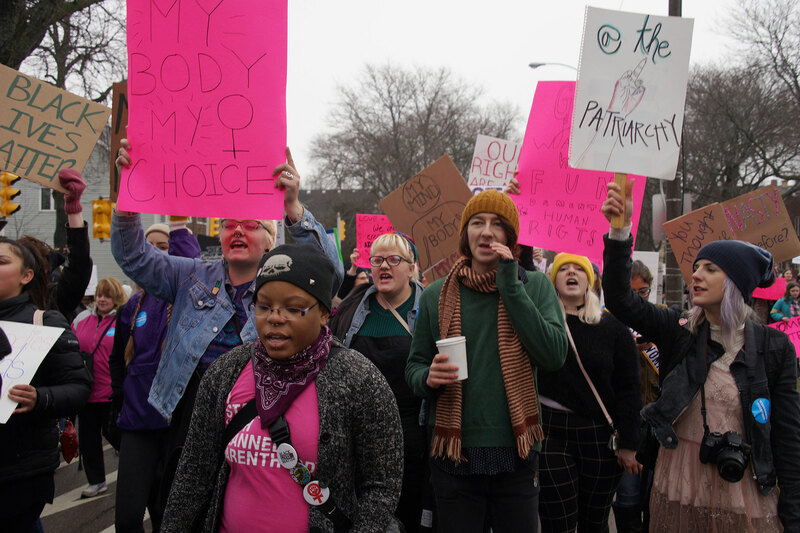 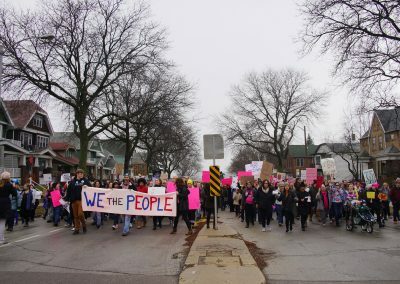 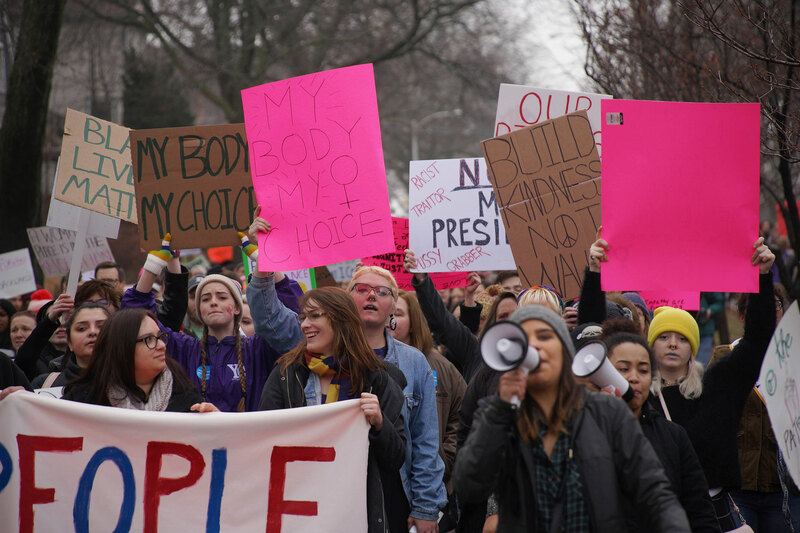 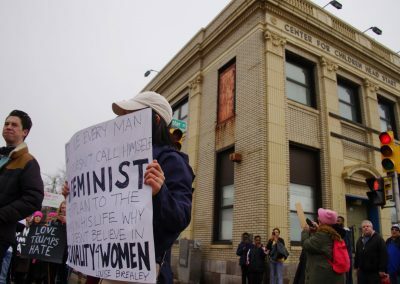 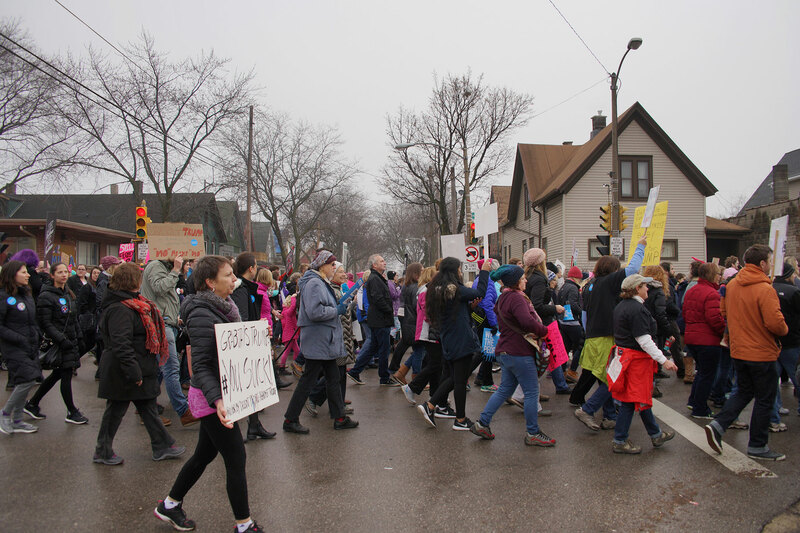 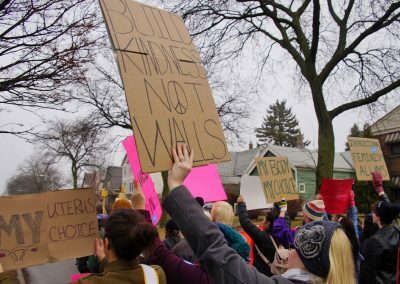 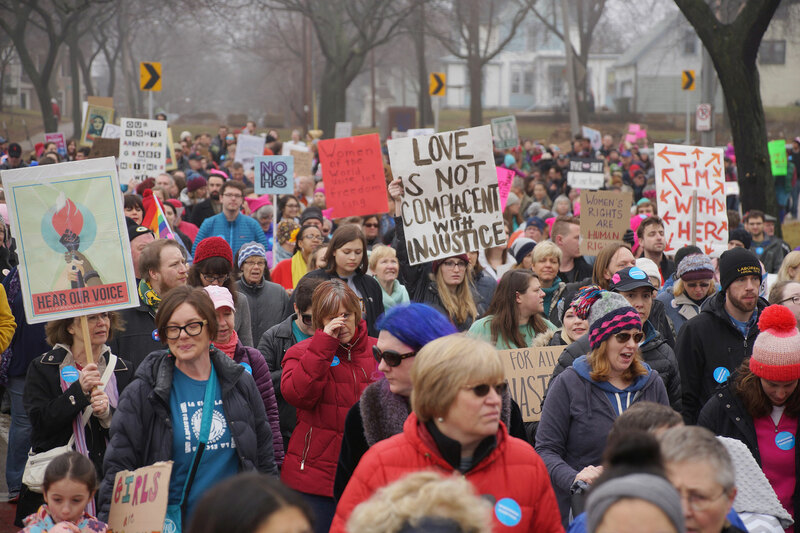 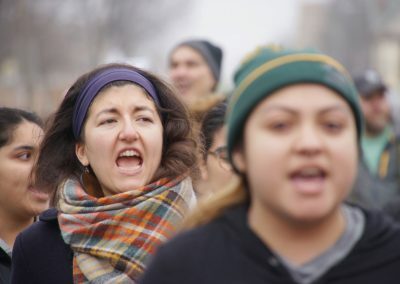 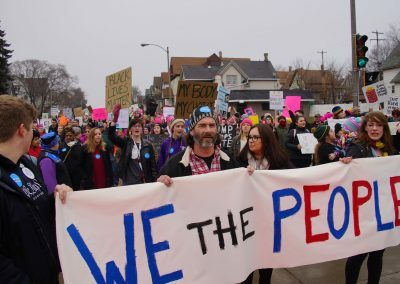 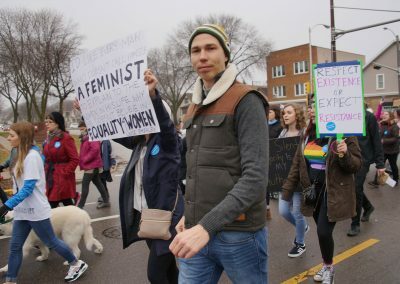 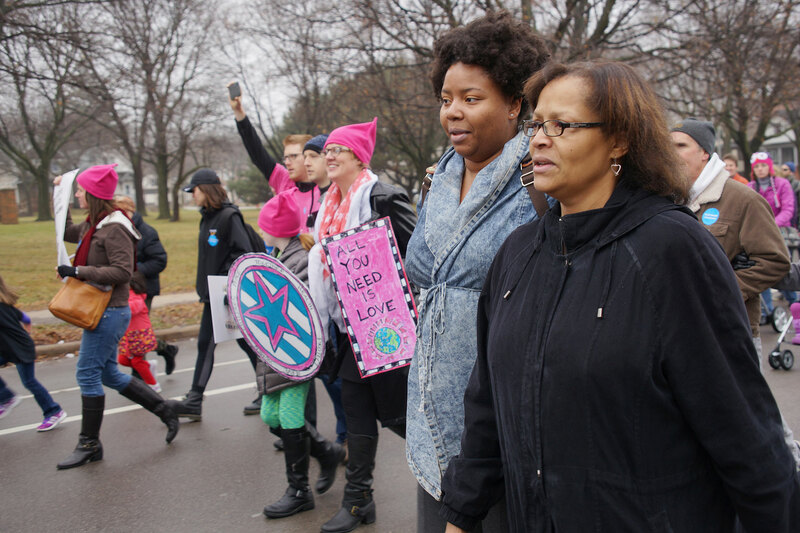 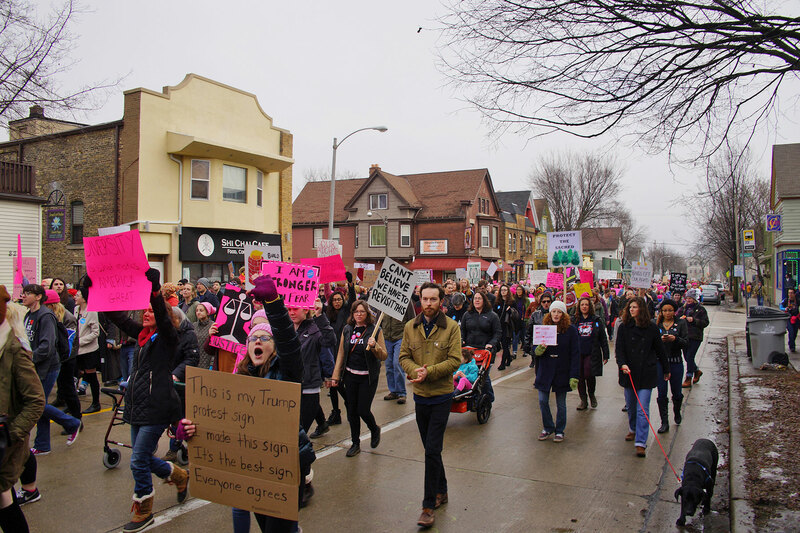 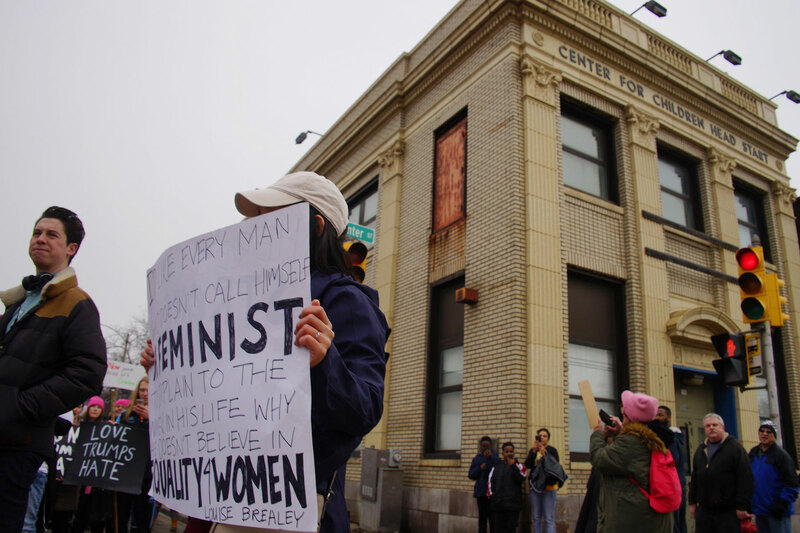 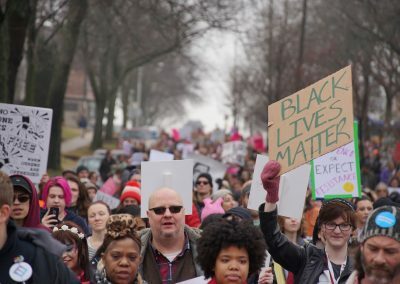 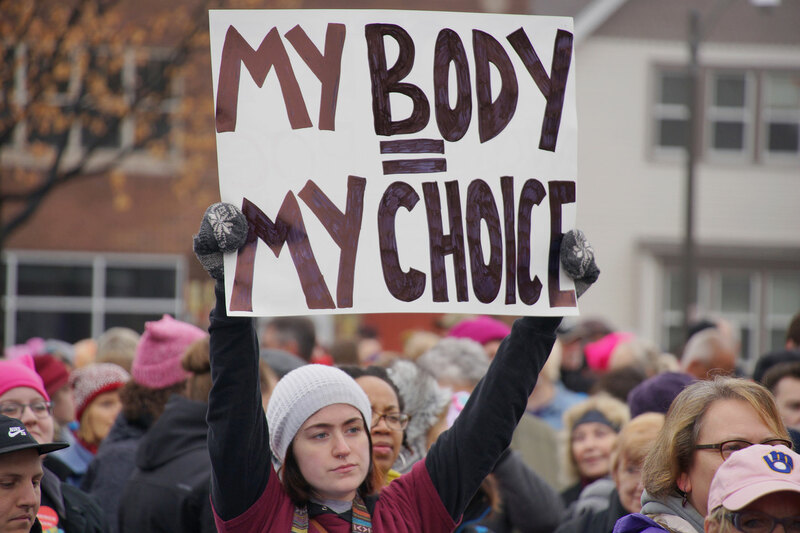 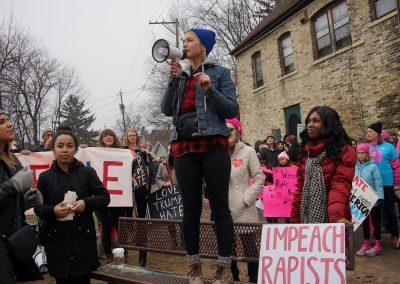 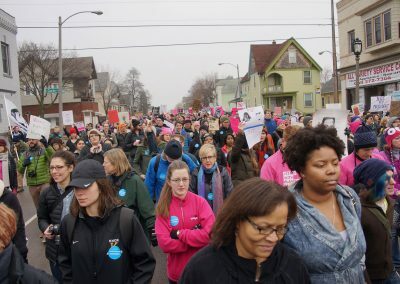 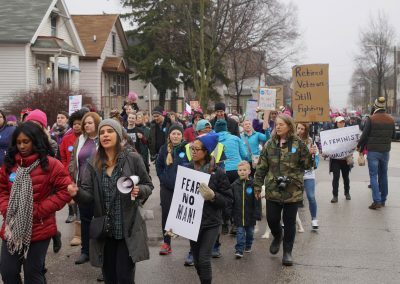 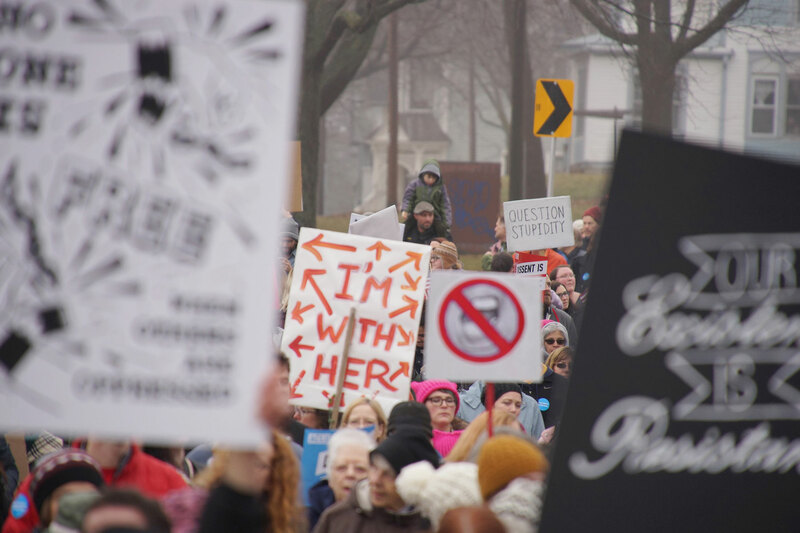 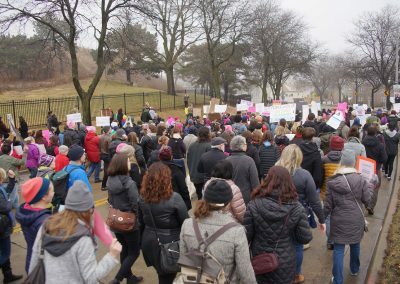 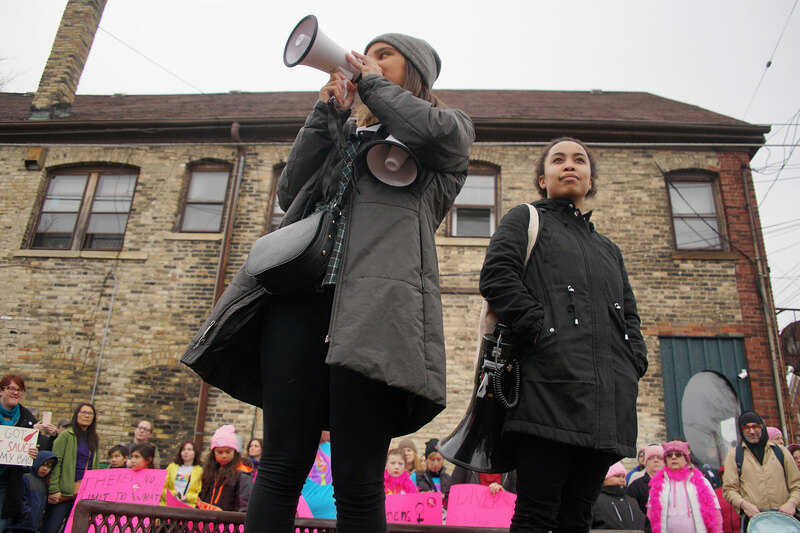 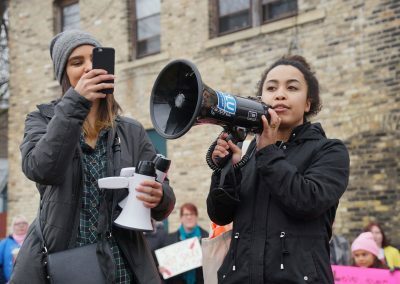 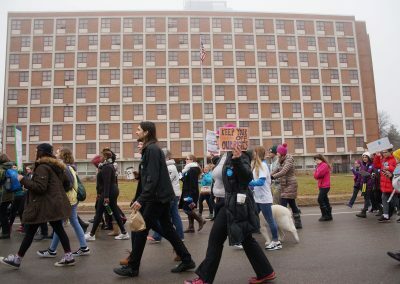 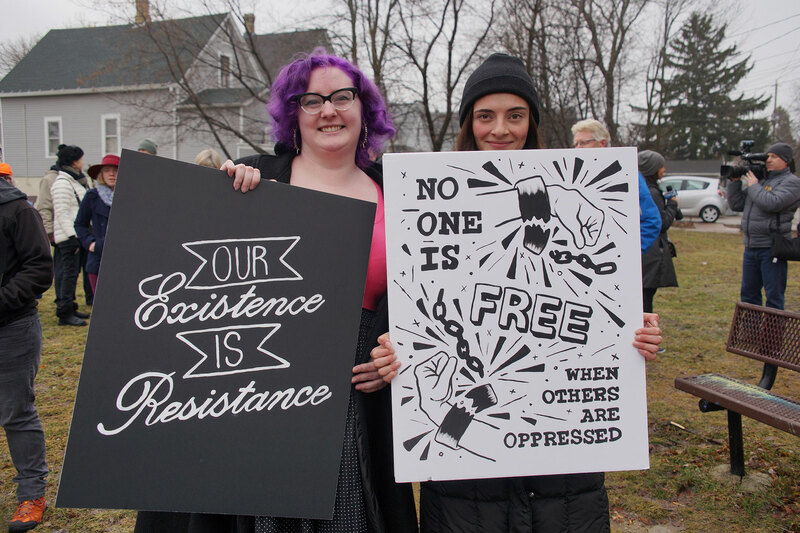 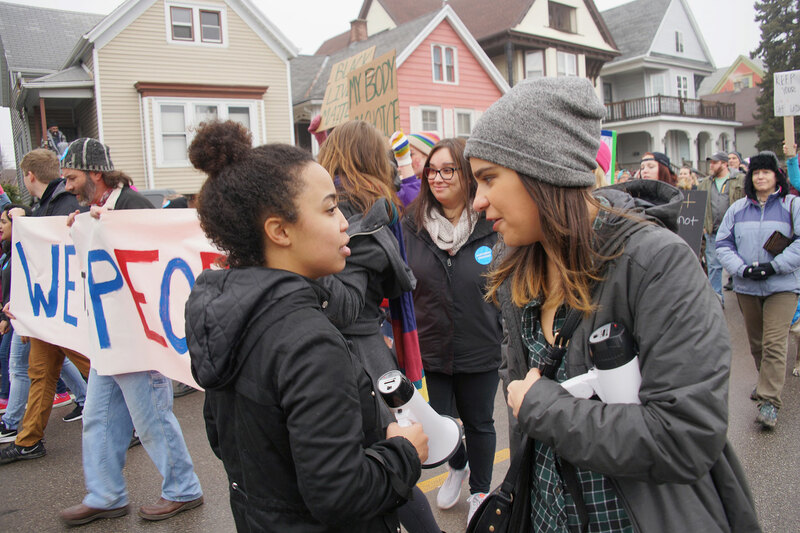 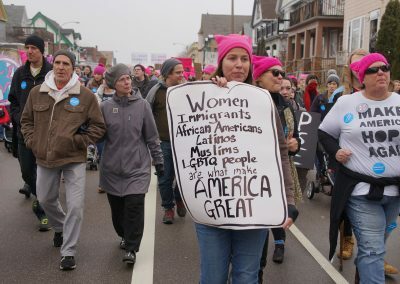 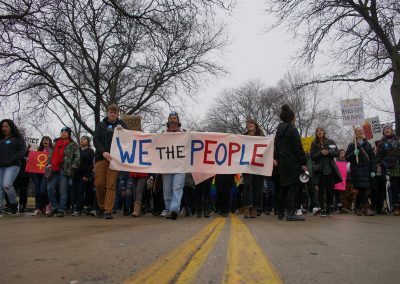 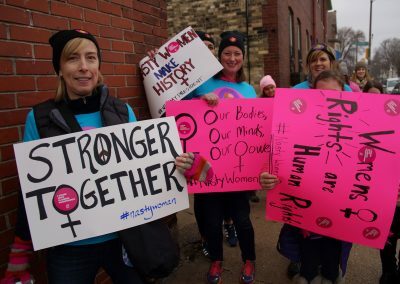 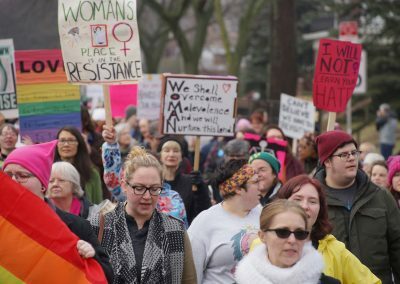 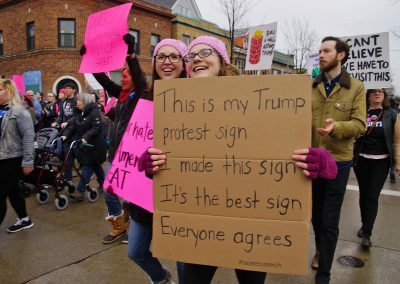 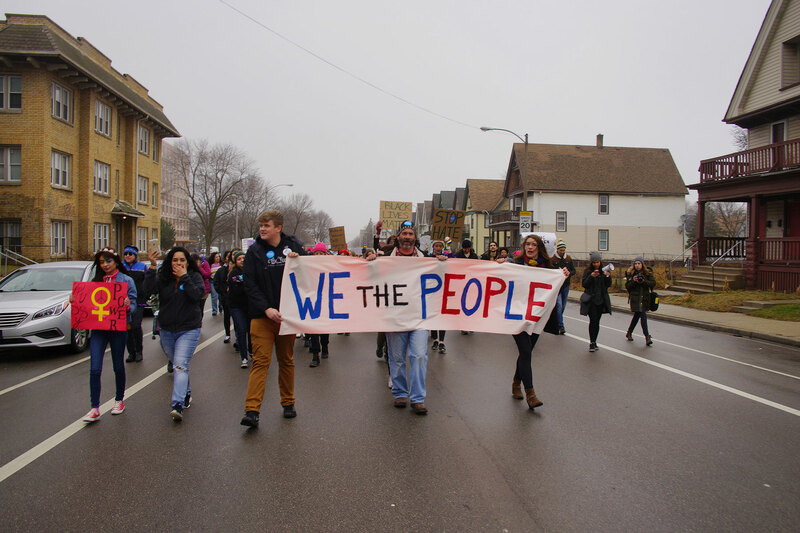 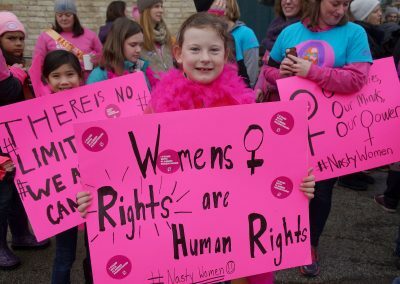 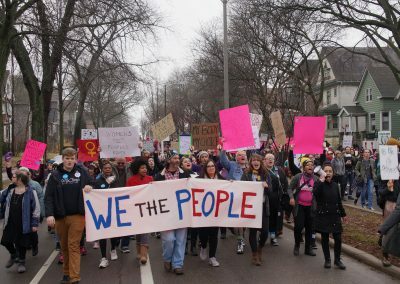 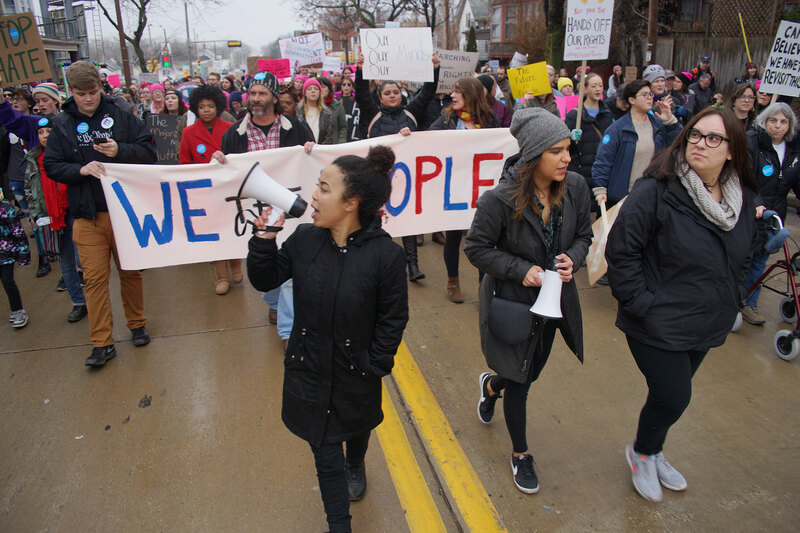 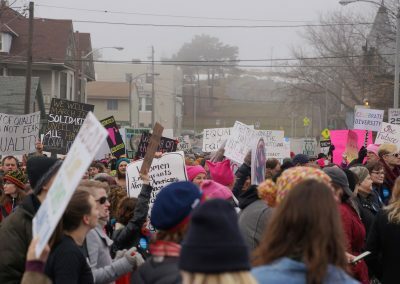 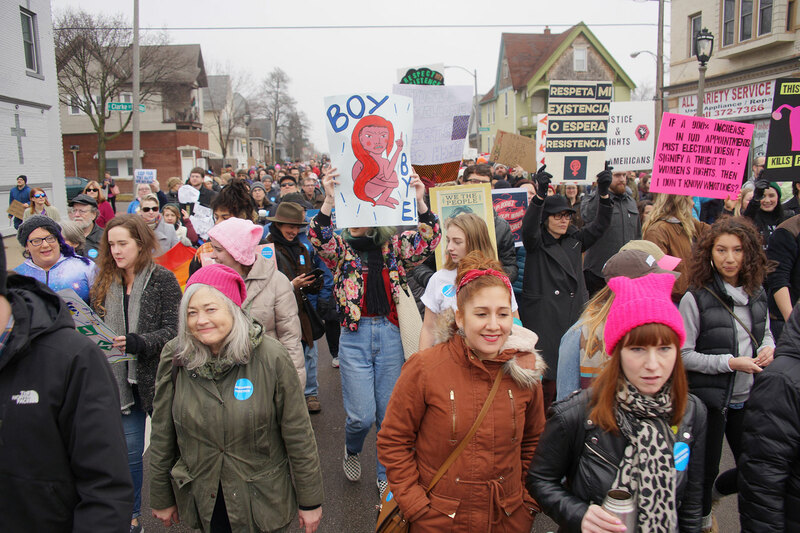 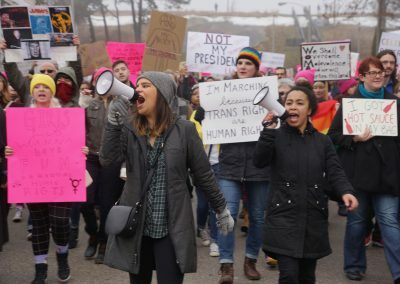 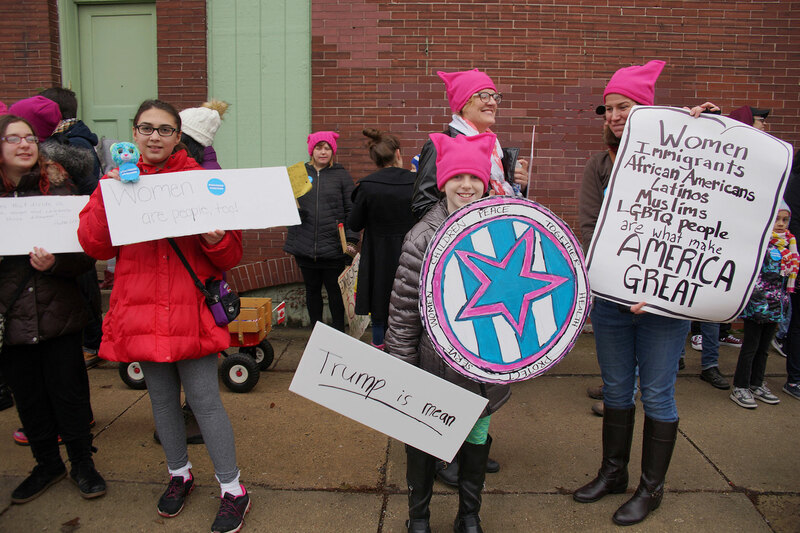 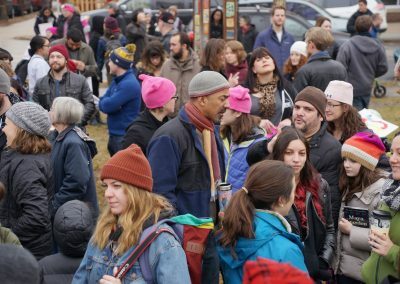 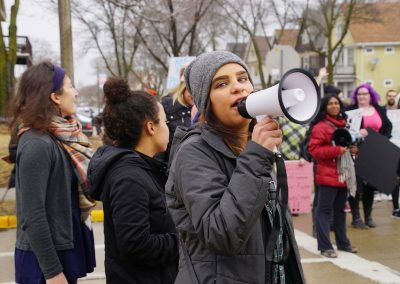 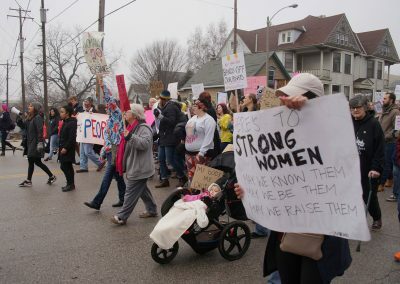 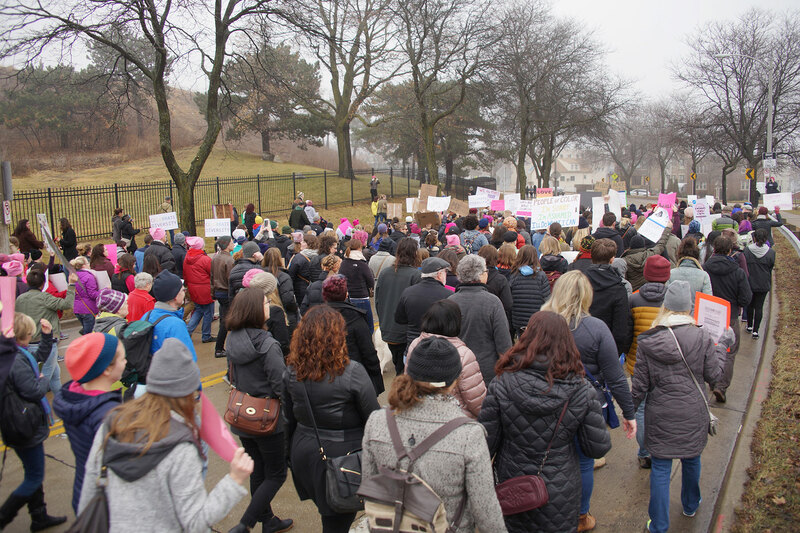 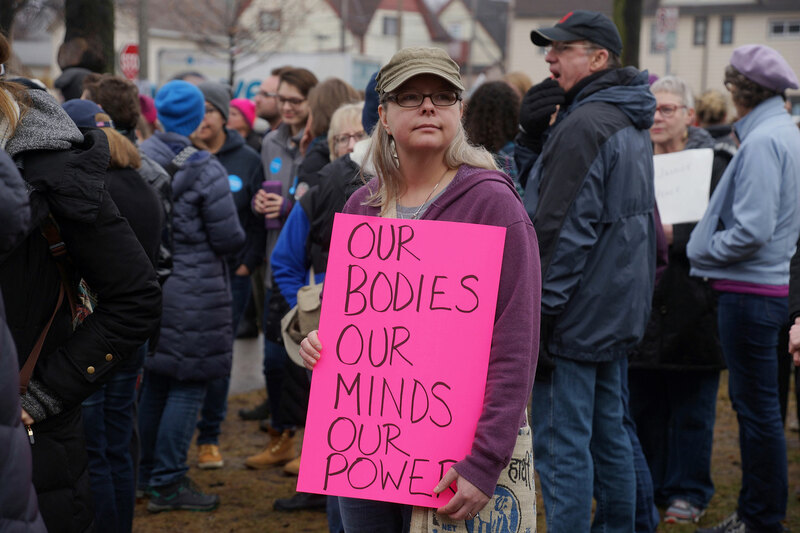 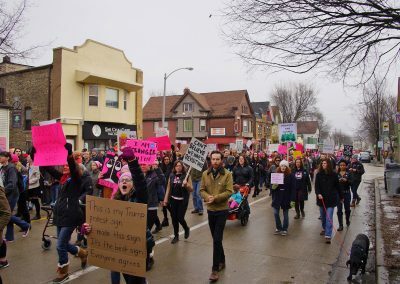 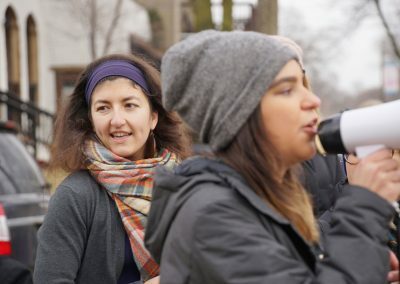 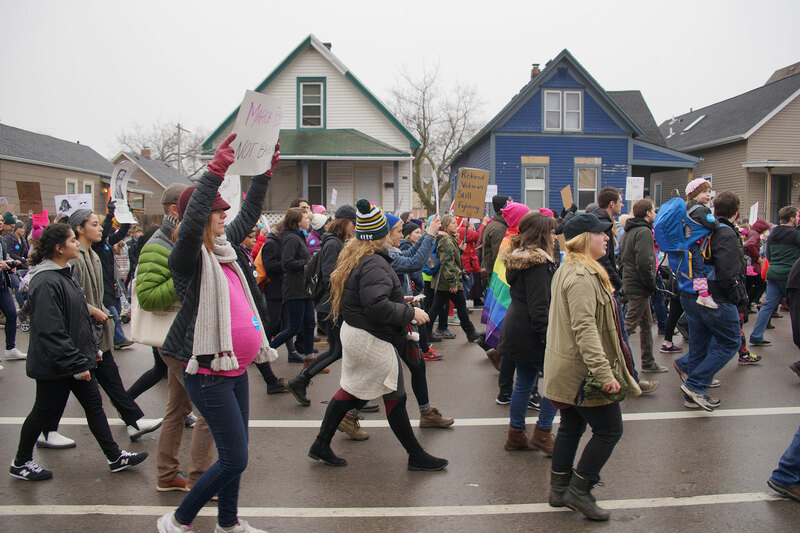 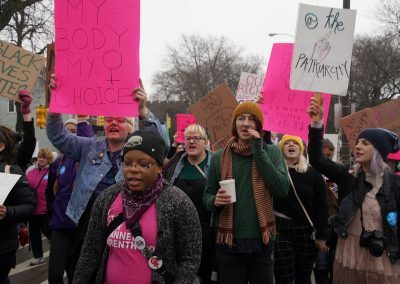 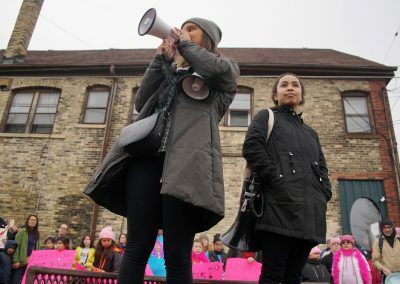 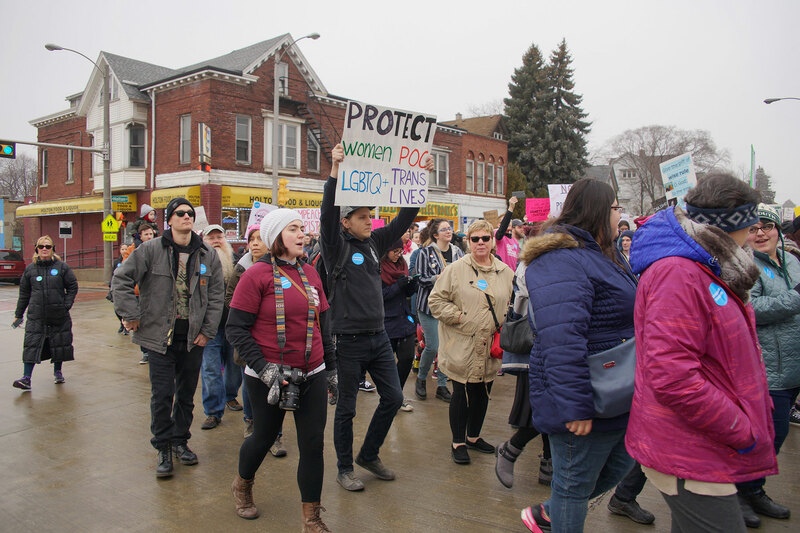 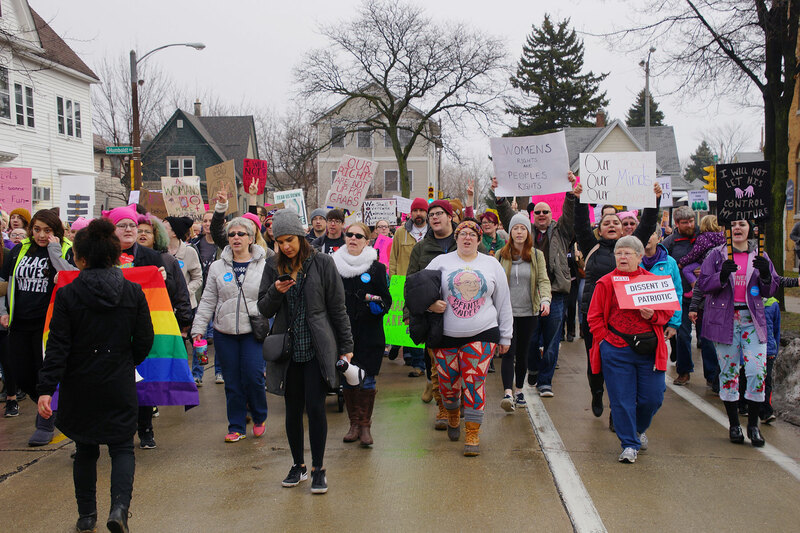 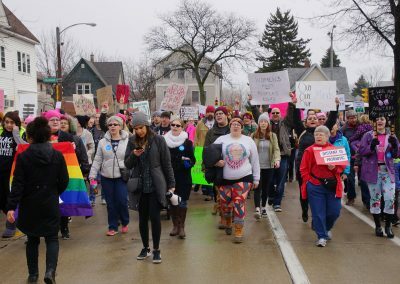 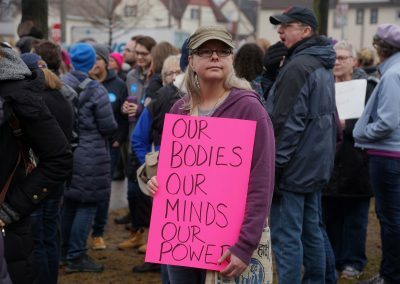 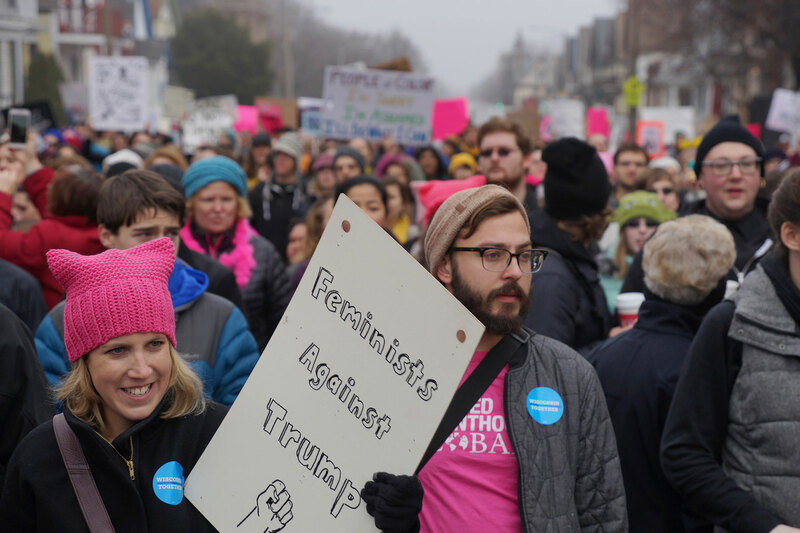 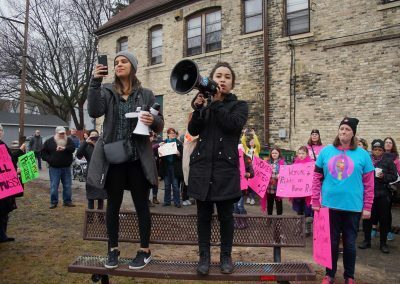 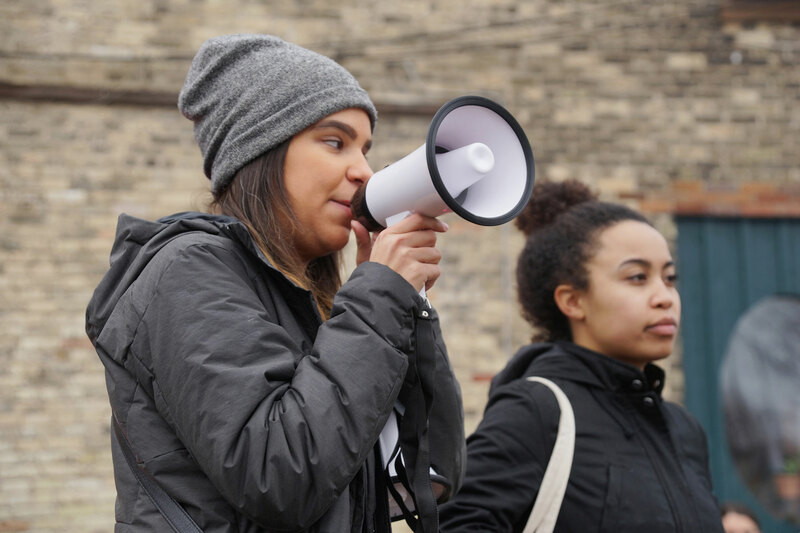 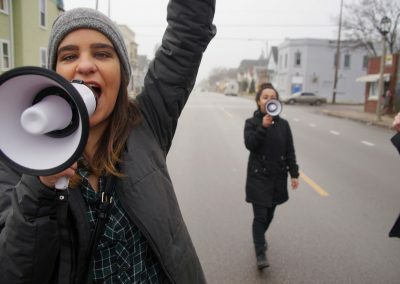 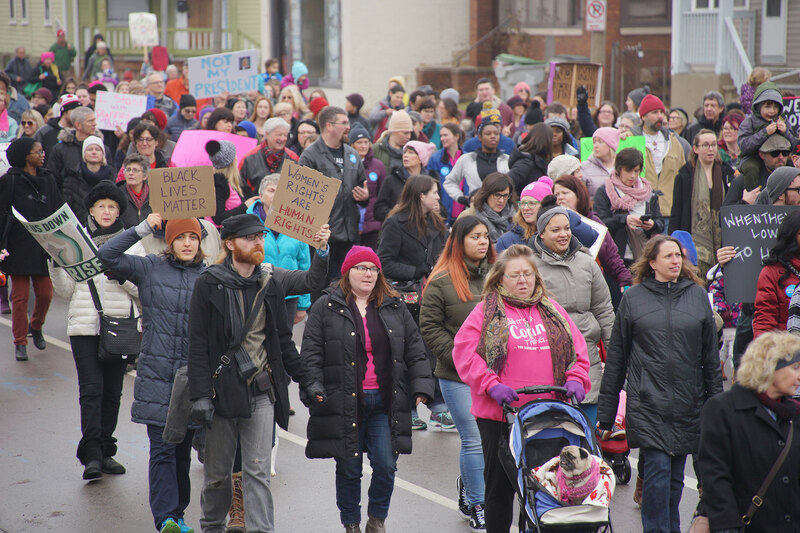 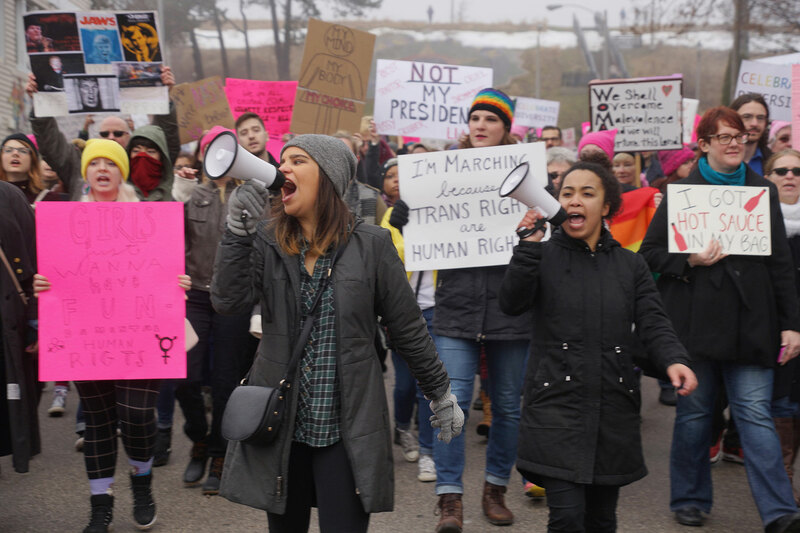 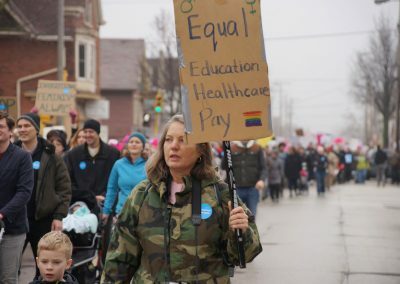 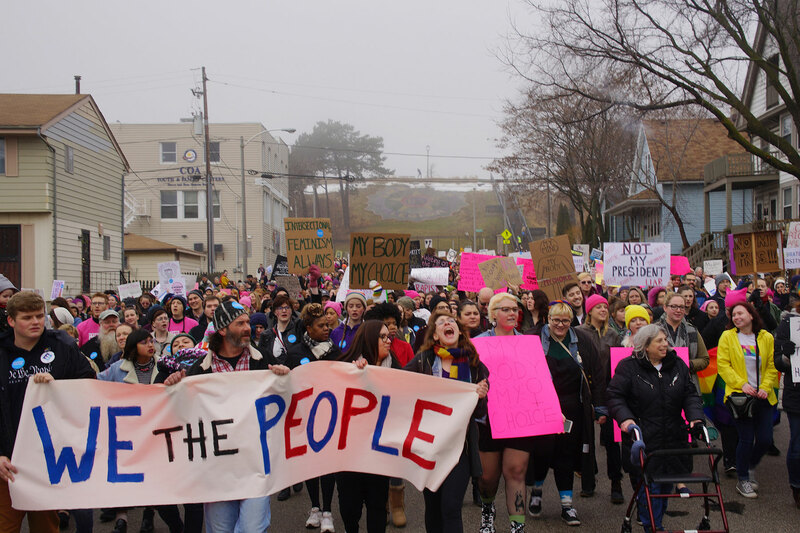 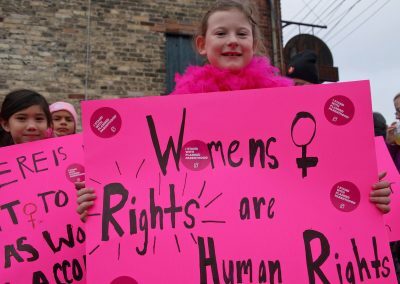 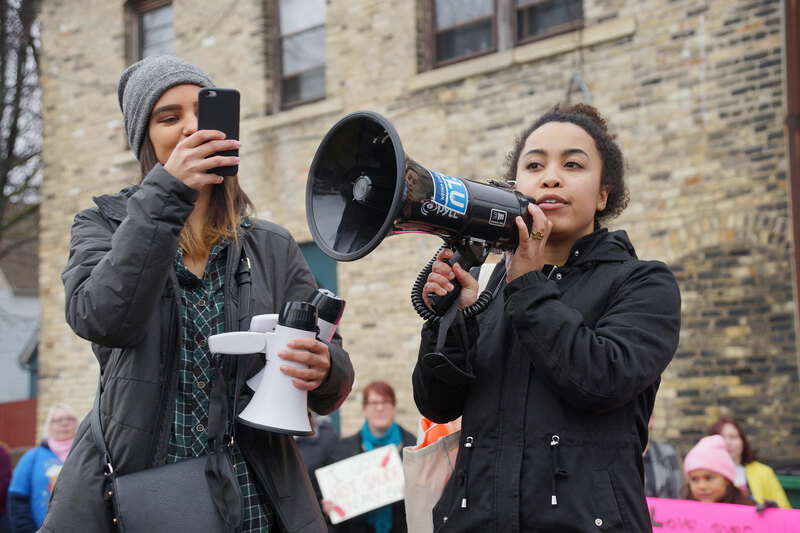 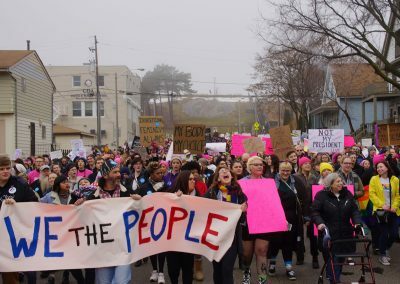 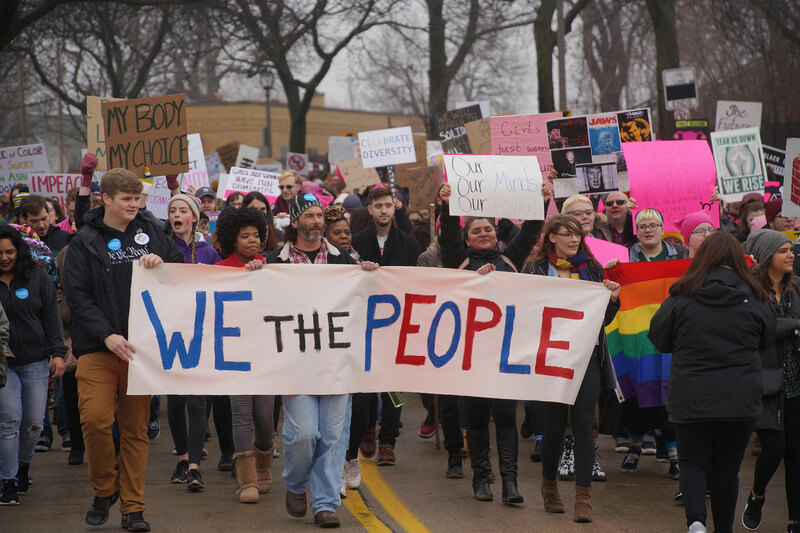 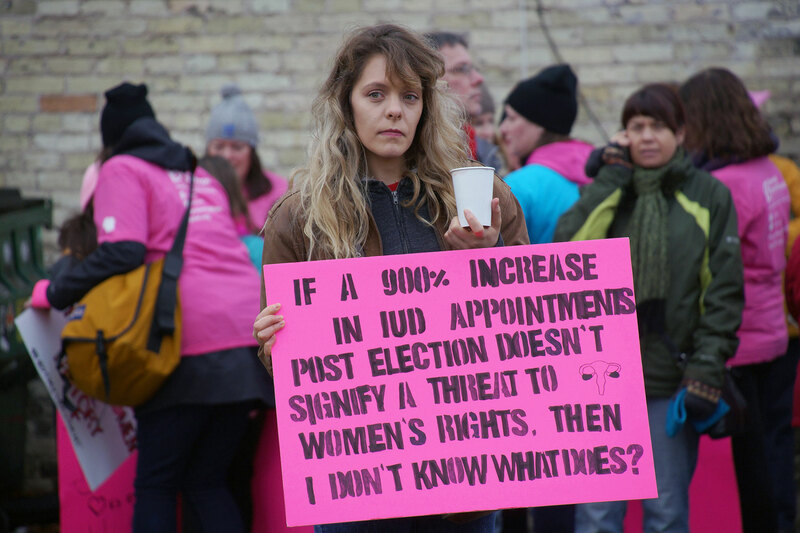 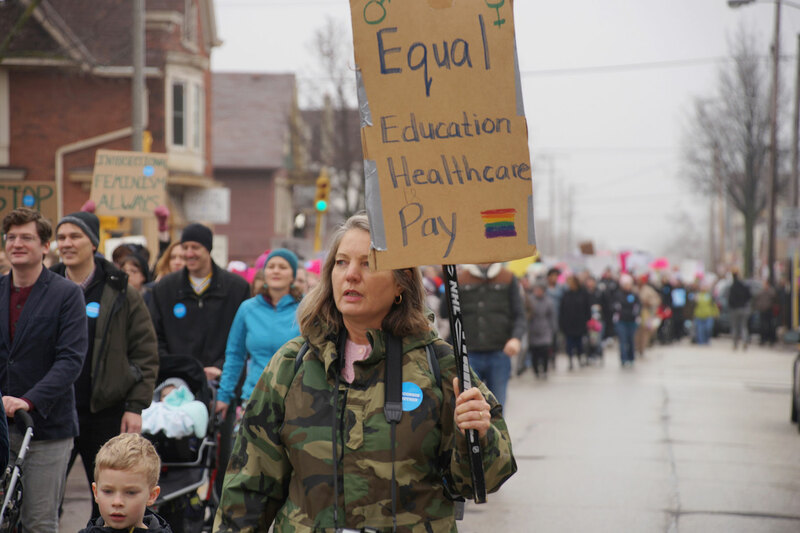 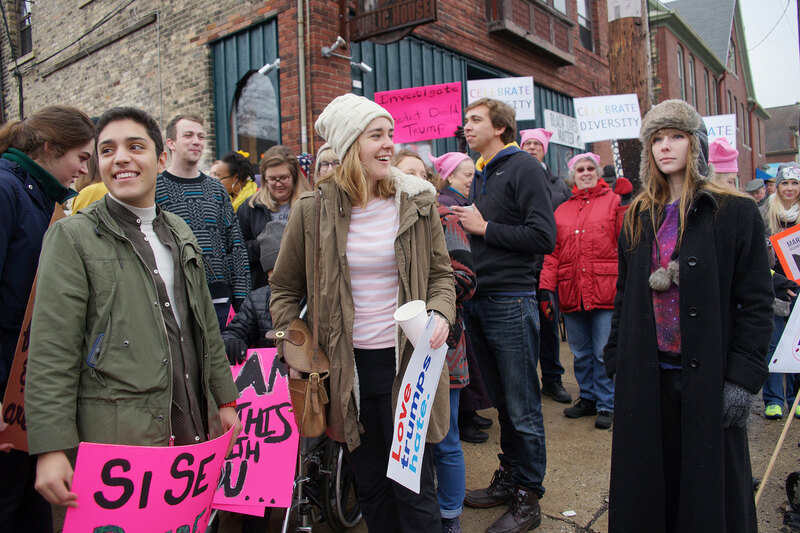 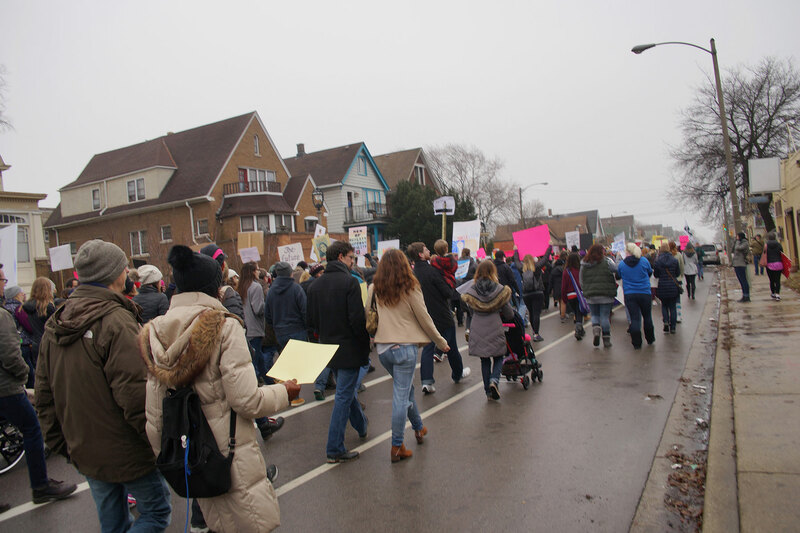 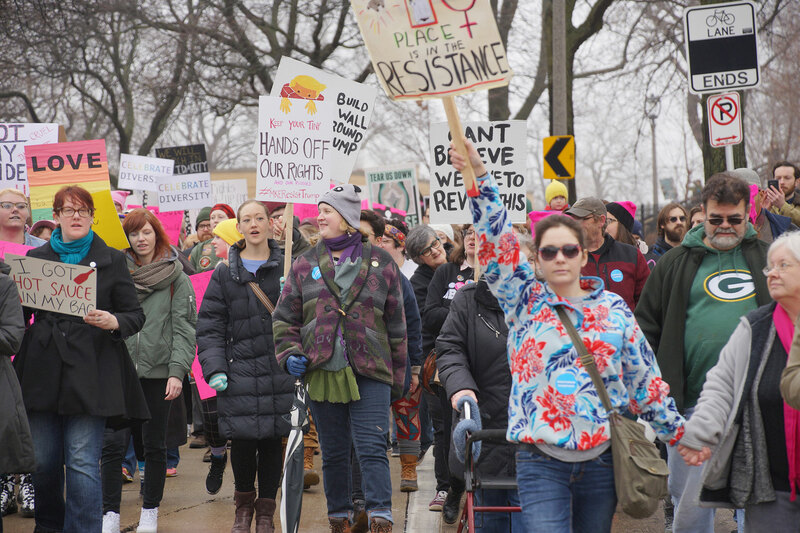 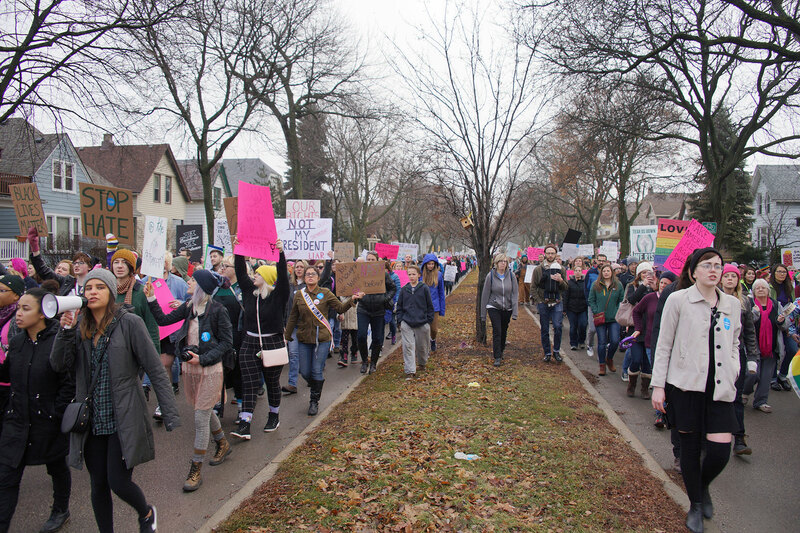 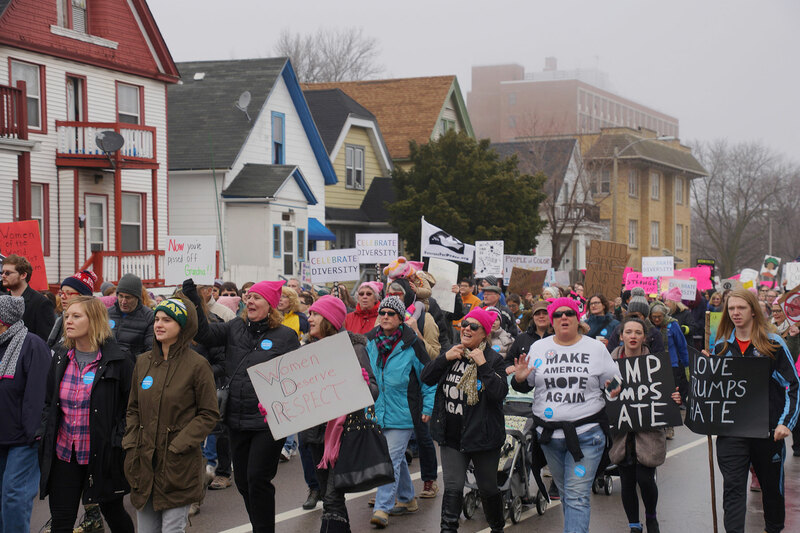 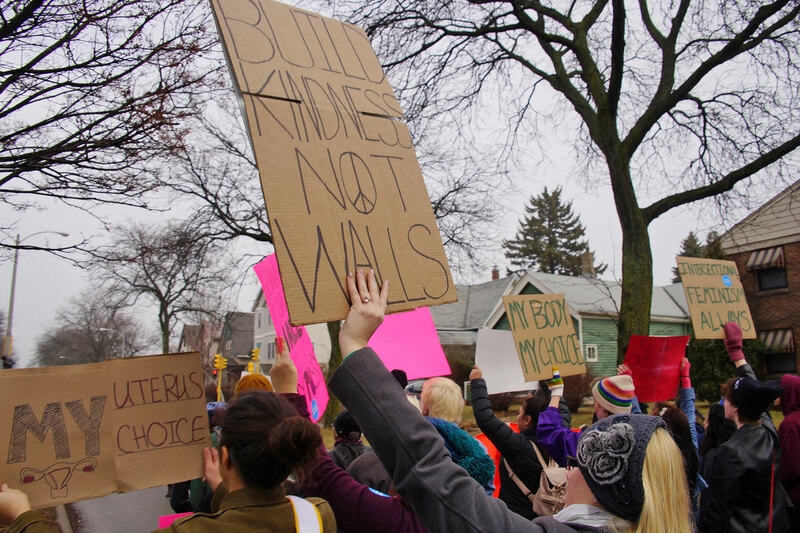 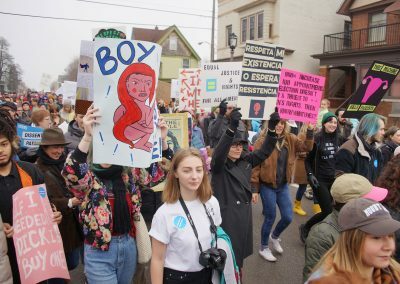 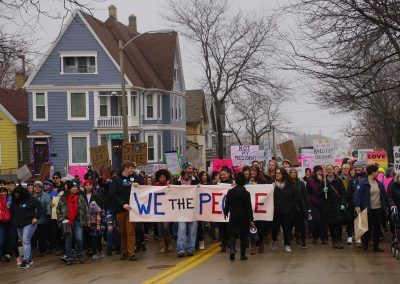 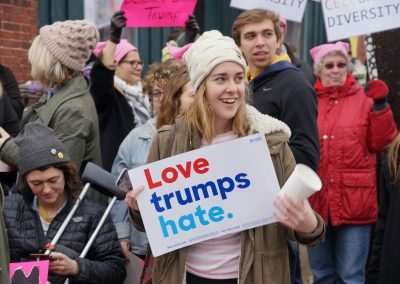 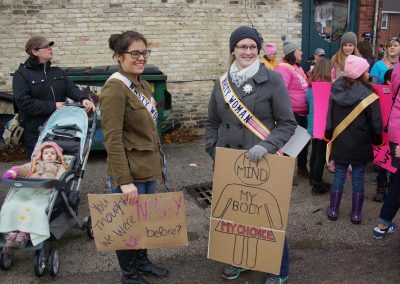 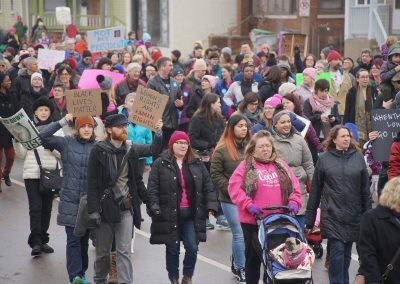 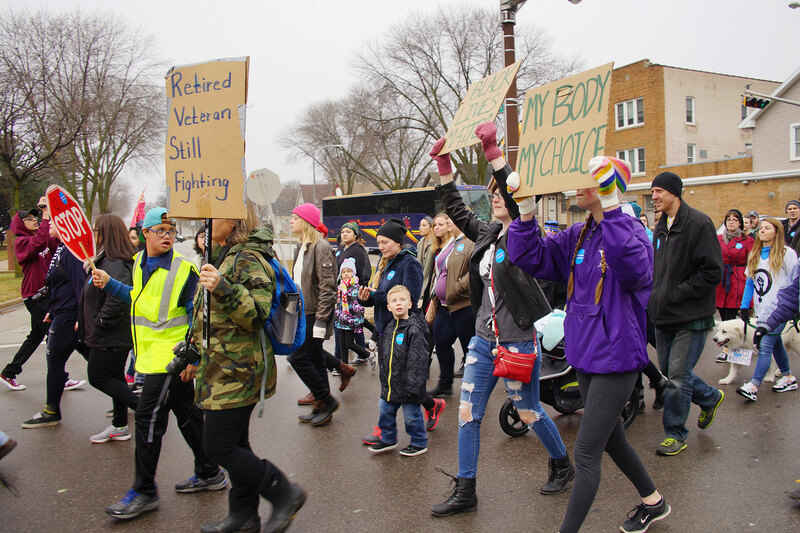 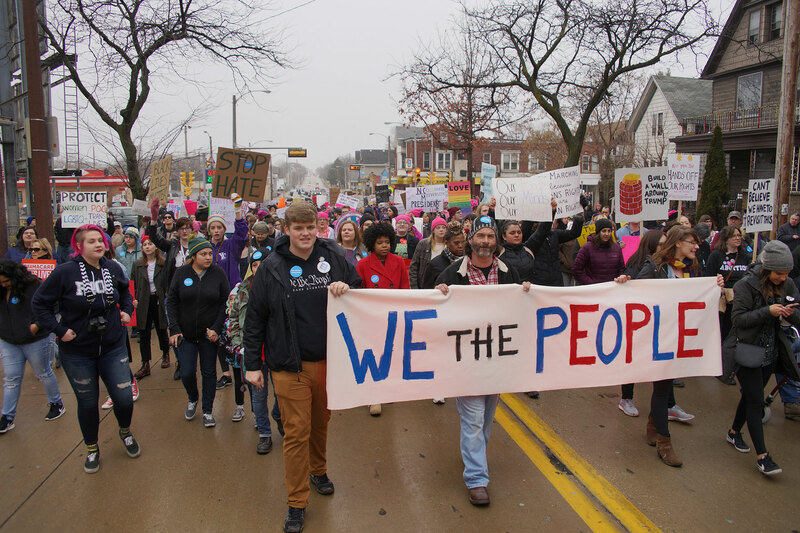 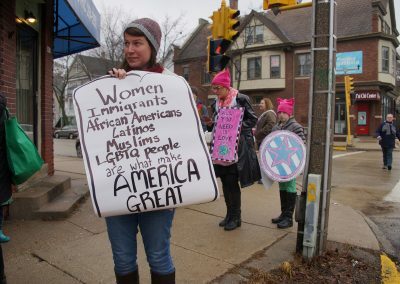 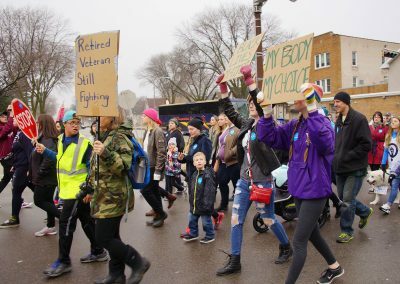 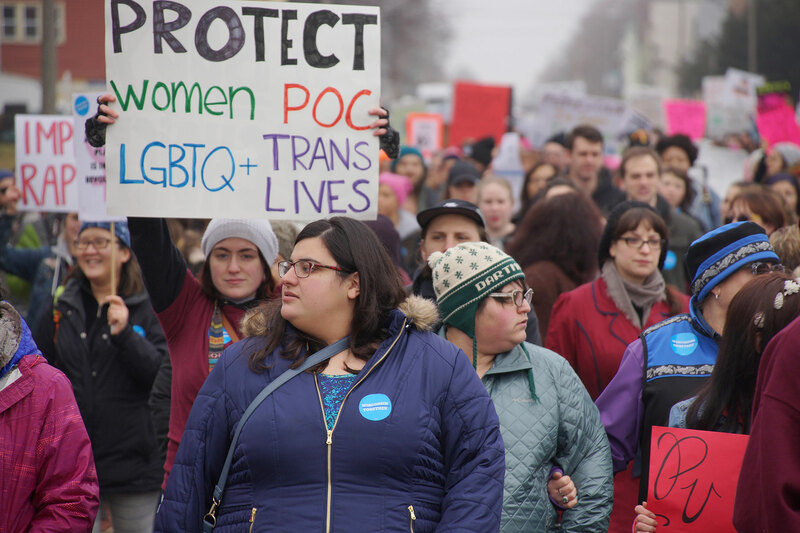 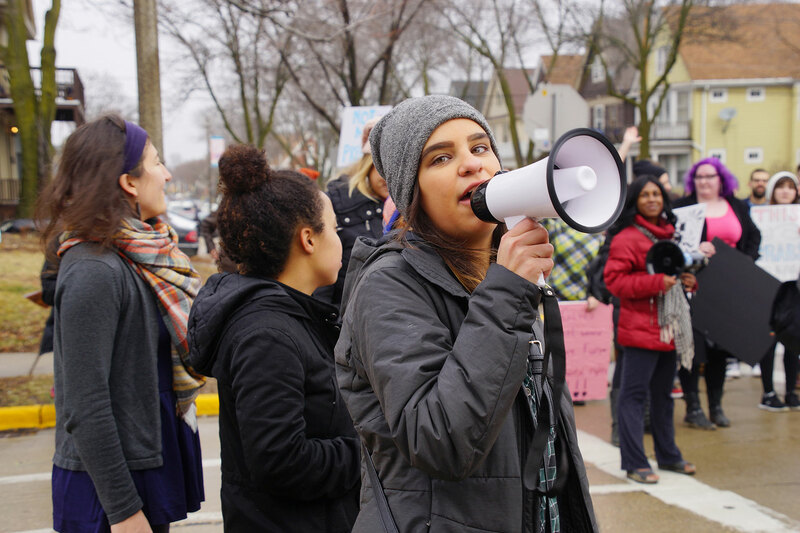 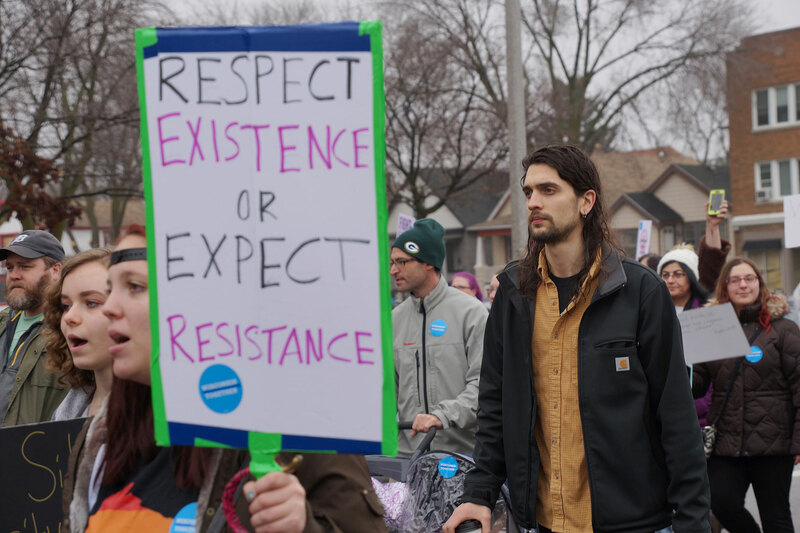 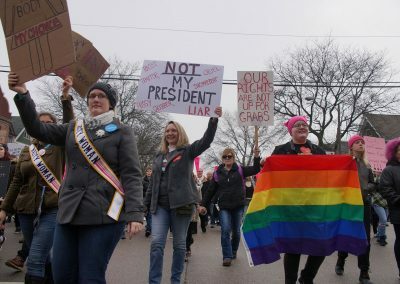 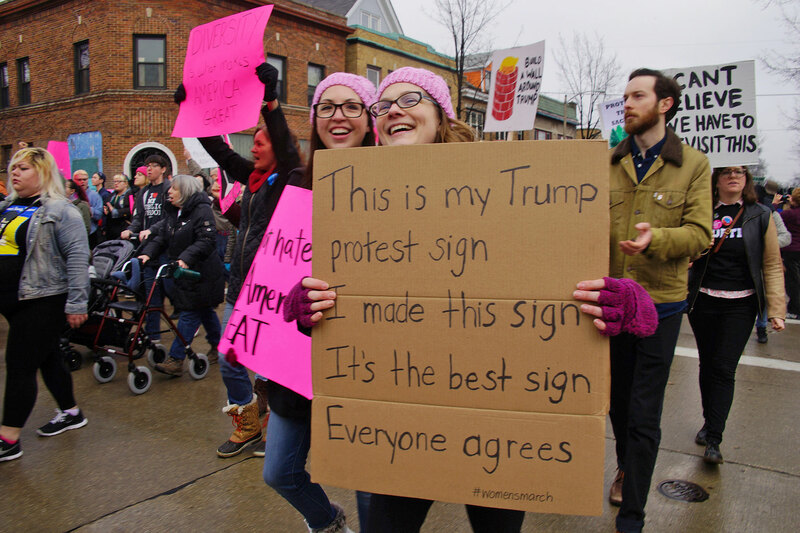 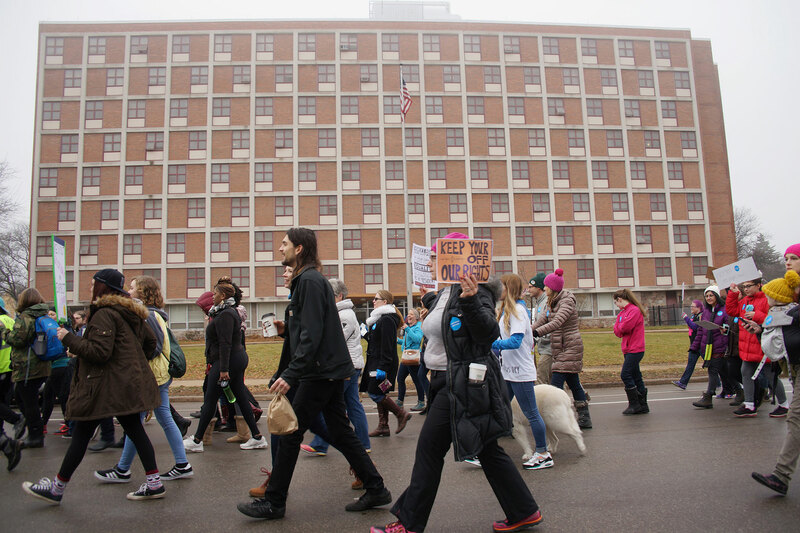 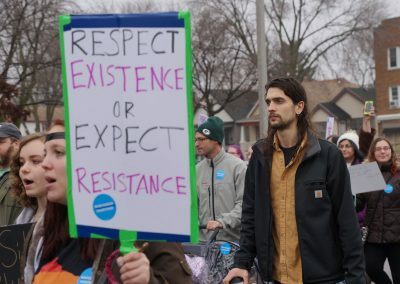 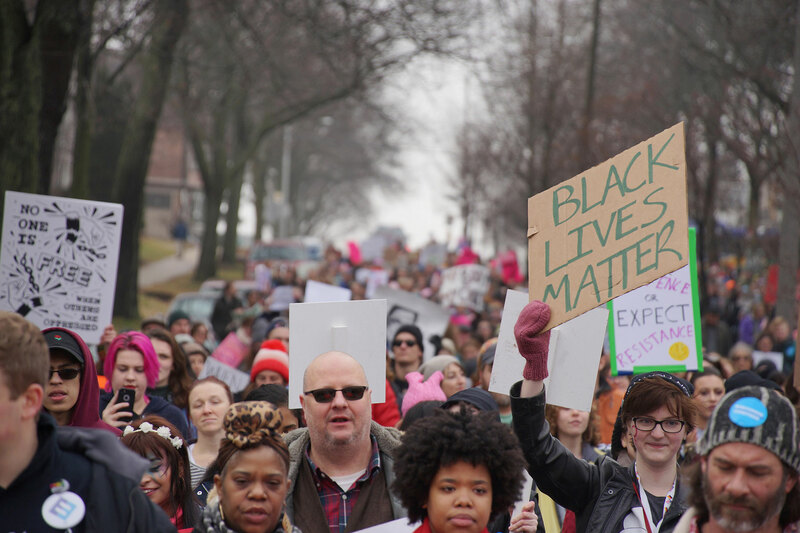 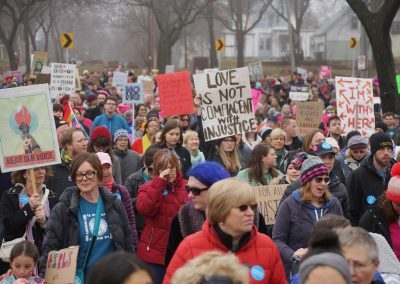 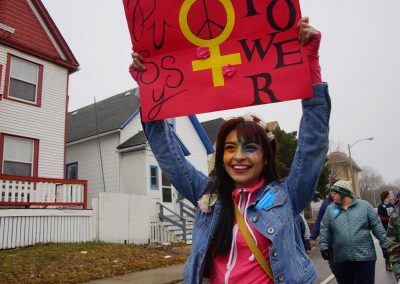 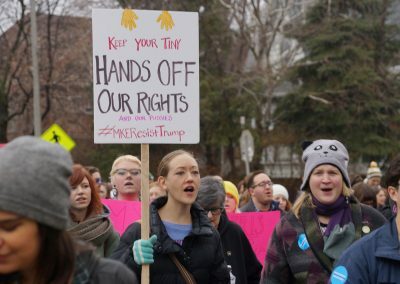 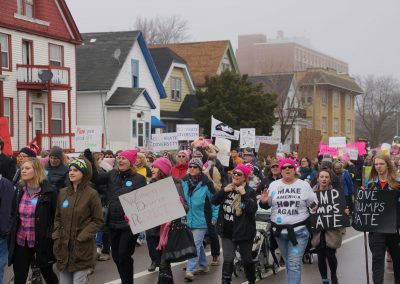 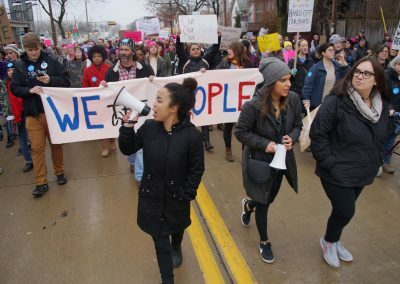 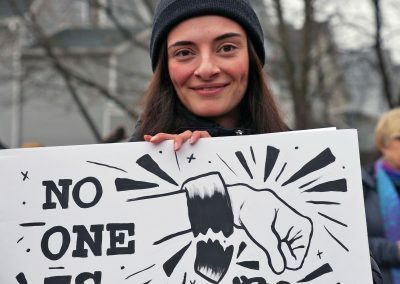 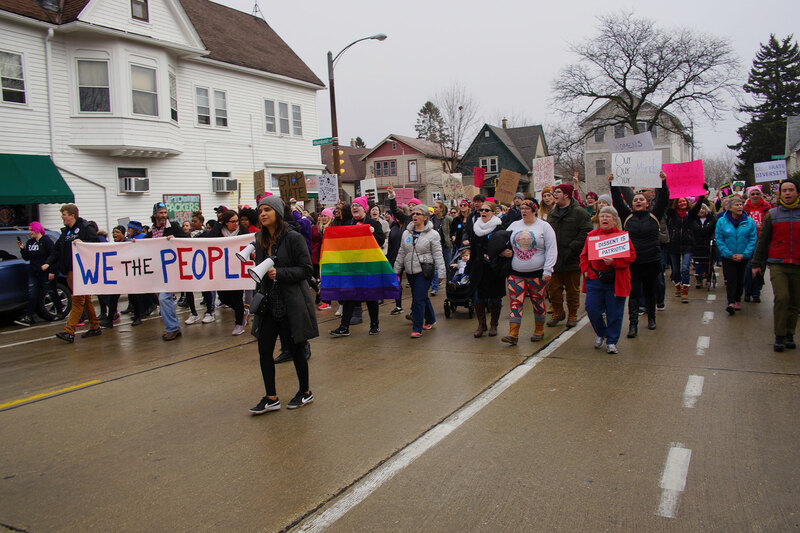 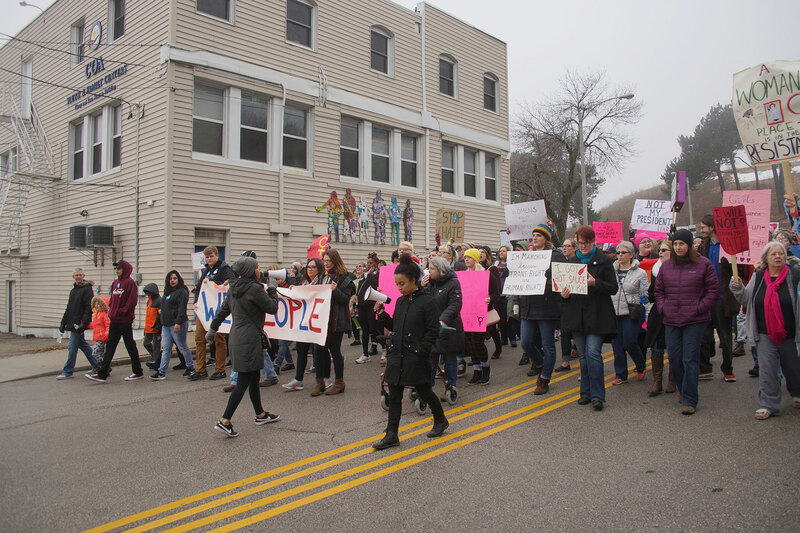 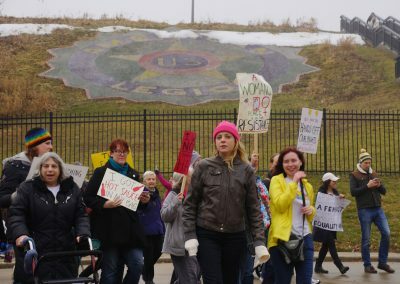 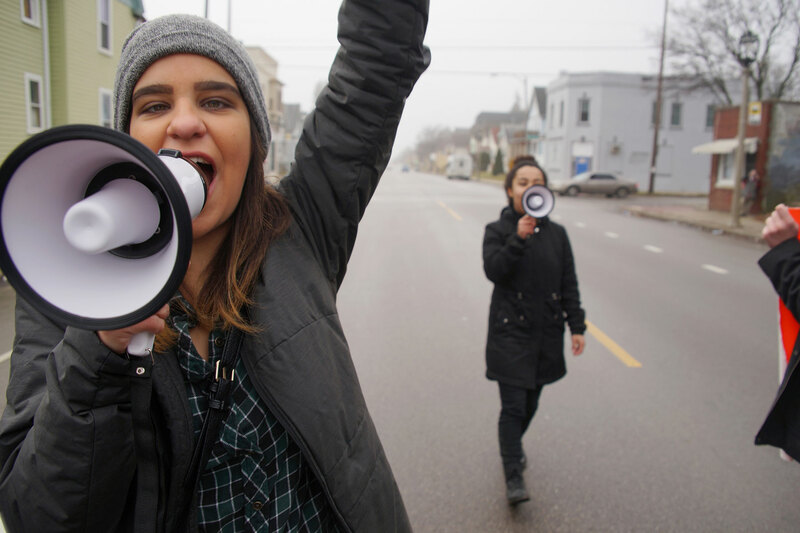 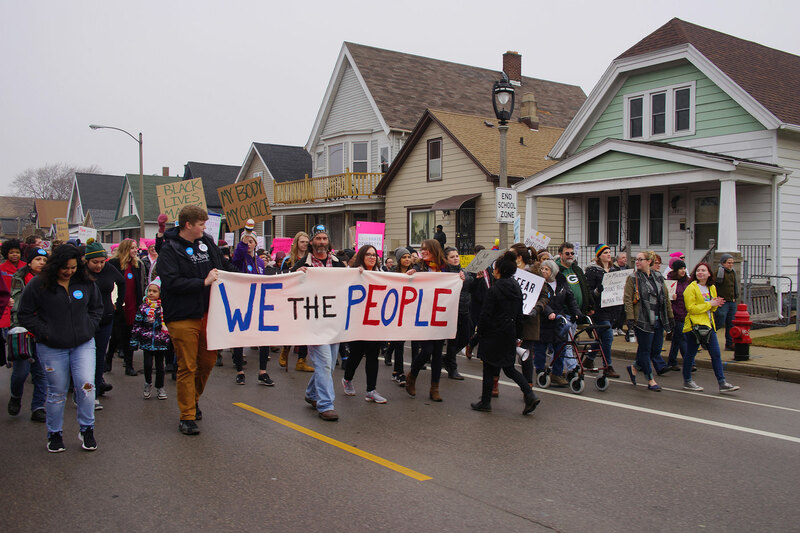 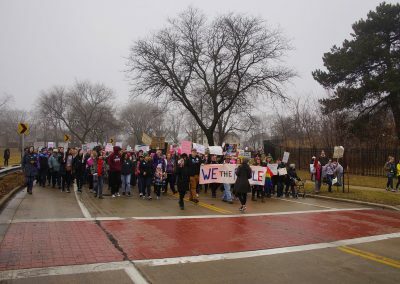 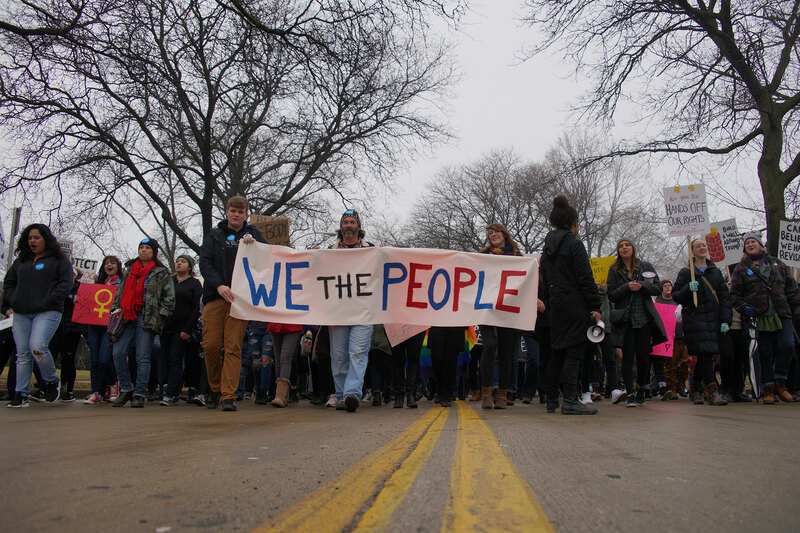 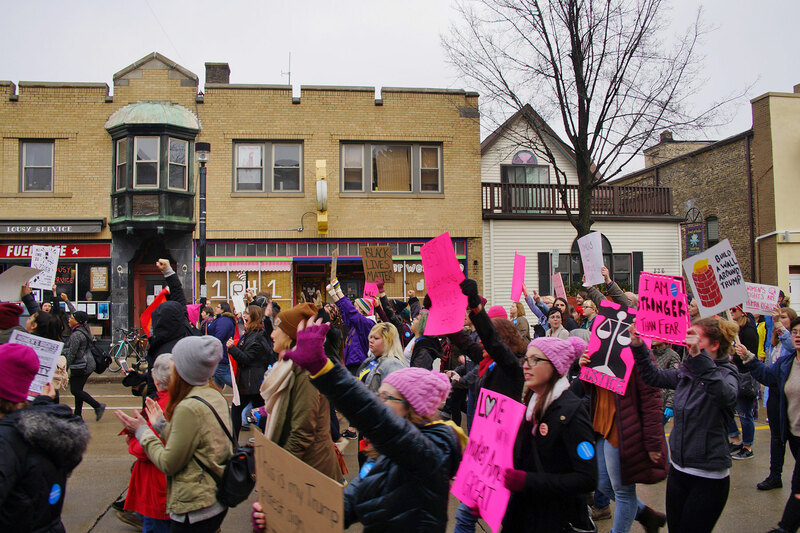 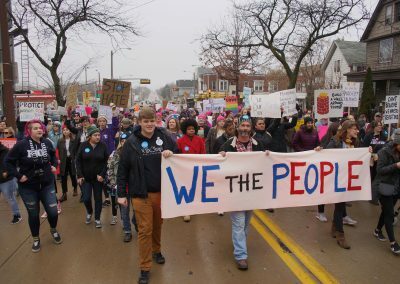 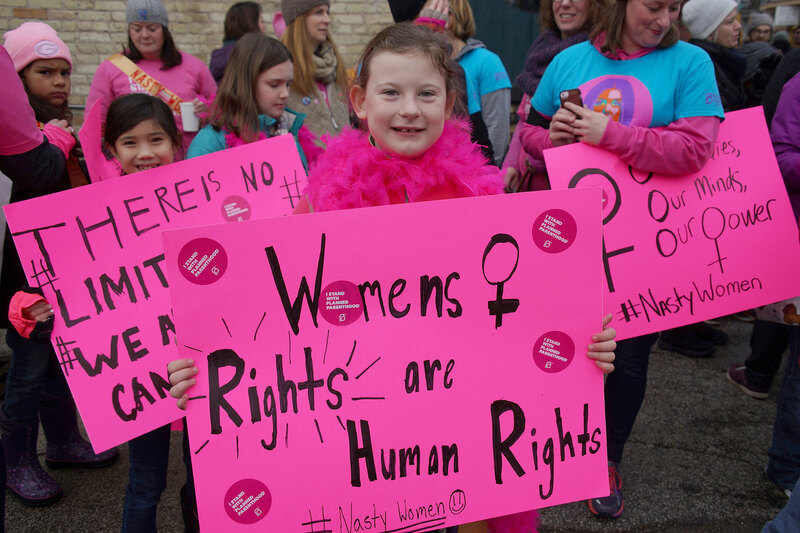 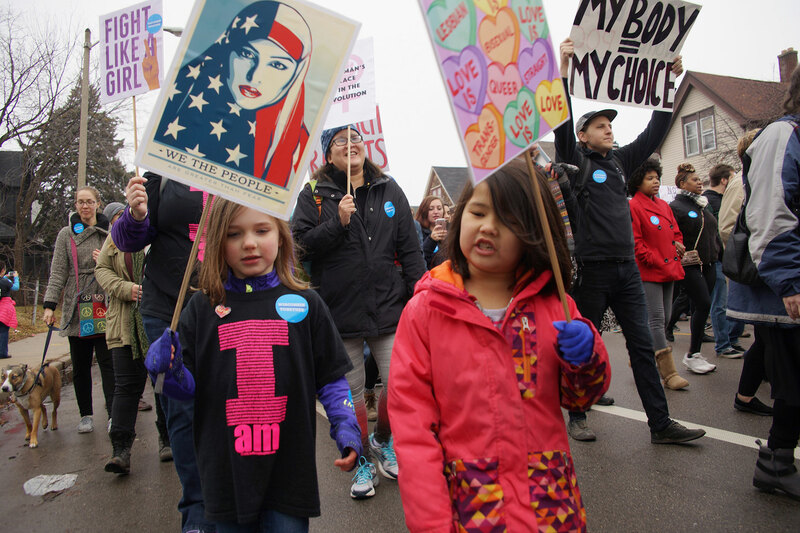 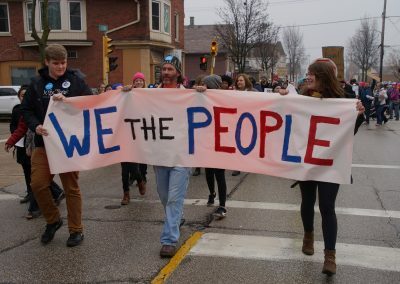 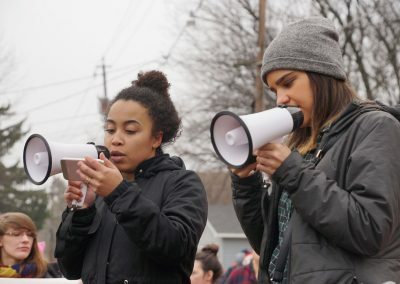 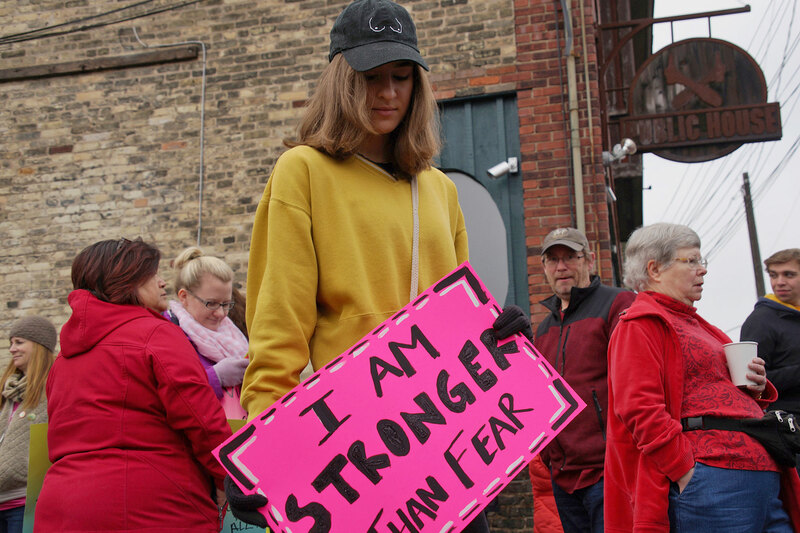 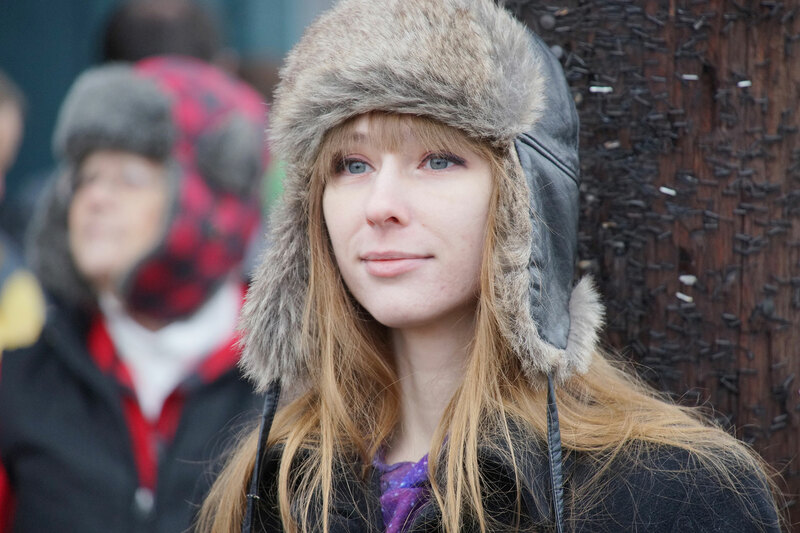 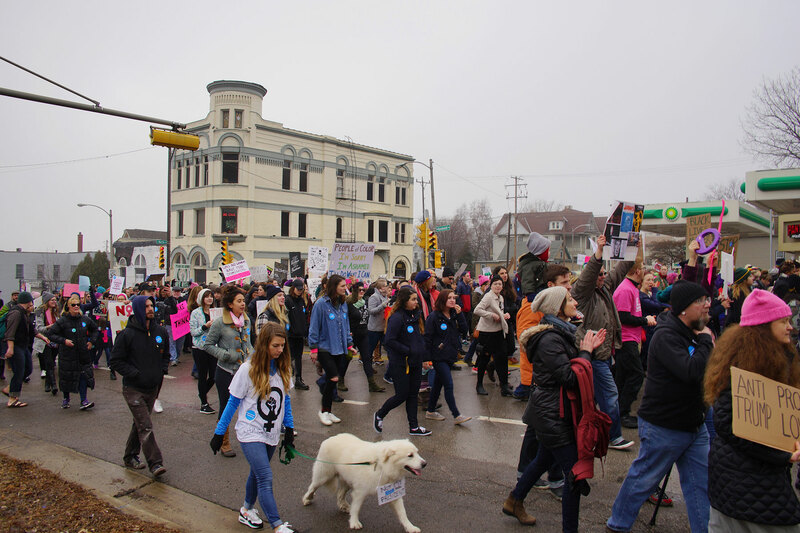 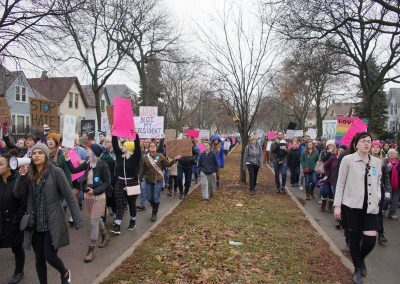 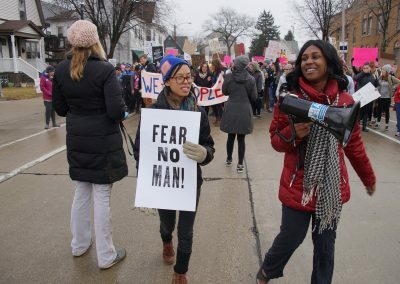 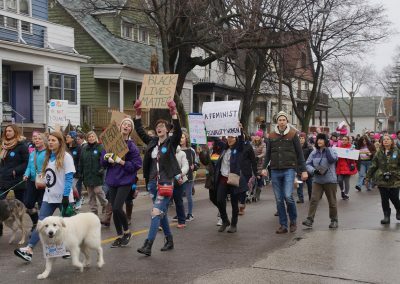 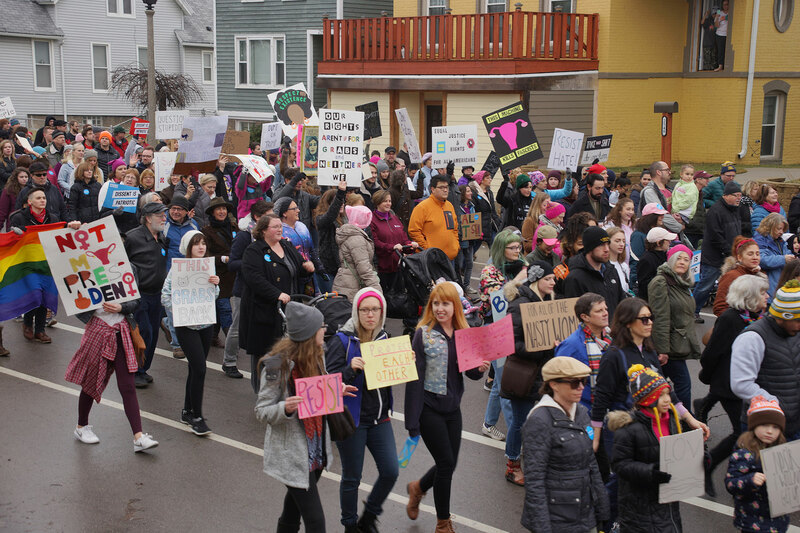 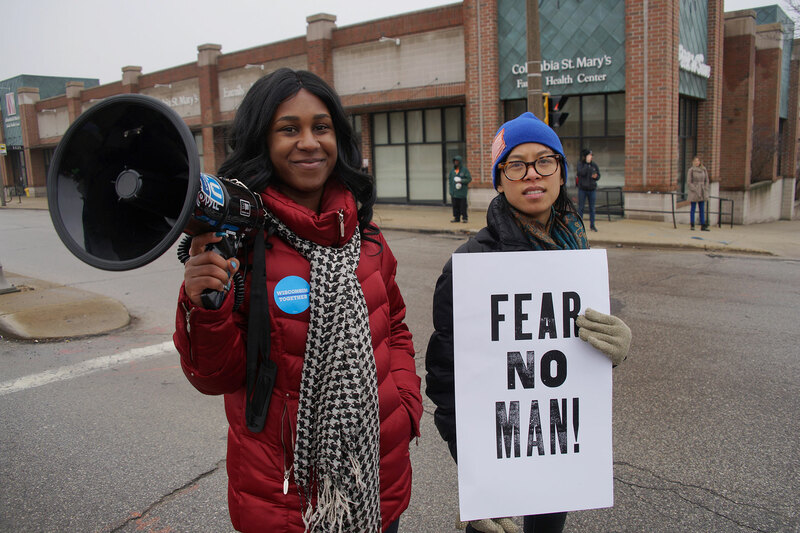 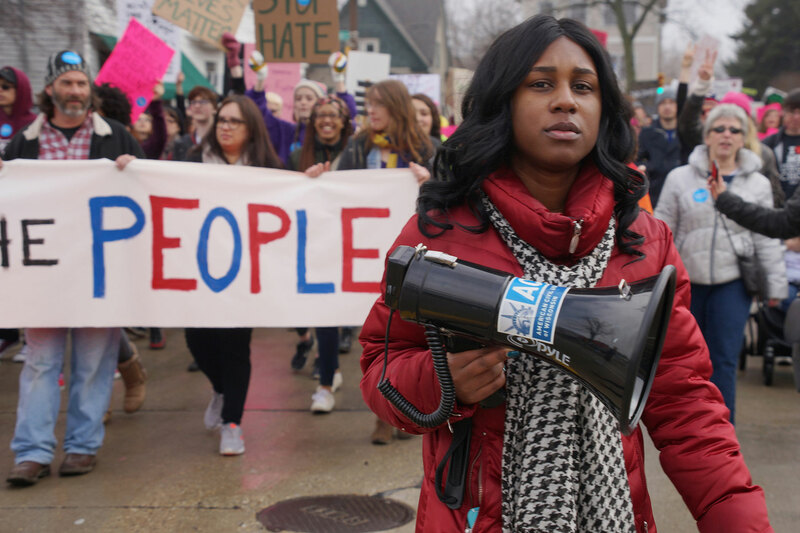 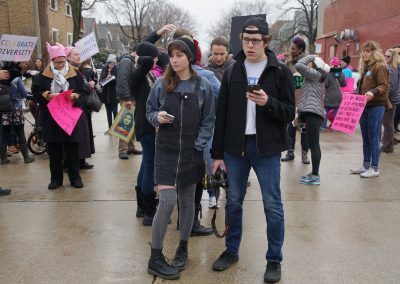 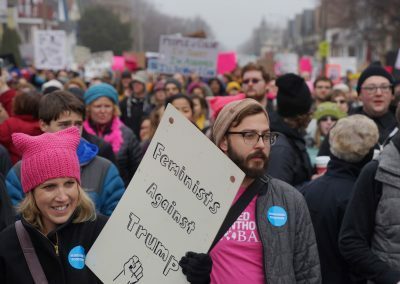 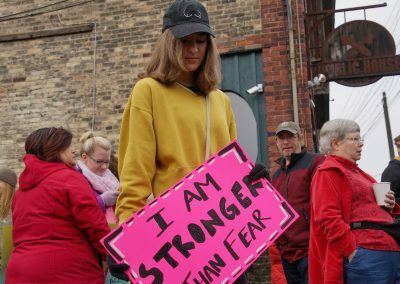 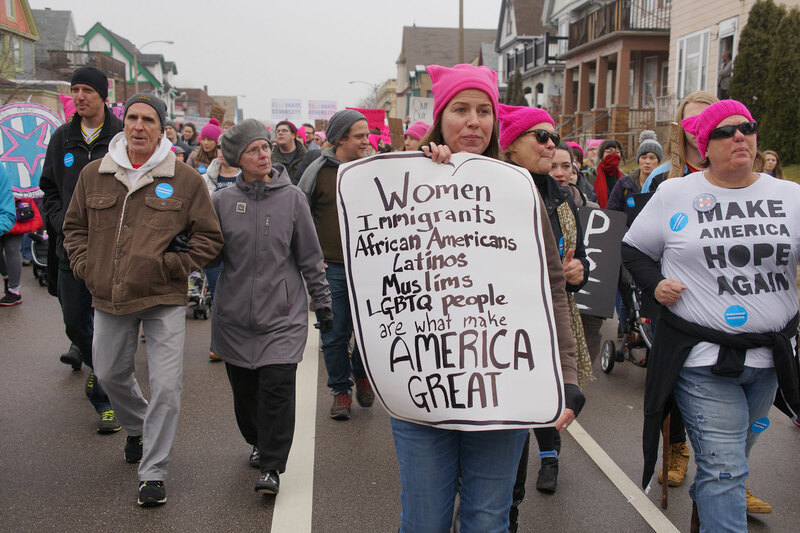 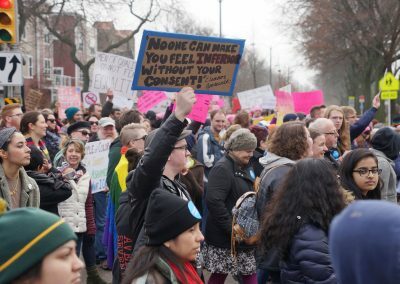 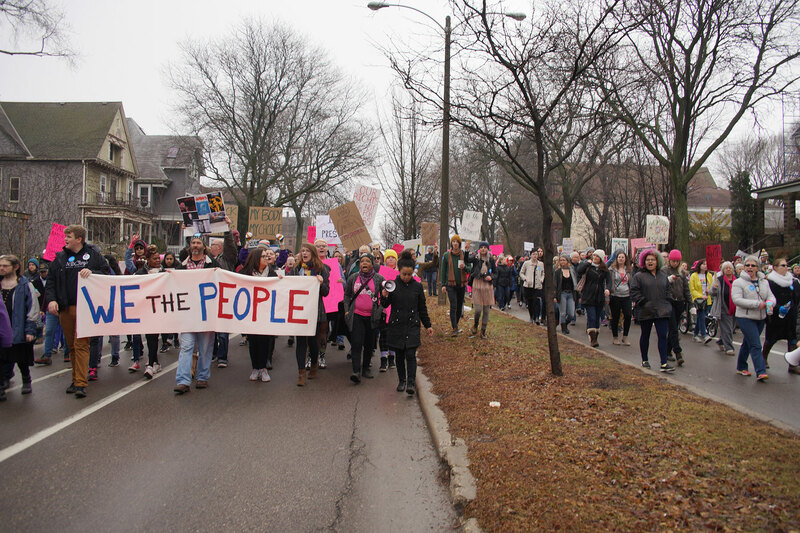 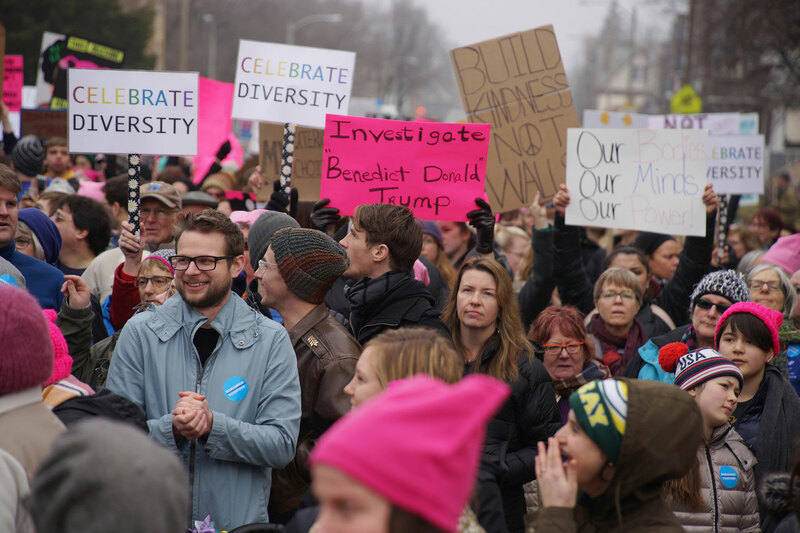 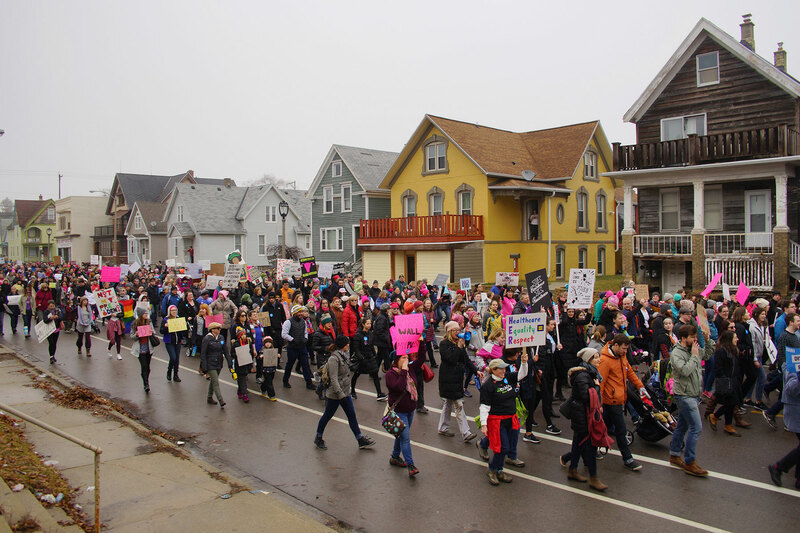 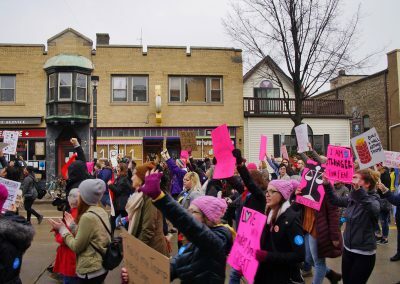 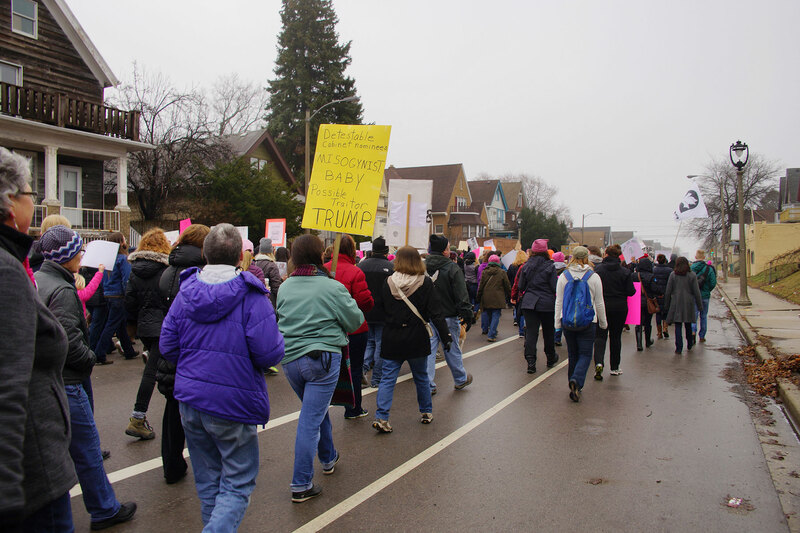 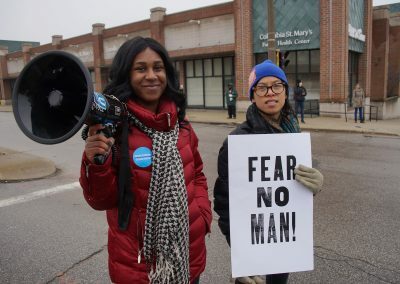 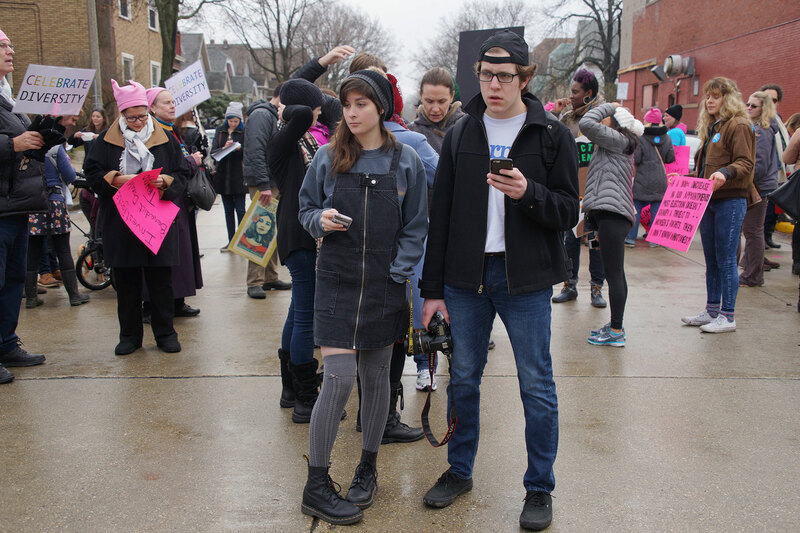 The Femme Solidarity March took place on January 21 in the Riverwest neighborhood of Milwaukee, coinciding with the Women’s March on Washington DC that saw more than one million in attendance. 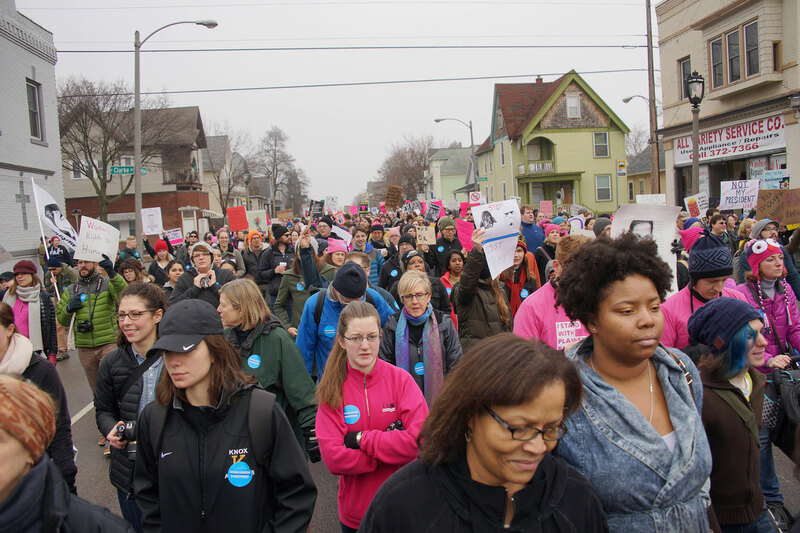 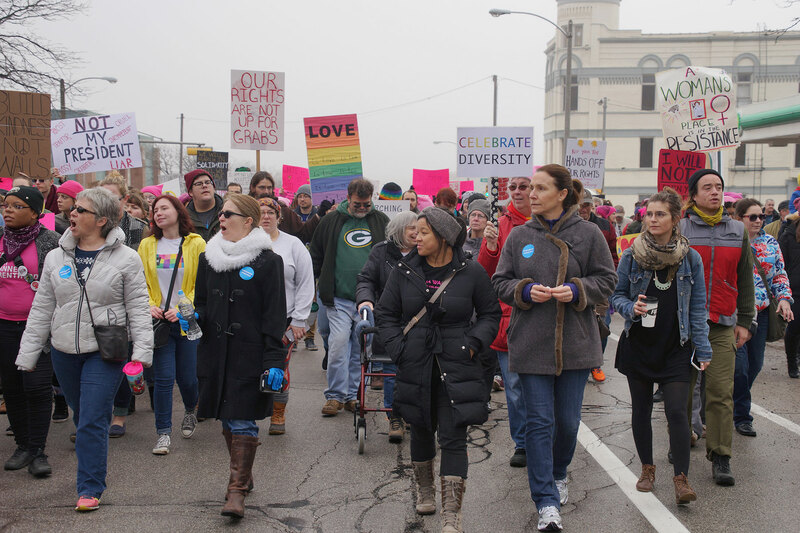 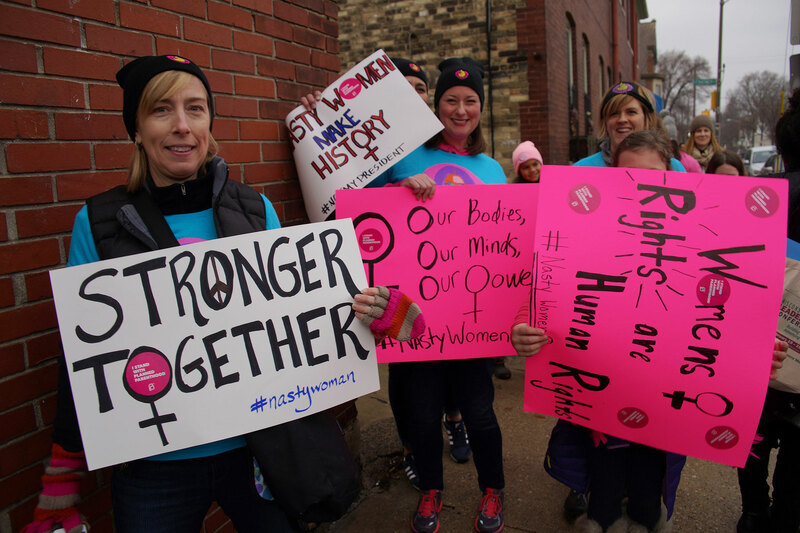 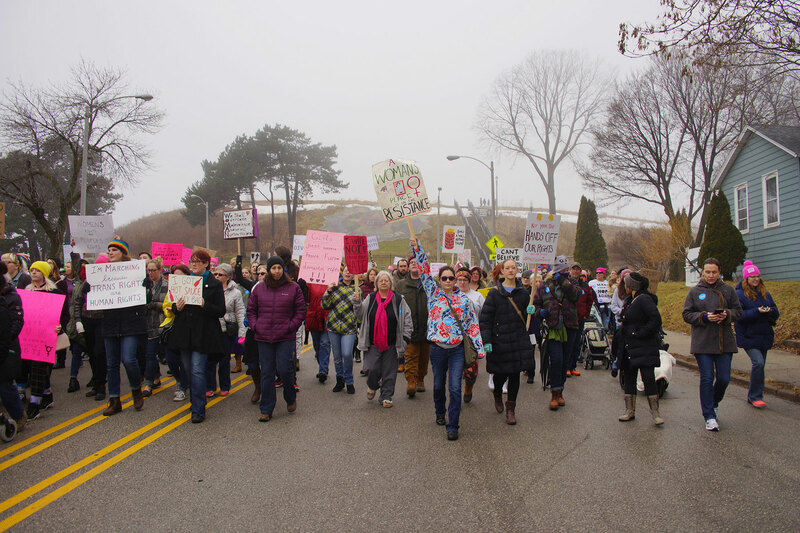 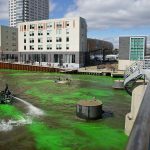 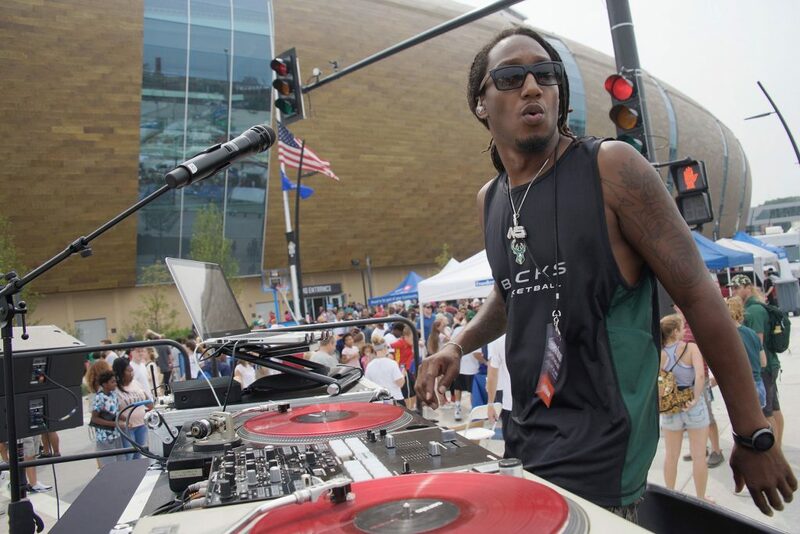 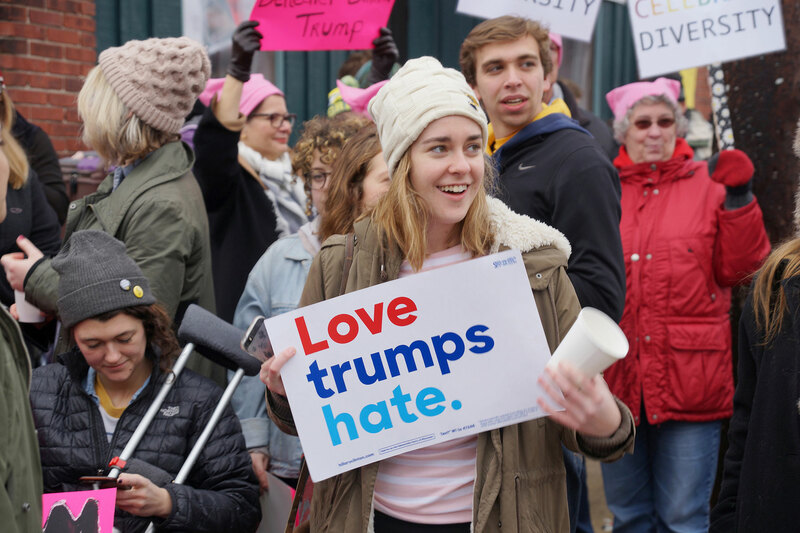 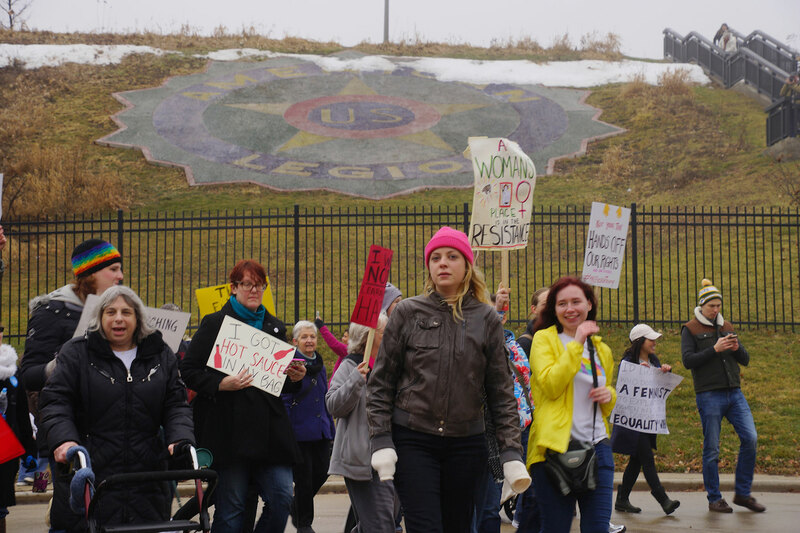 The sister event in Milwaukee joined 673 marches over all 50 States and 70 countries, with an estimated 4.7 million participants. 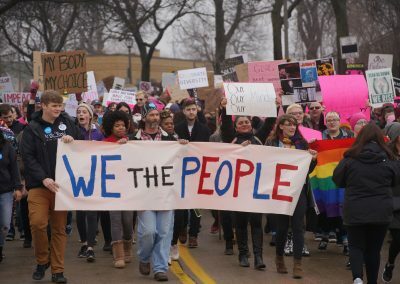 There has never been a single-day protest as large in United States history. 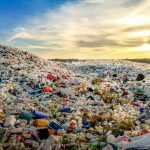 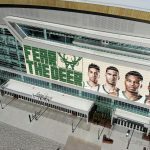 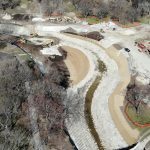 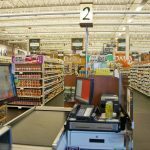 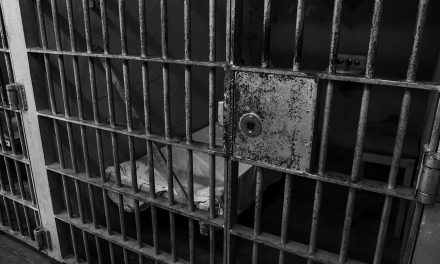 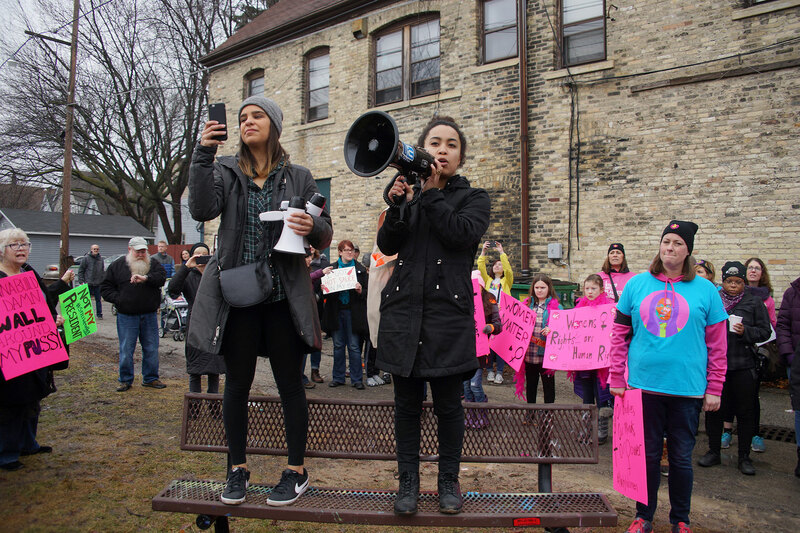 “We will stand together in solidarity for the protection of all our rights, our safety, our health, and our families,” stated organizers Brittany Nordstrum and Nellie Vance in their announcement. 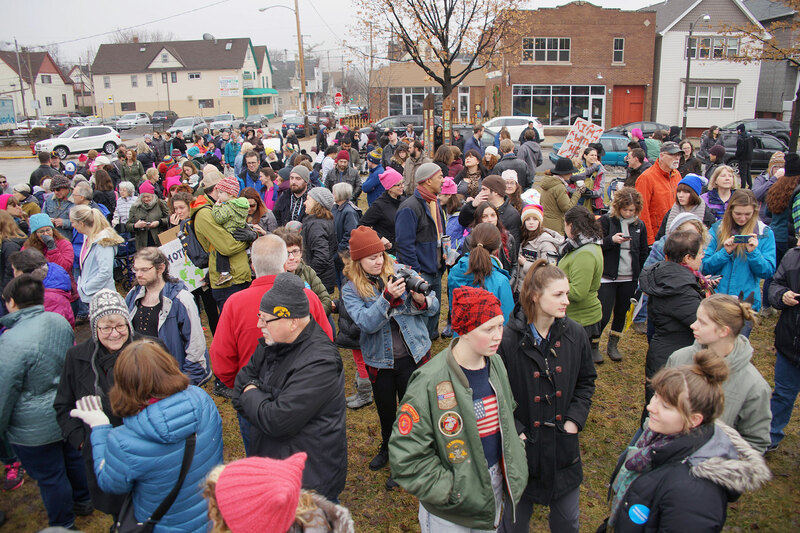 The event was not intended as a protest, but a march of unity and solidarity. 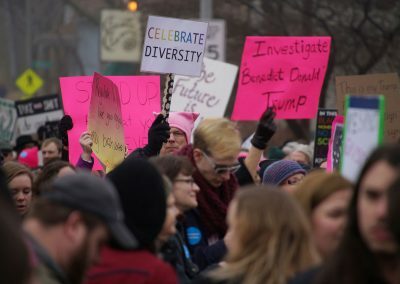 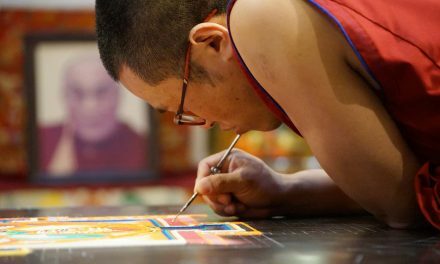 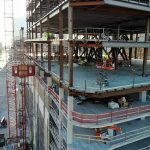 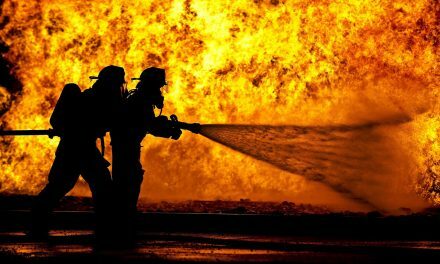 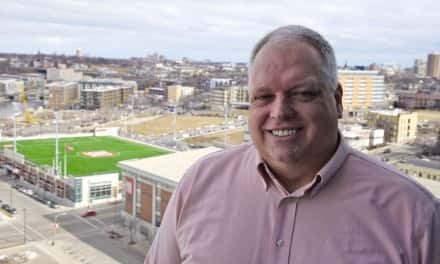 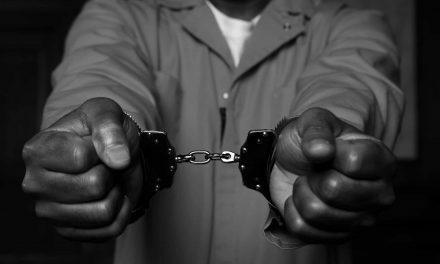 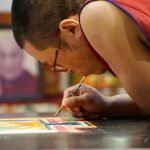 The purpose, to tell President Donald Trump that his agenda of intolerance, discrimination, and injustice would not go unchallenged locally, or nationwide. 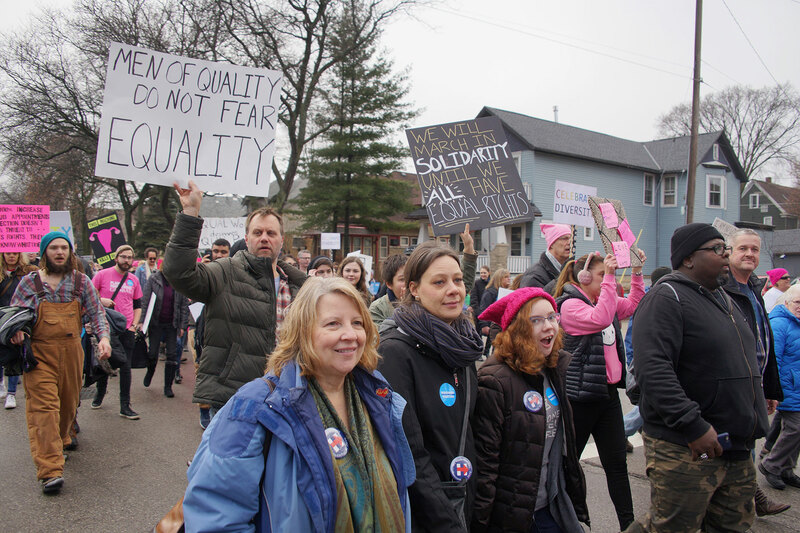 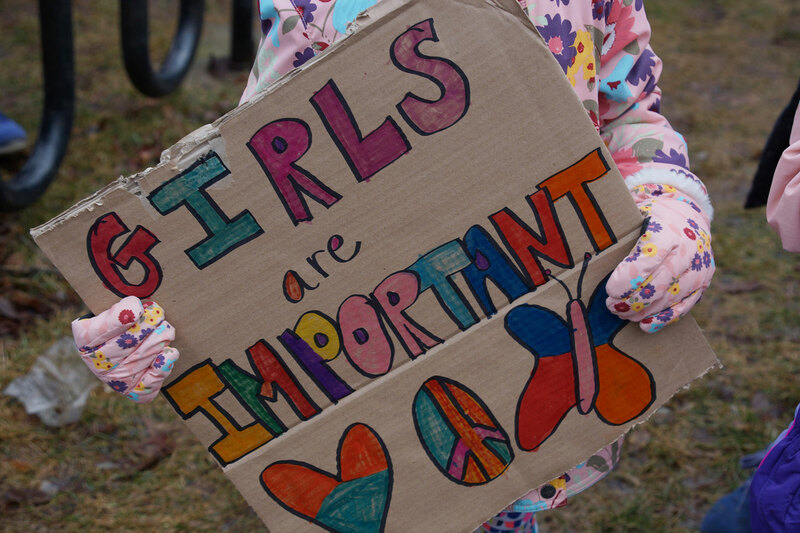 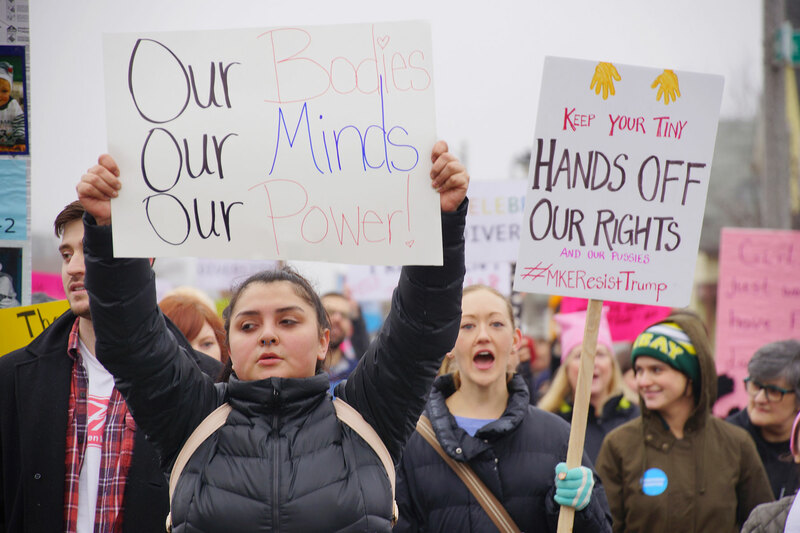 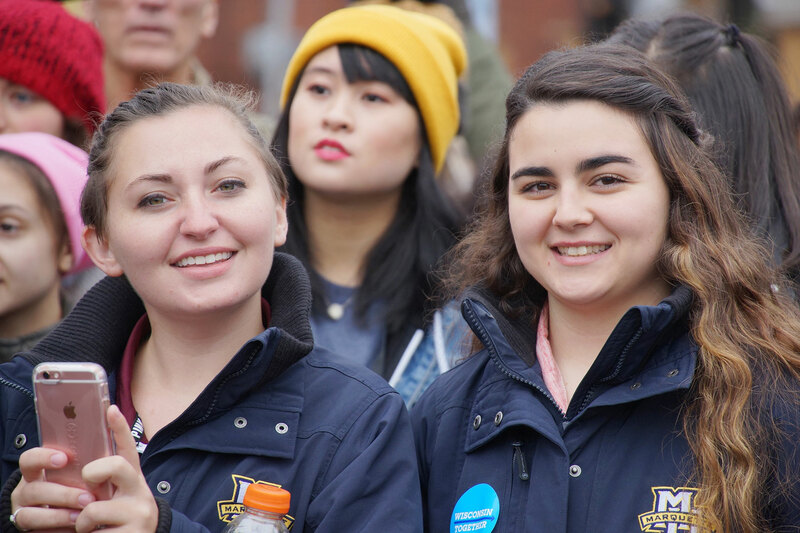 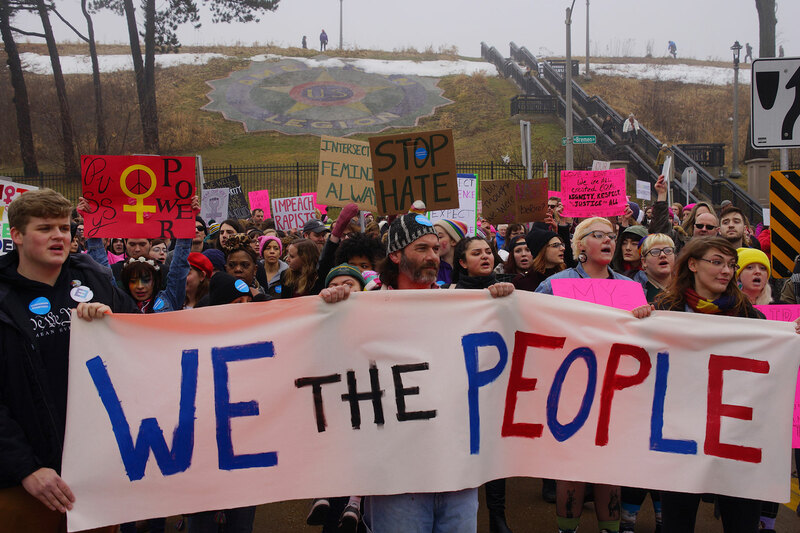 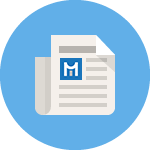 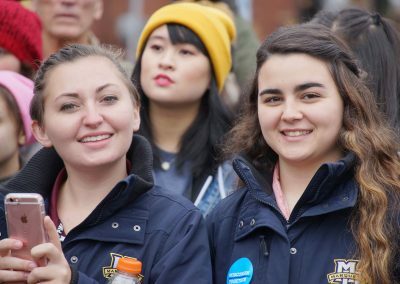 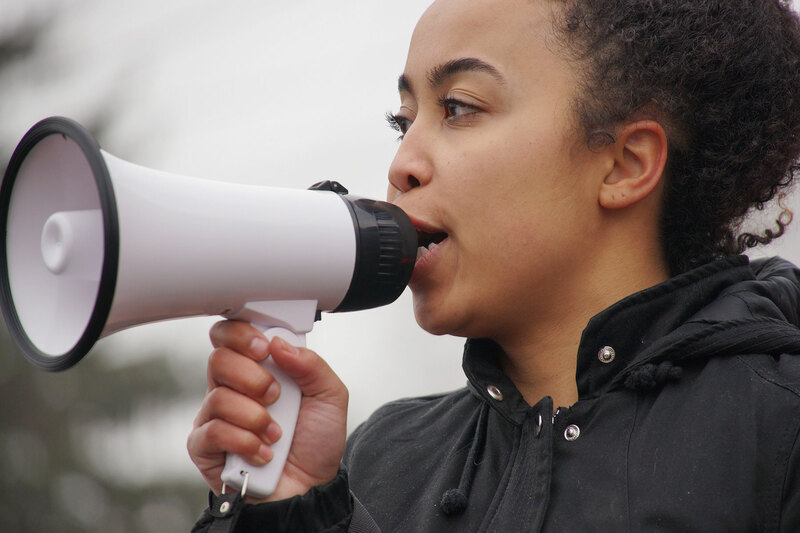 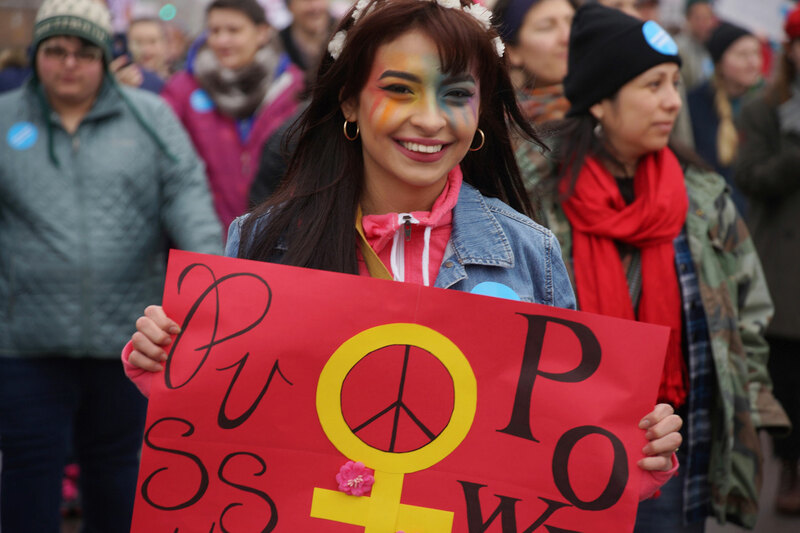 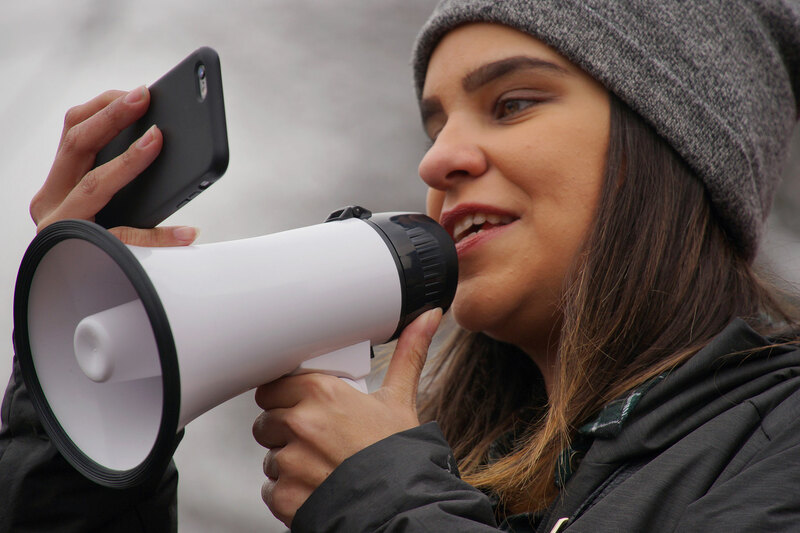 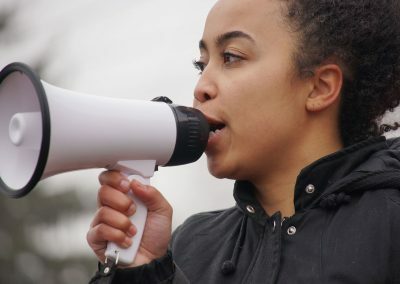 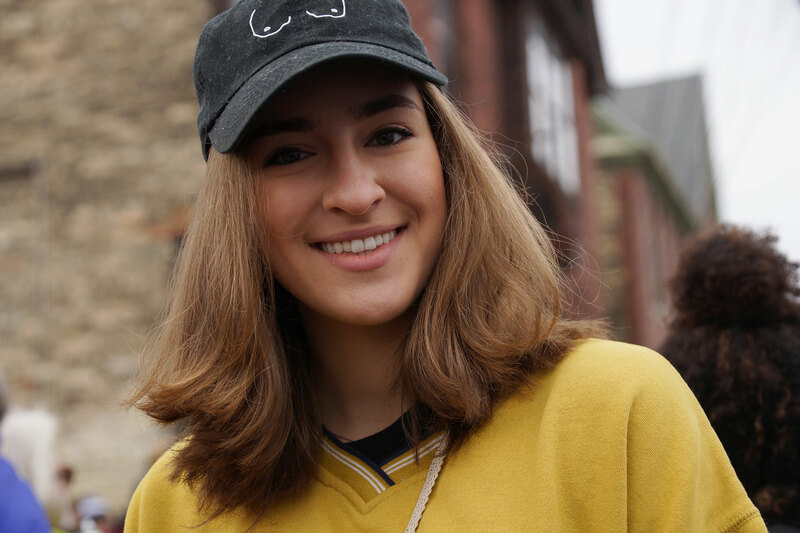 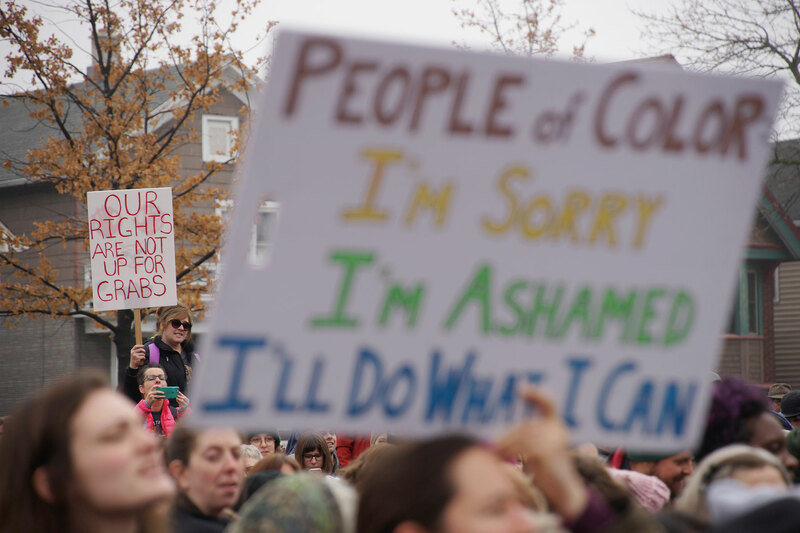 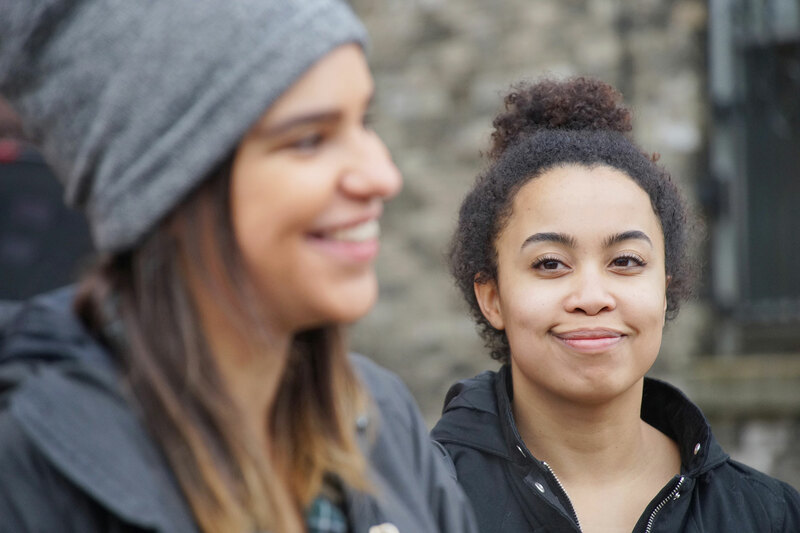 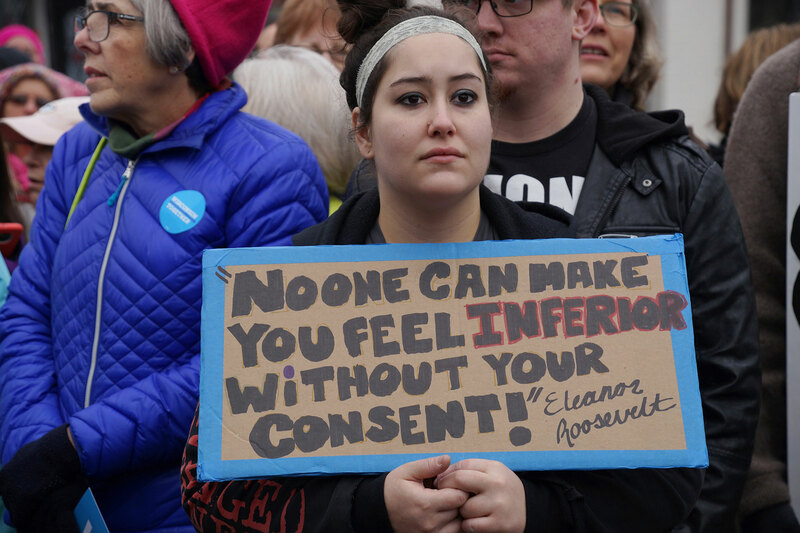 While based on the mission and rules of the Women’s March that took place concurrently in our nation’s capital, the Femme Solidarity March was also focused on equality. 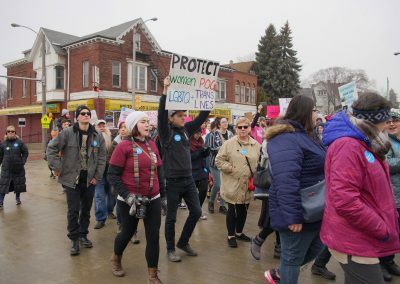 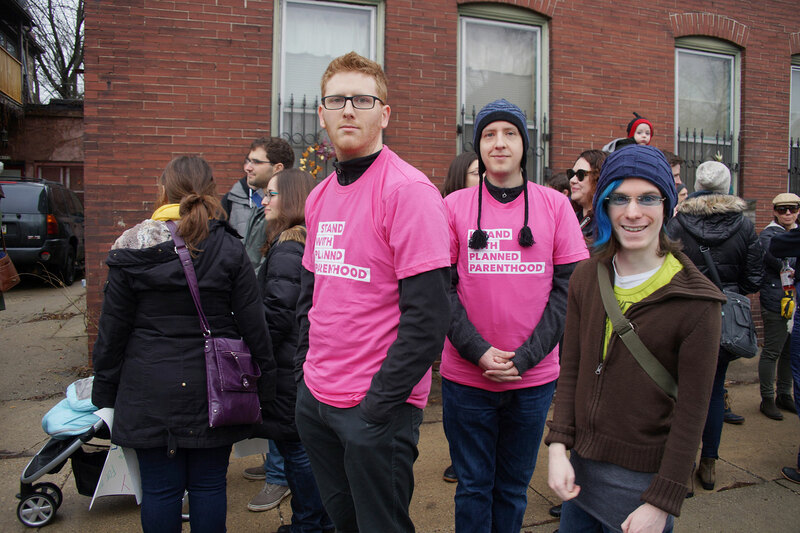 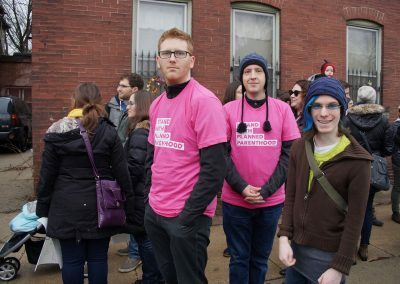 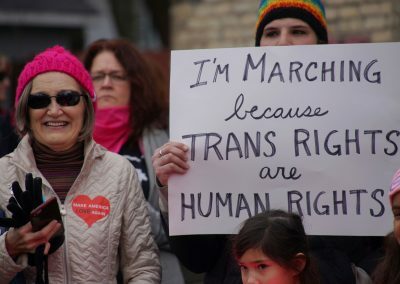 Organizers asked marchers not to use any gender pronouns, like ‘he’ or ‘she’ but instead use inclusive plural ones like ‘us’ and ‘we’ in their chants. 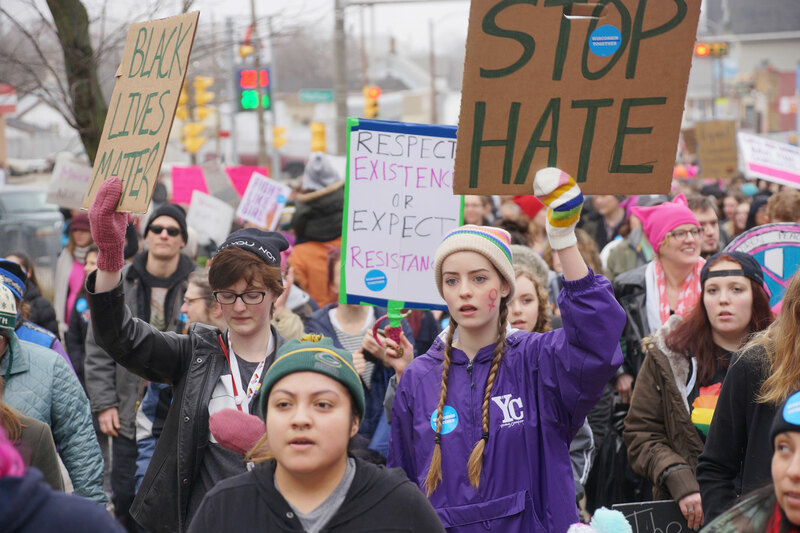 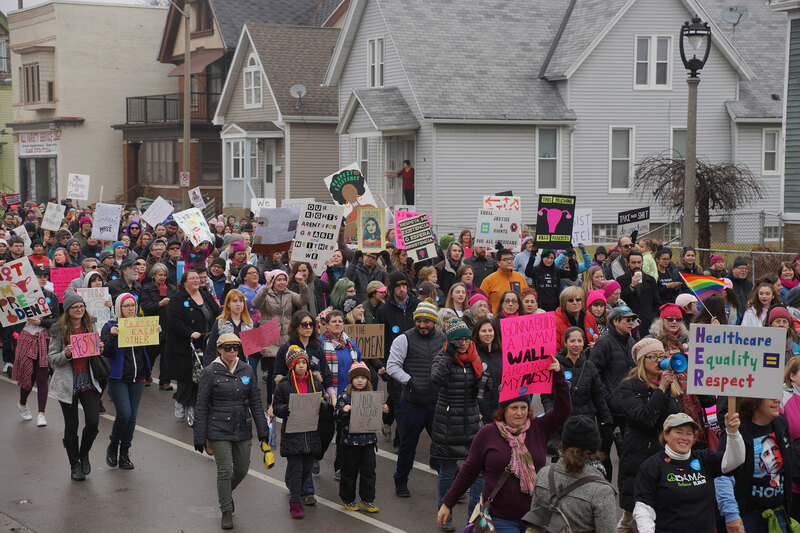 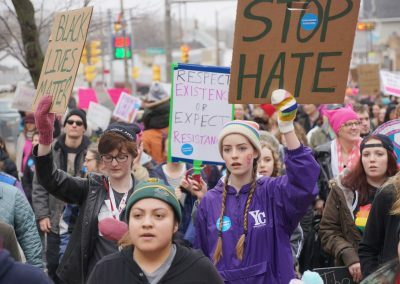 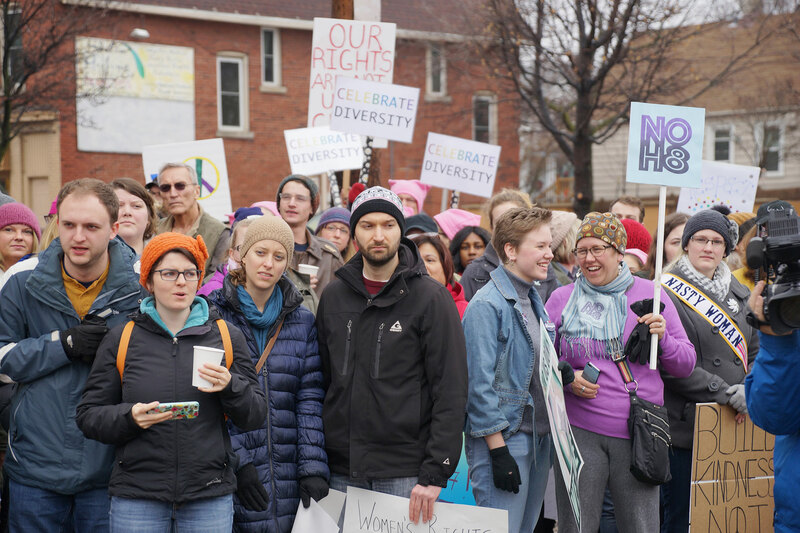 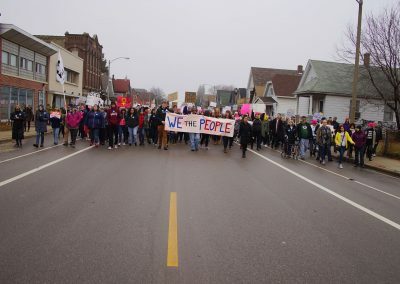 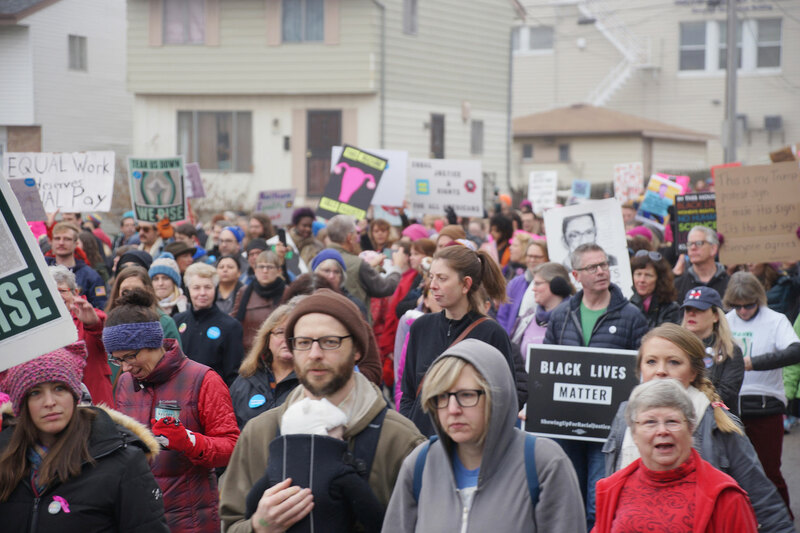 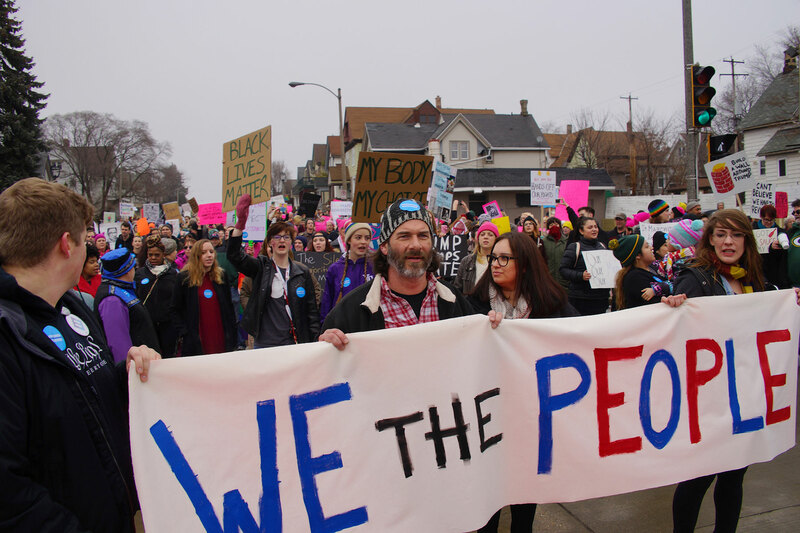 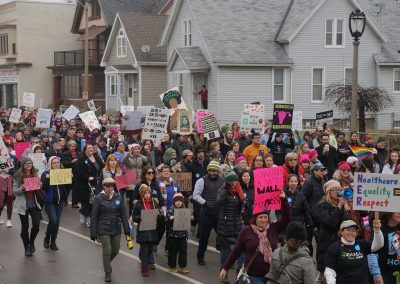 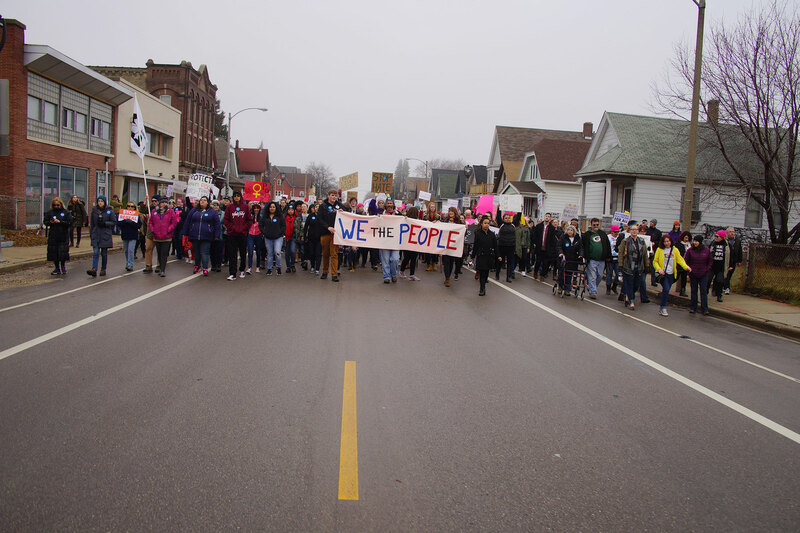 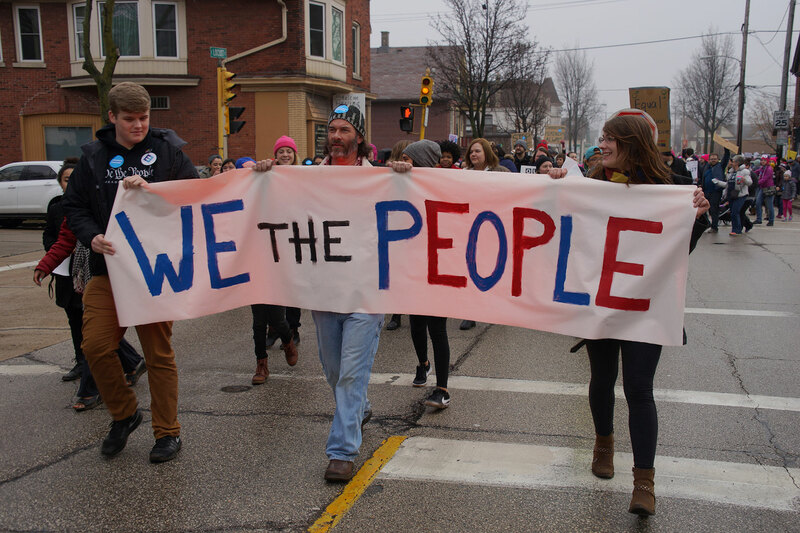 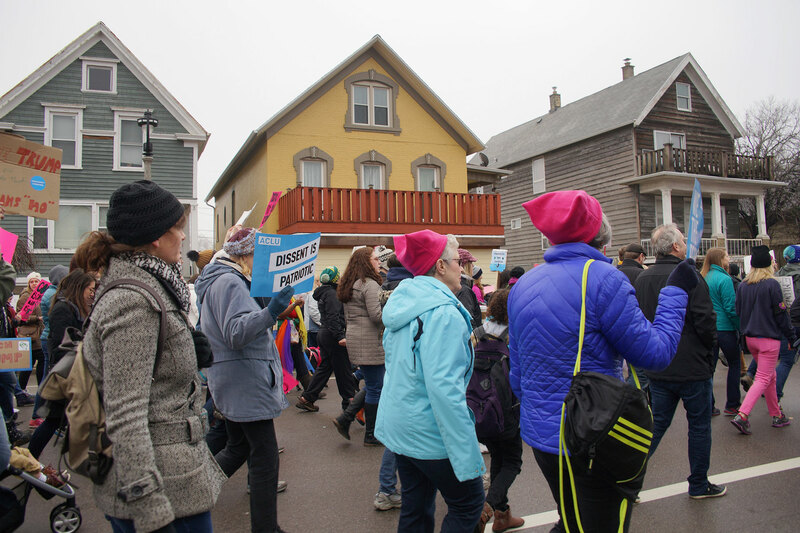 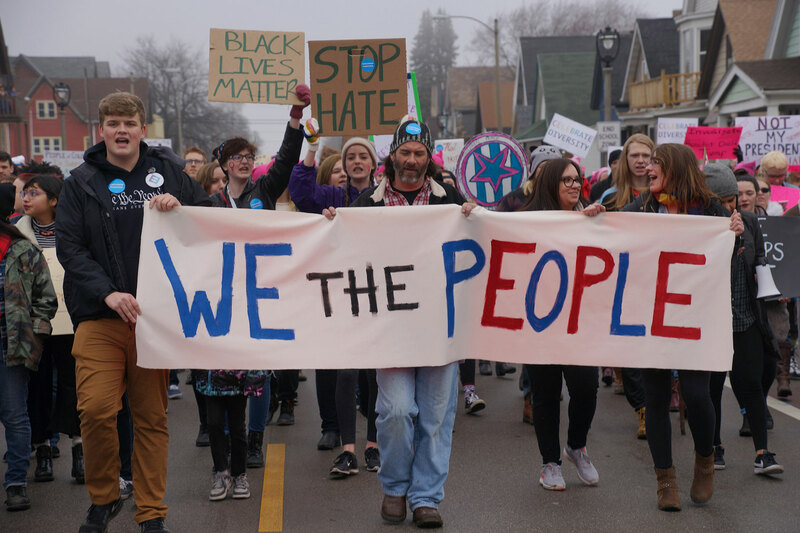 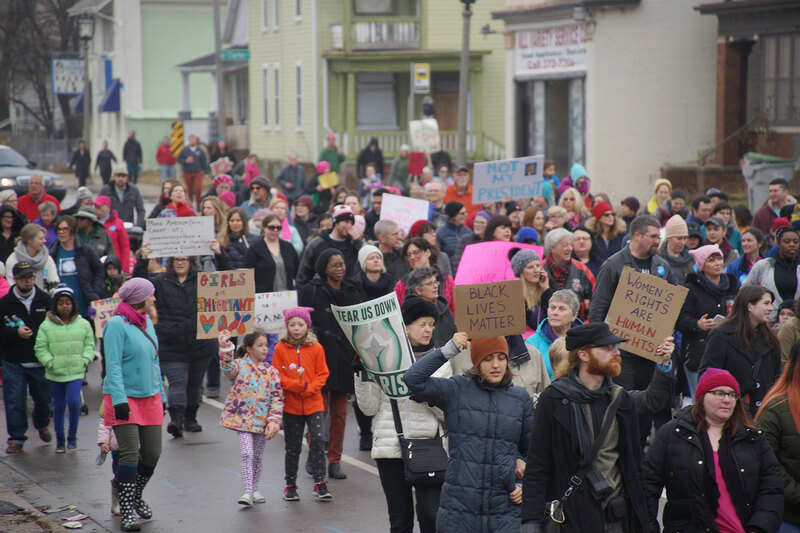 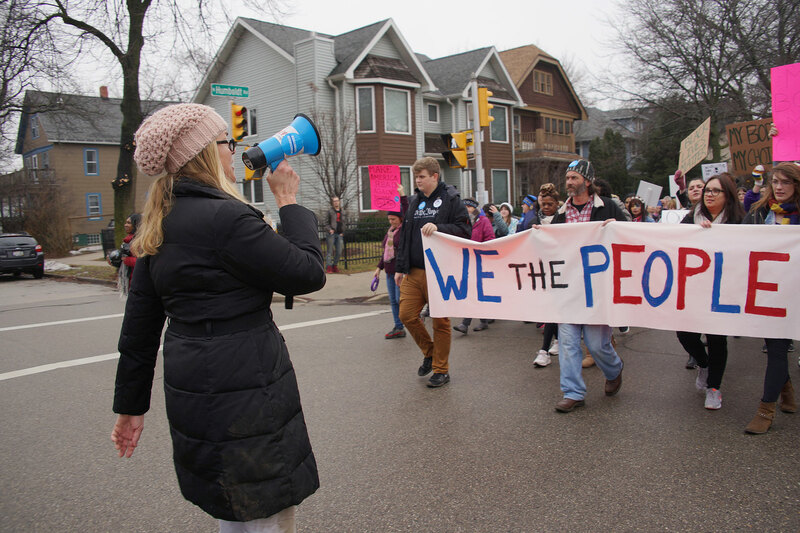 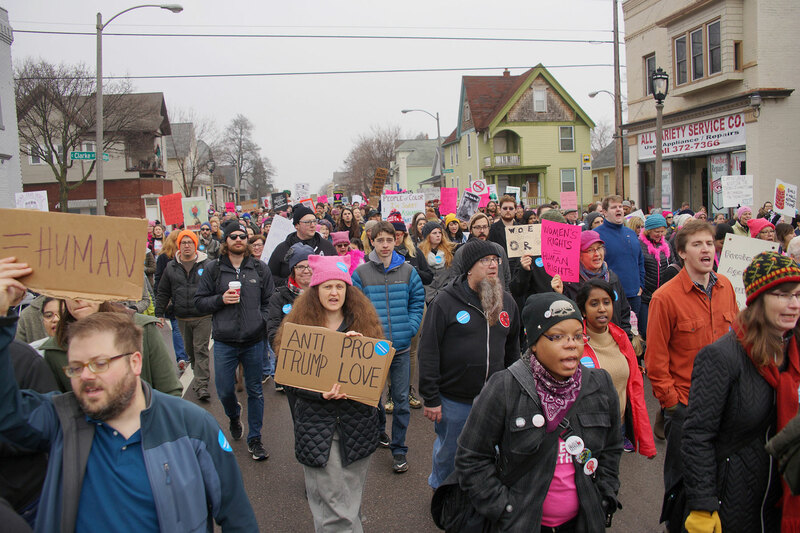 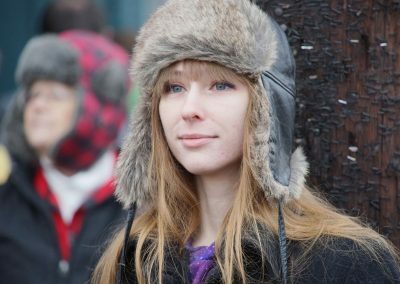 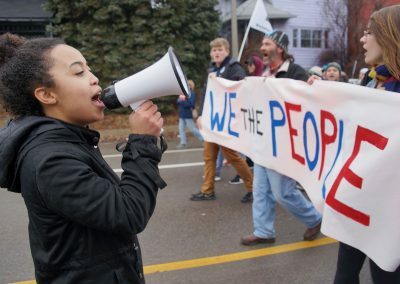 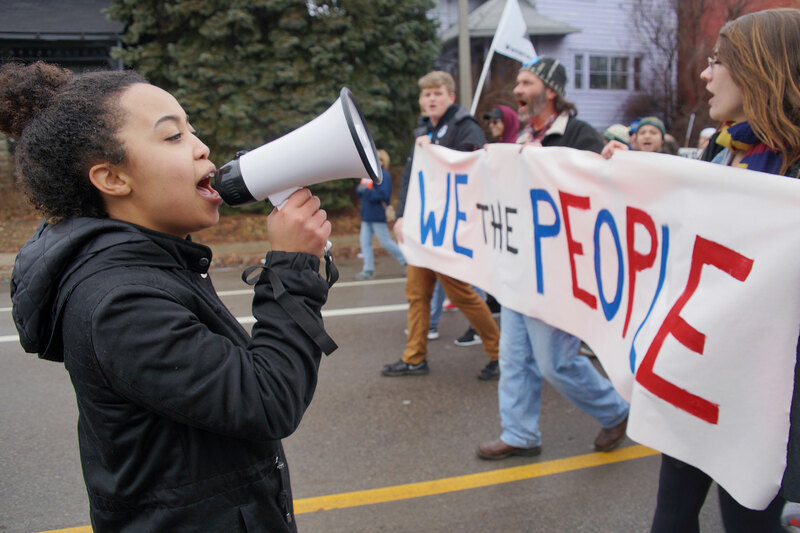 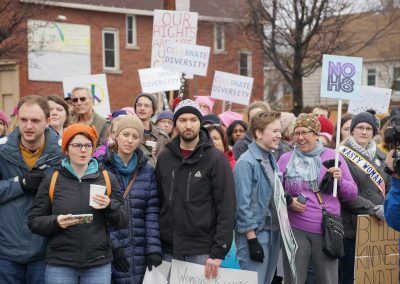 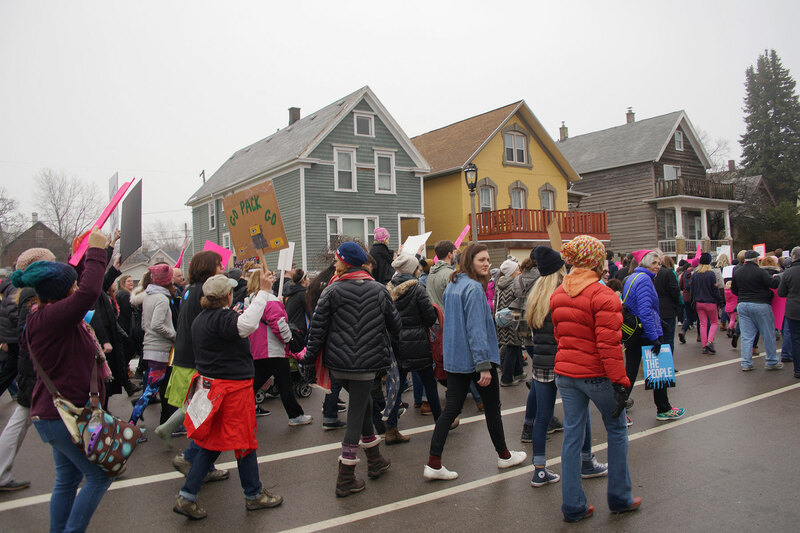 The crowd began with several hundred participants and snowballed into the thousands as the march passed peacefully through the streets of Riverwest. 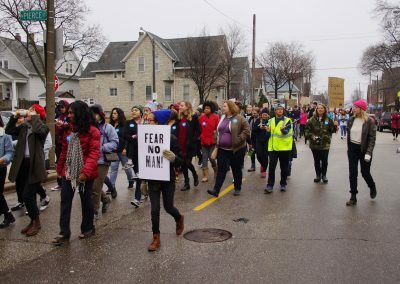 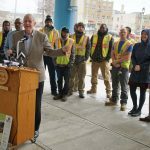 It was the second march in Milwaukee in less than 24 hours, in response to the policies of the newly sworn president and his administration. 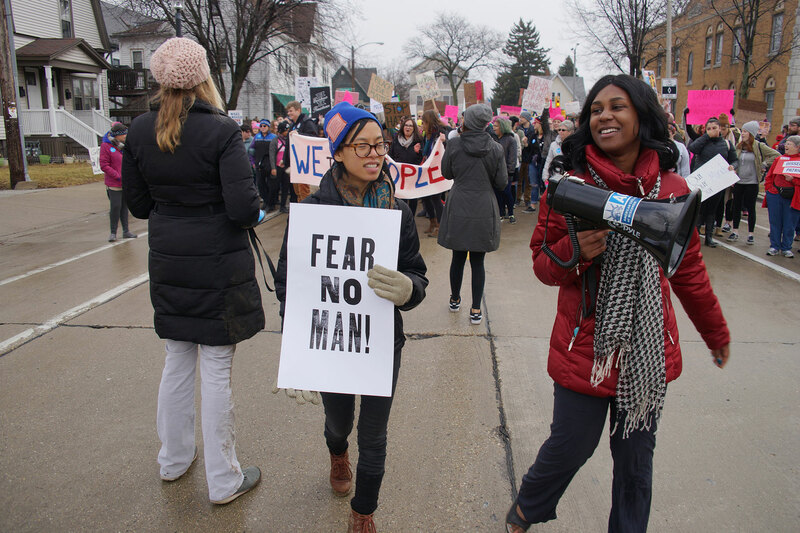 Just over 12 hours before, a protest was held in downtown Milwaukee. 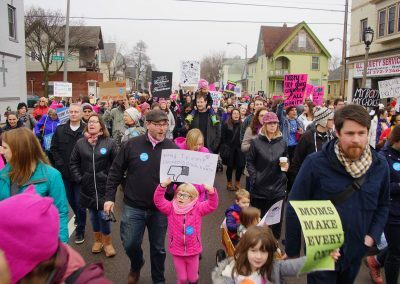 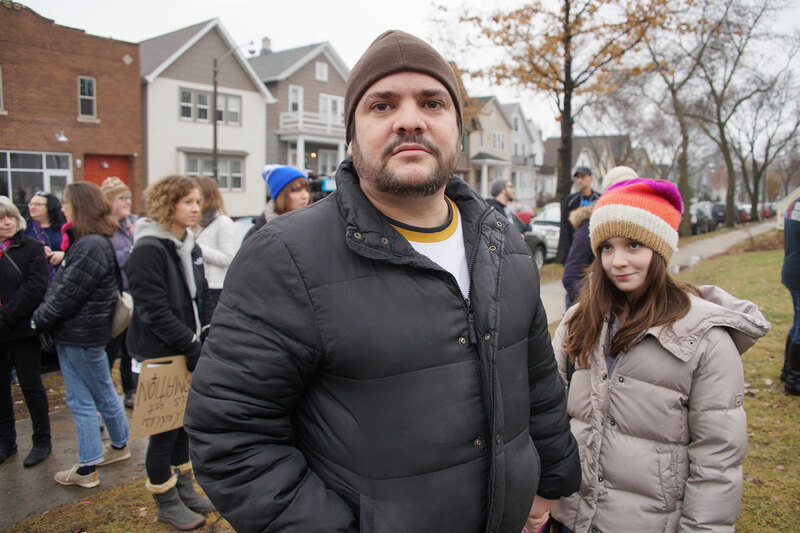 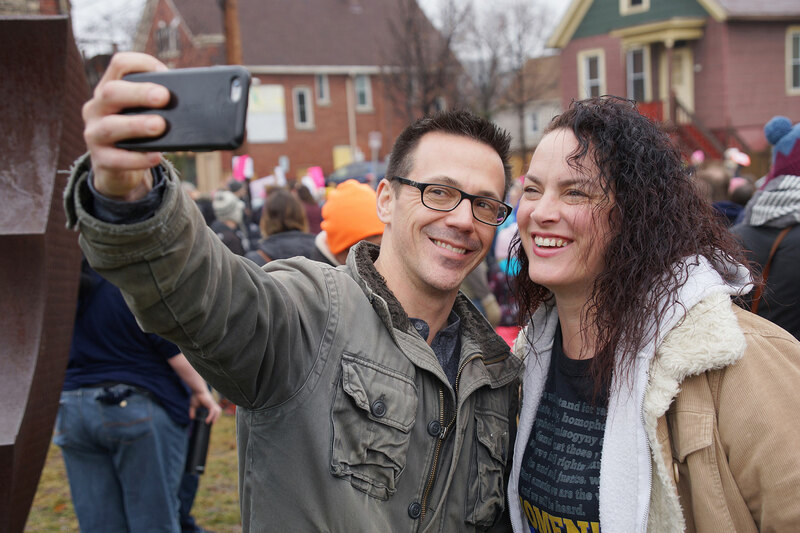 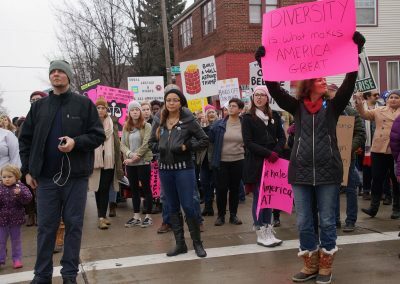 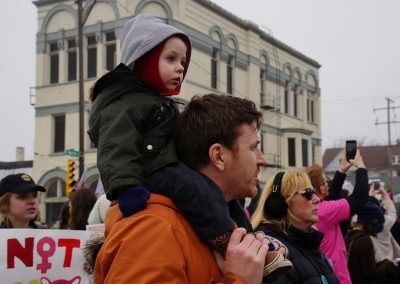 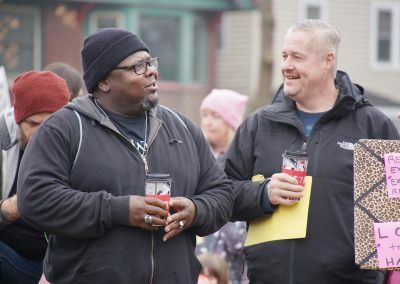 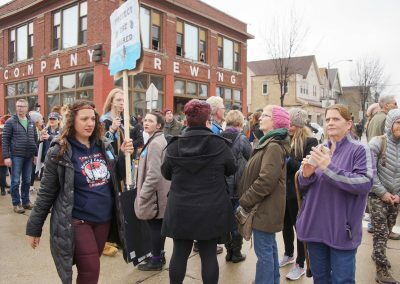 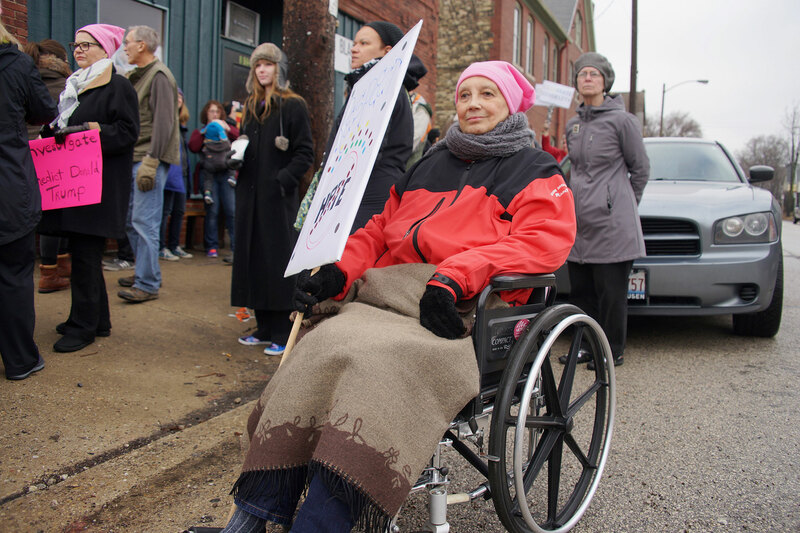 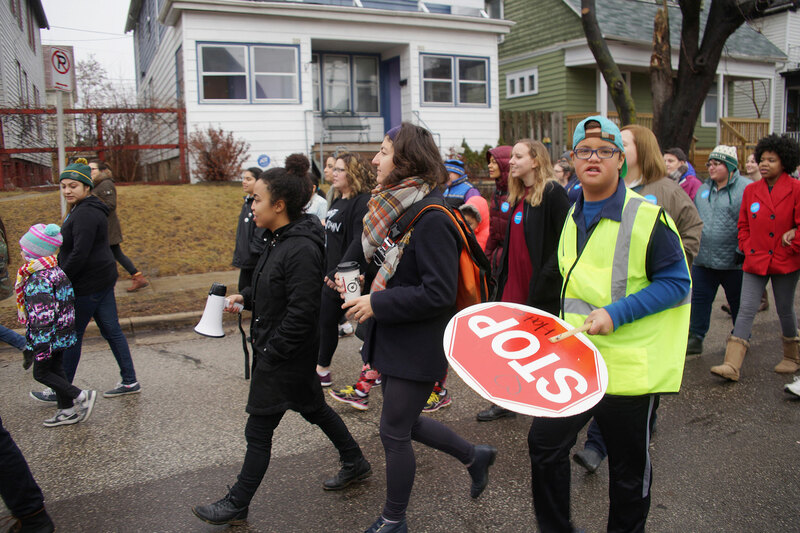 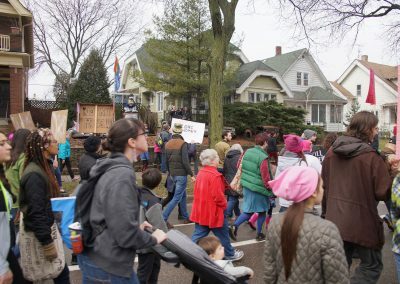 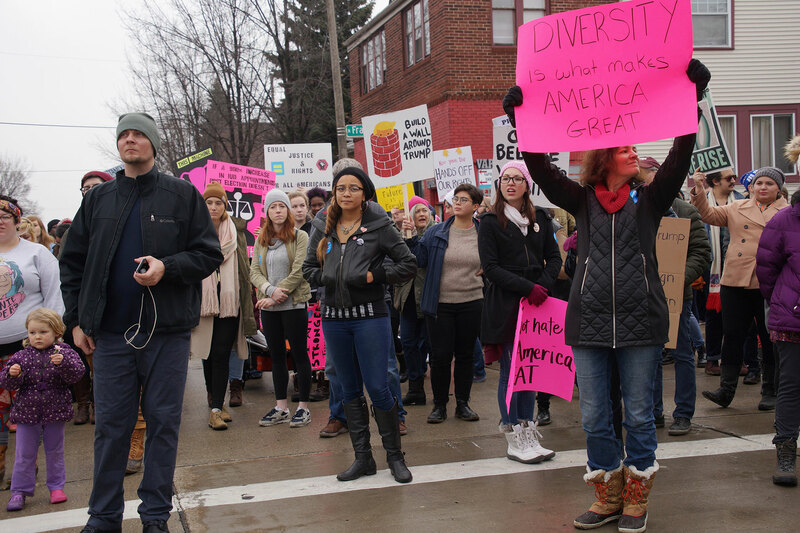 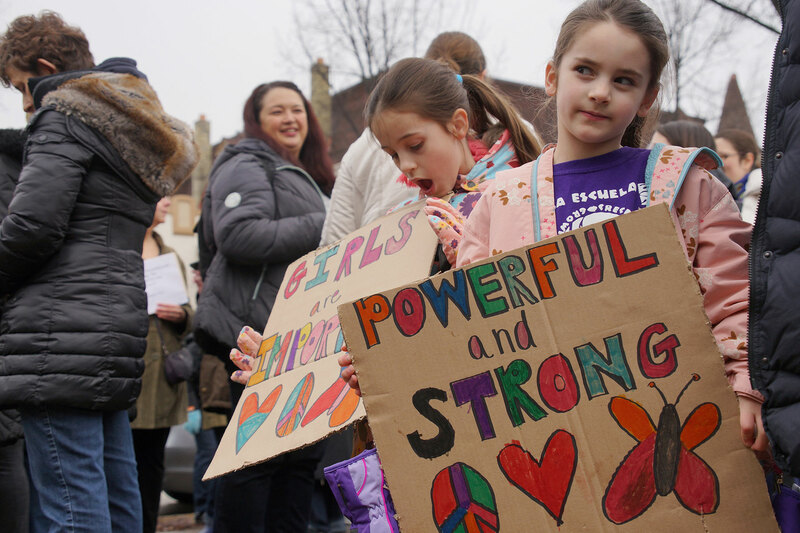 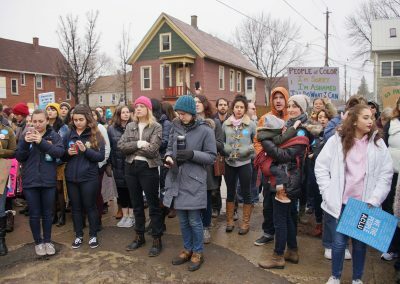 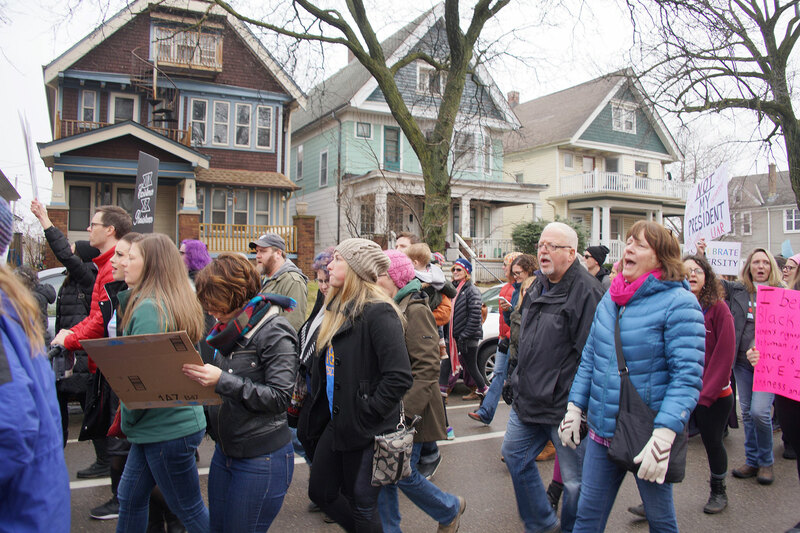 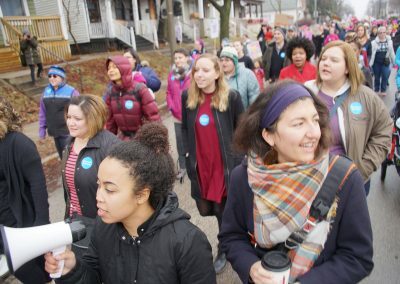 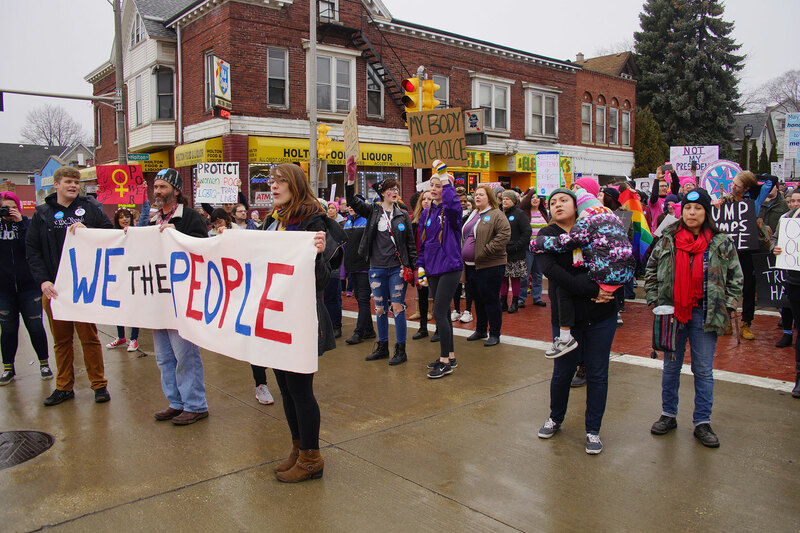 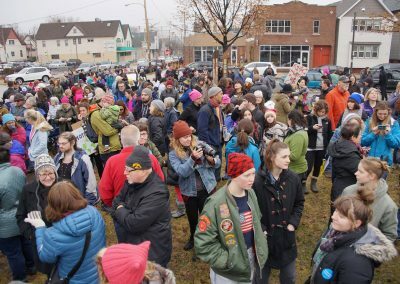 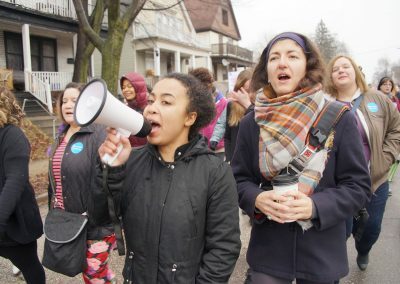 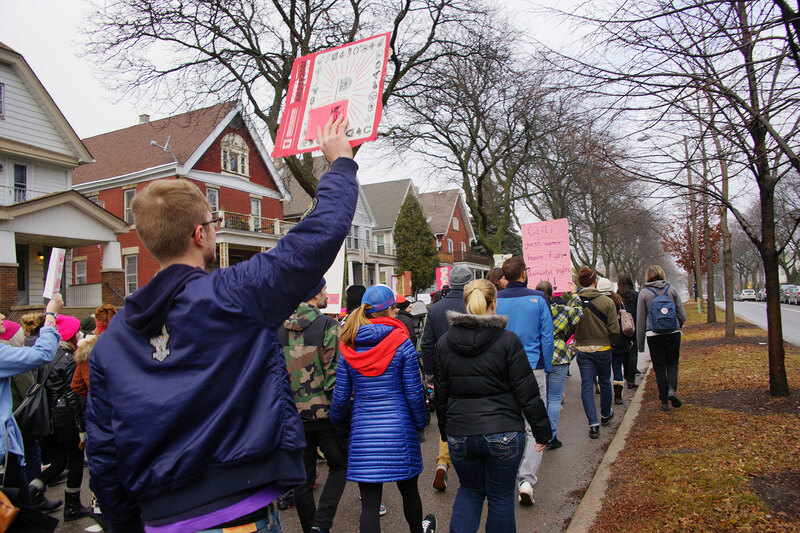 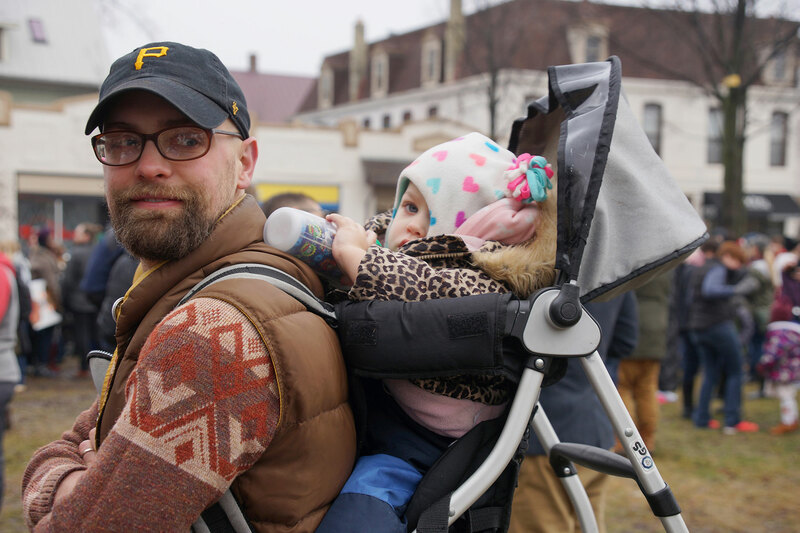 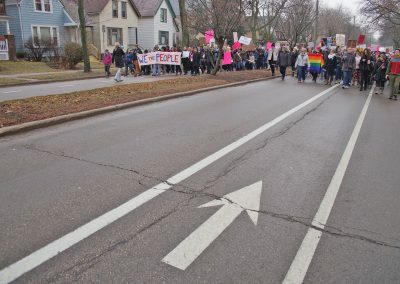 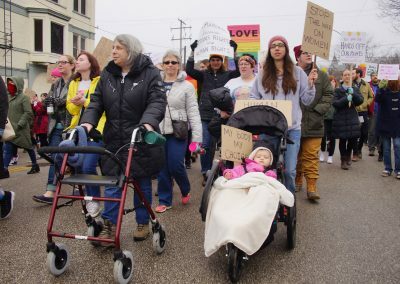 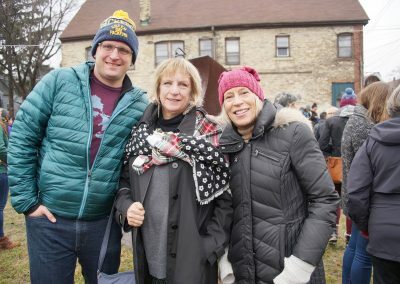 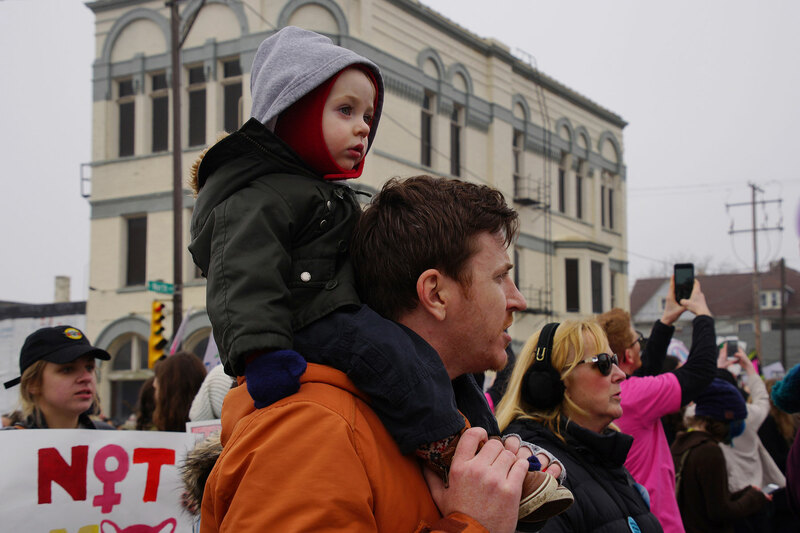 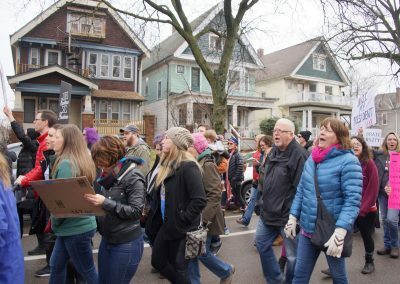 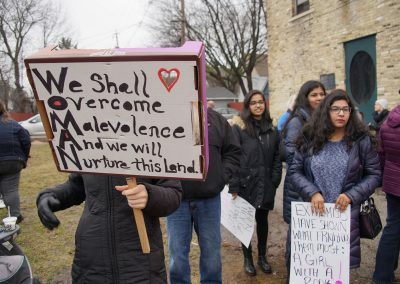 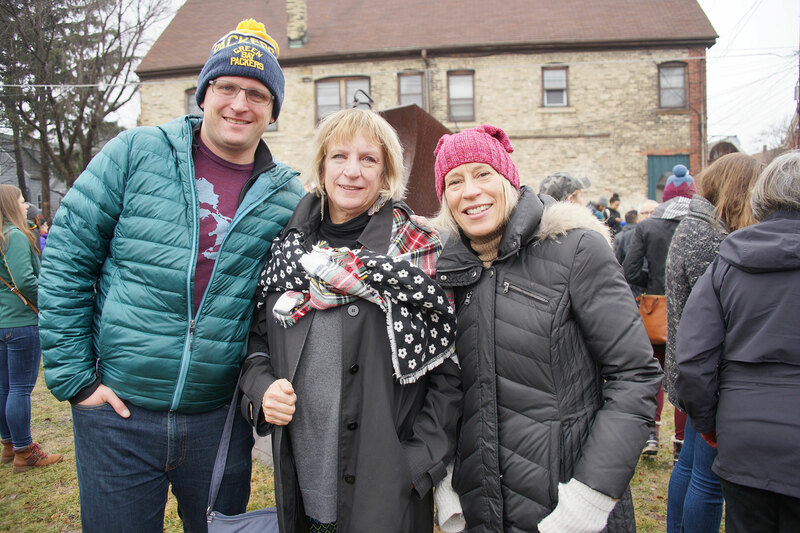 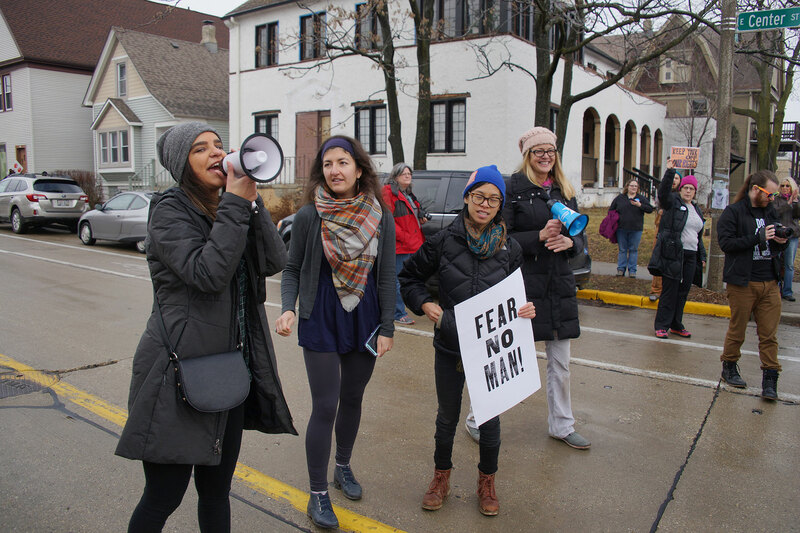 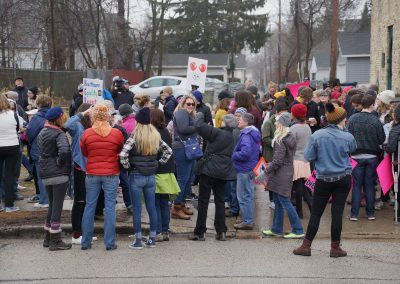 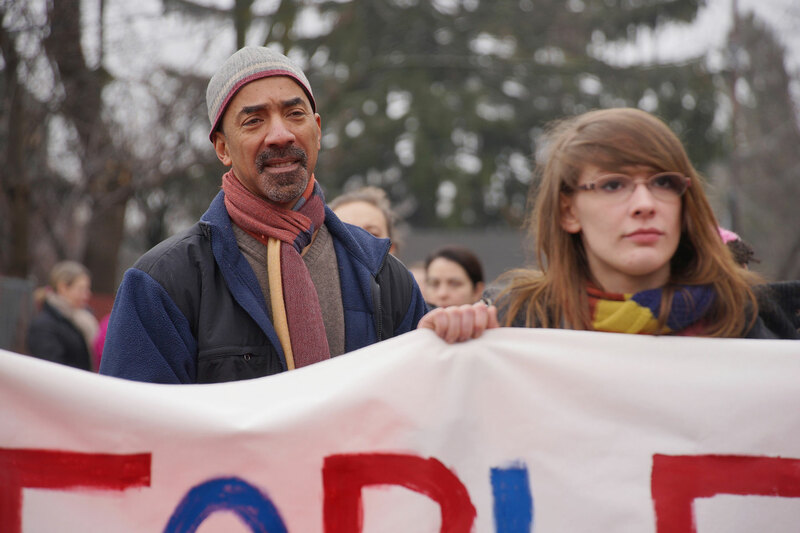 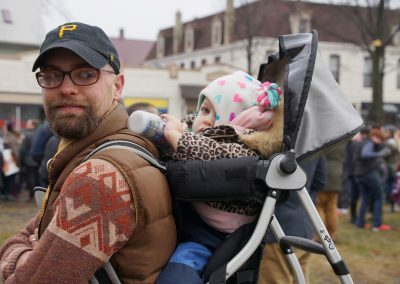 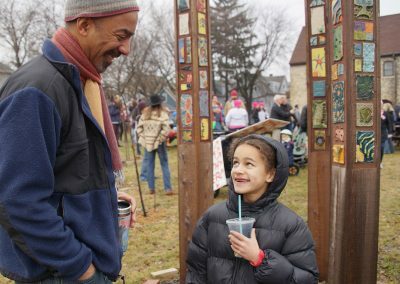 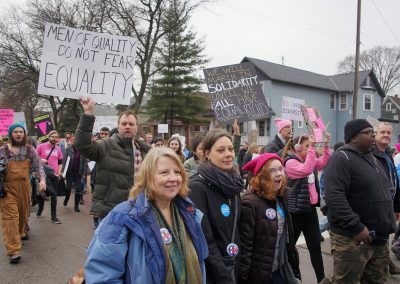 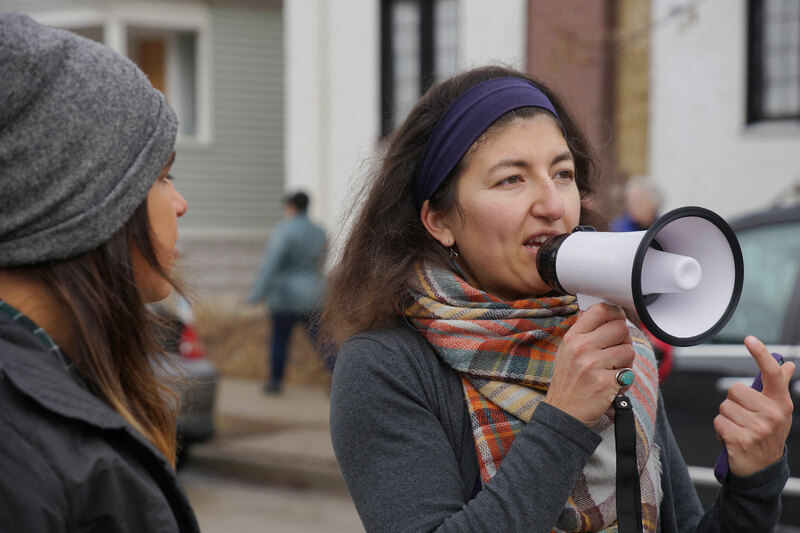 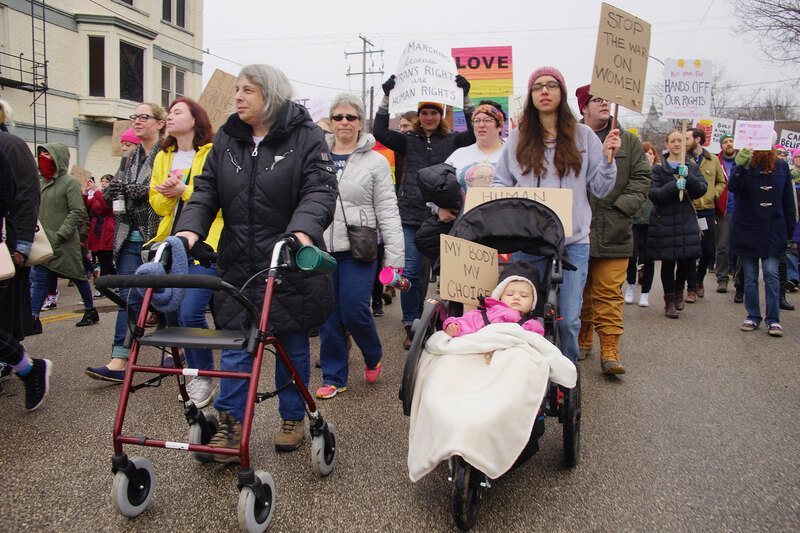 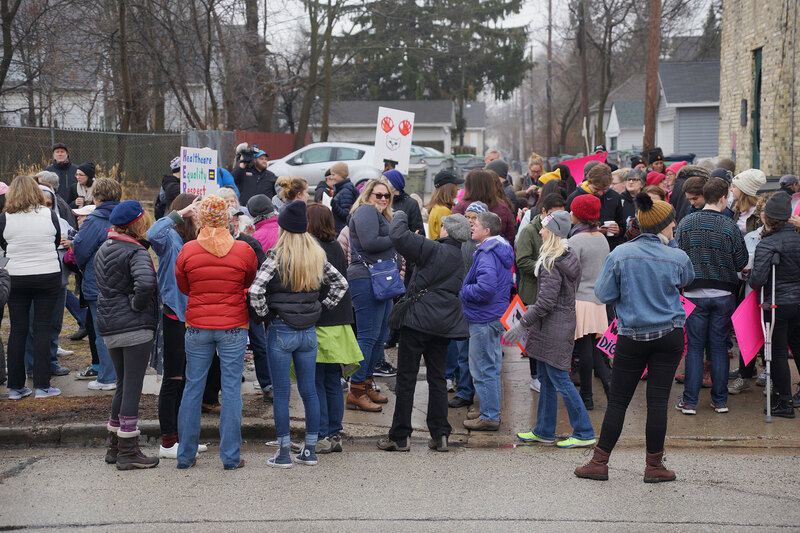 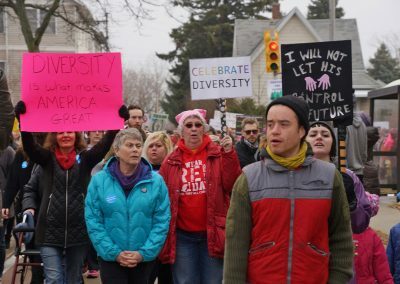 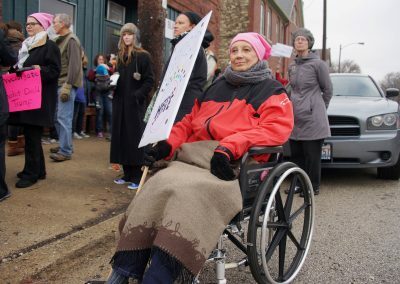 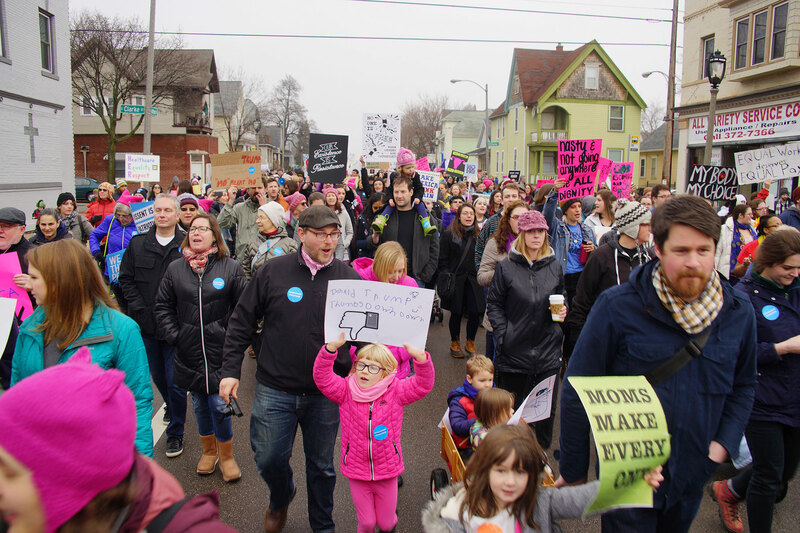 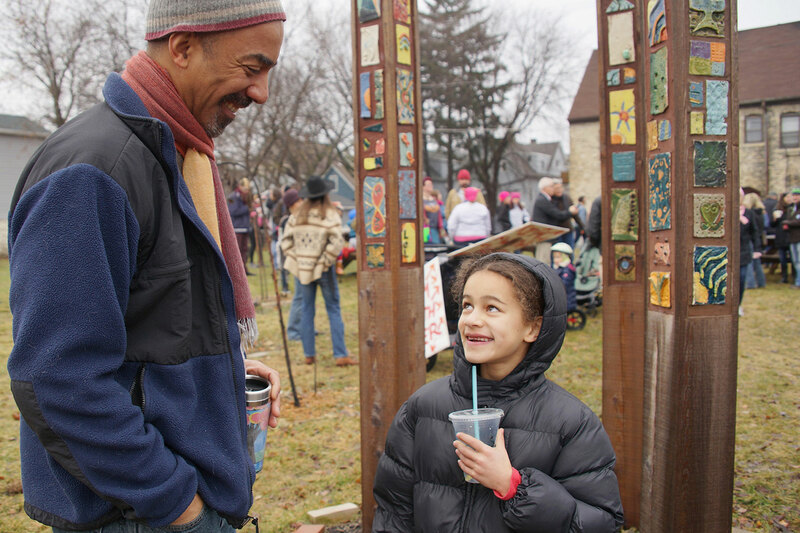 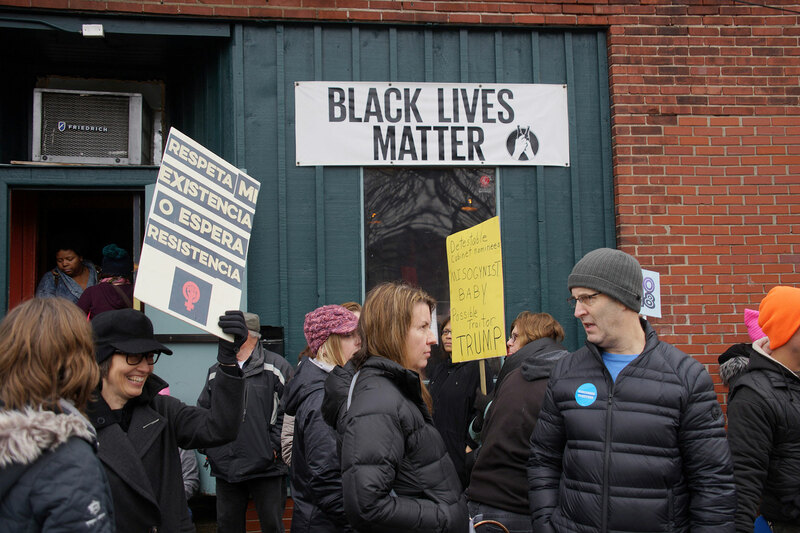 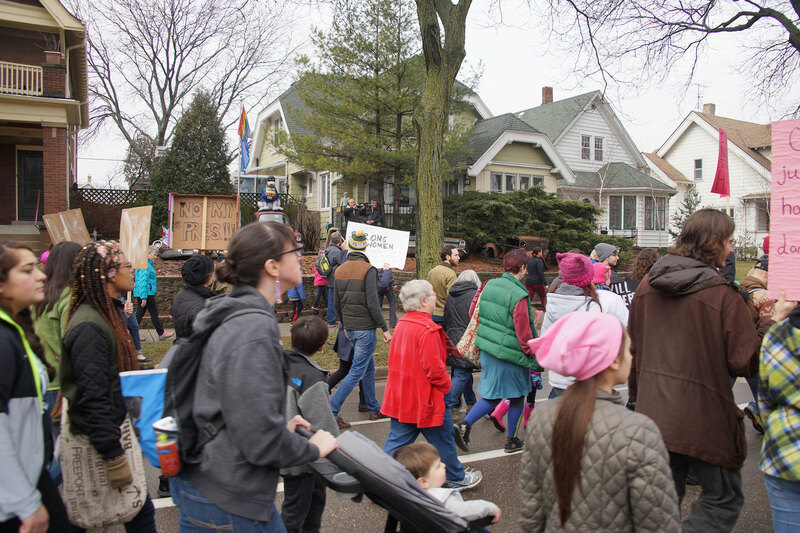 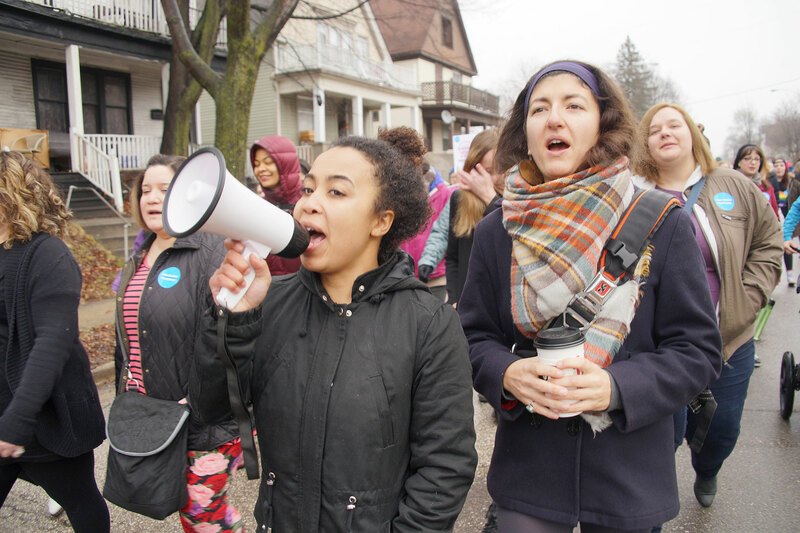 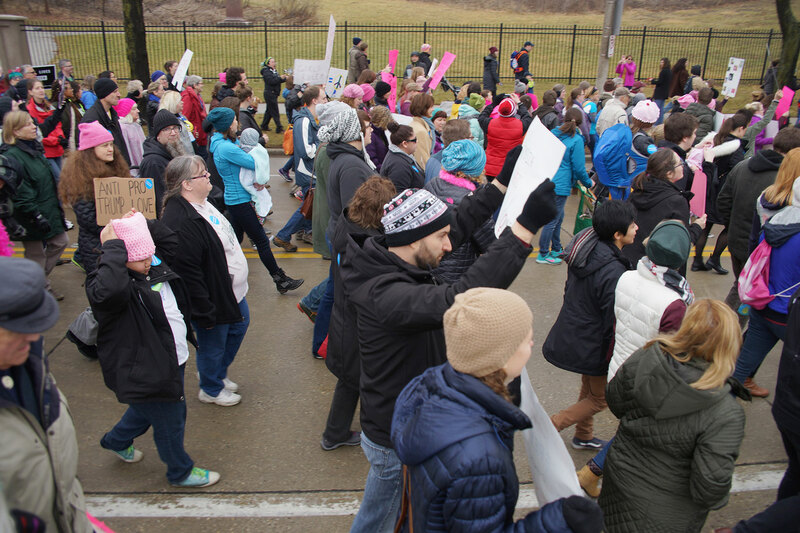 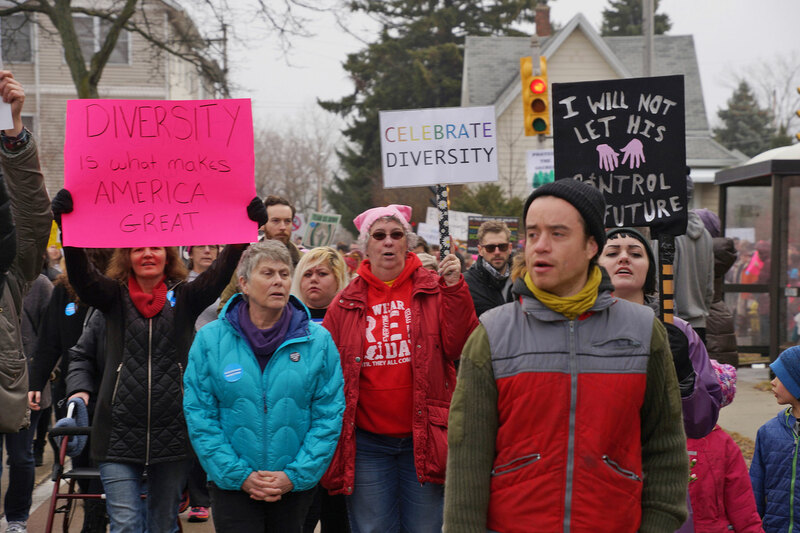 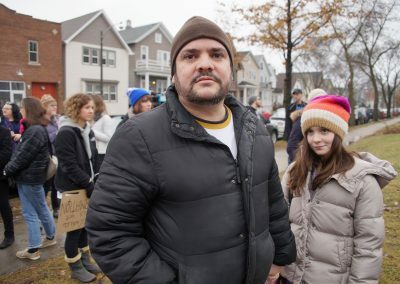 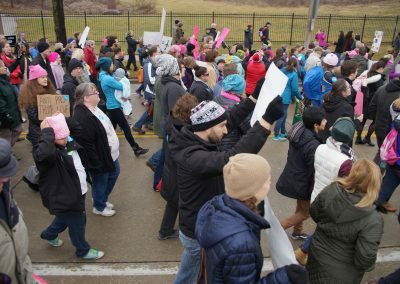 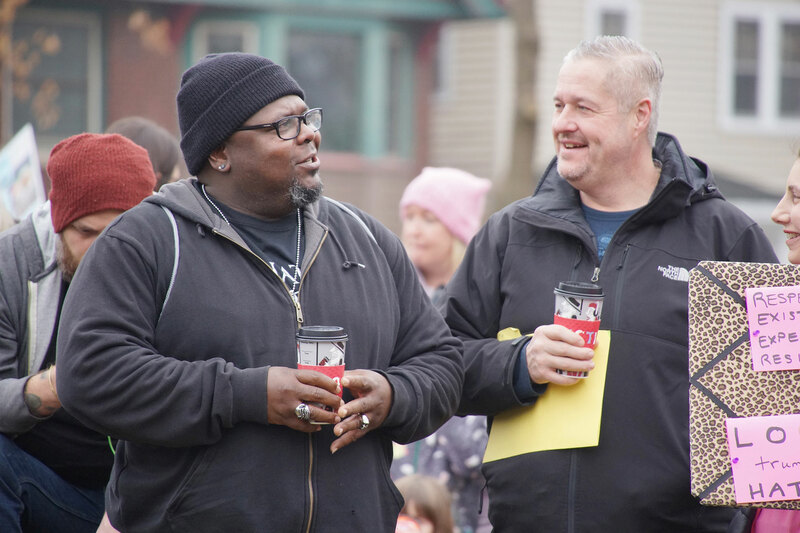 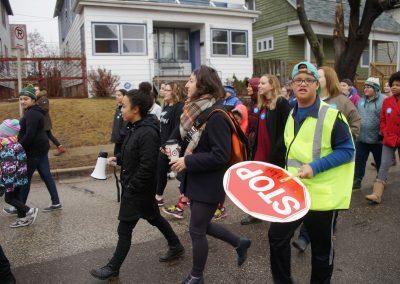 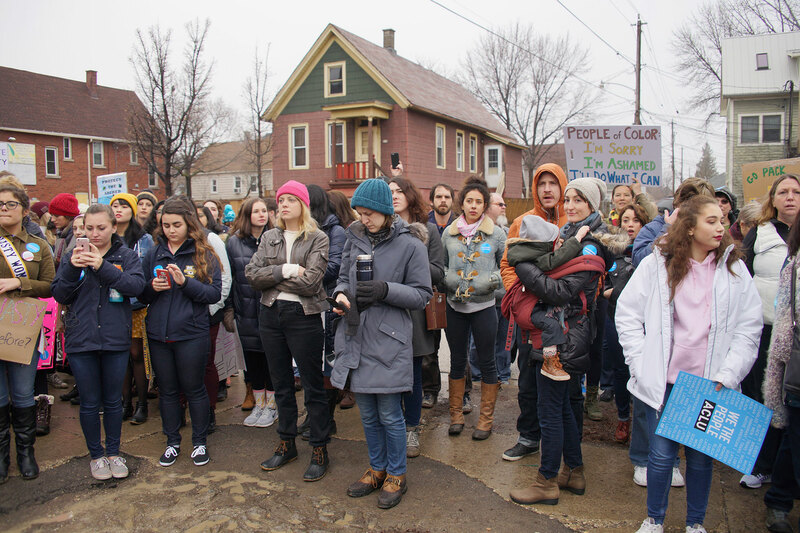 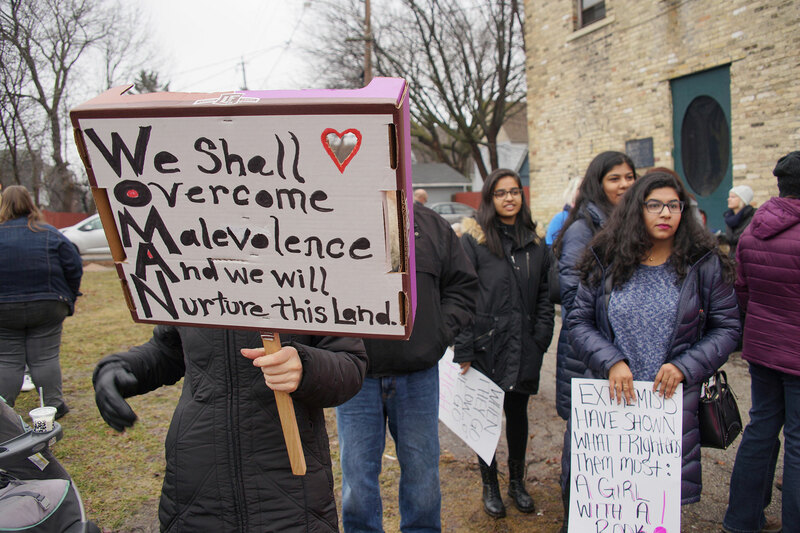 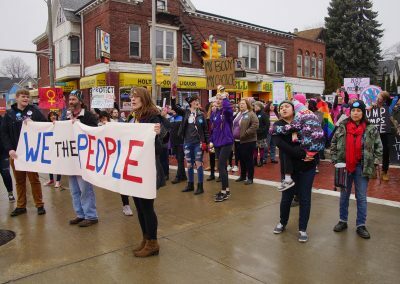 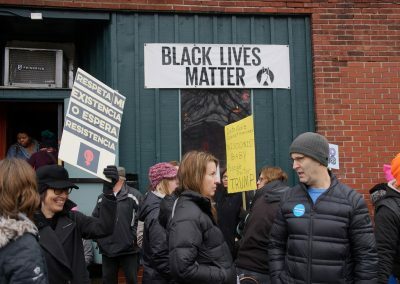 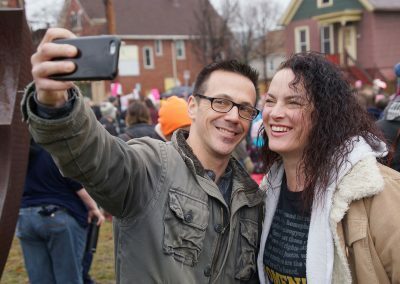 While those marchers were also peaceful and diverse, the residential location of Riverwest made the solidarity march much more of a family event. 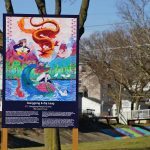 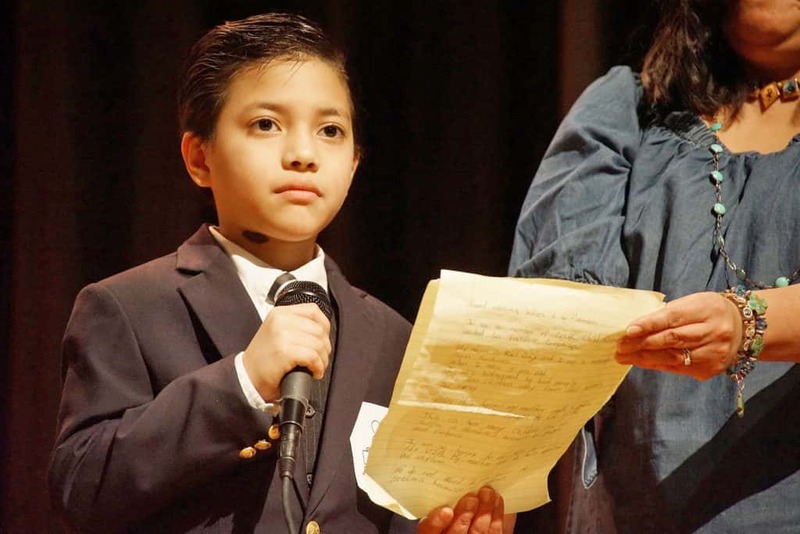 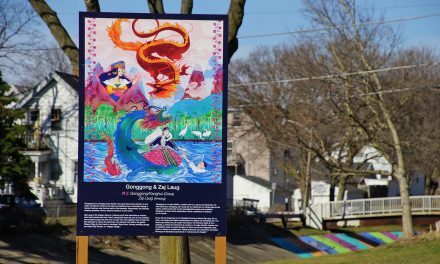 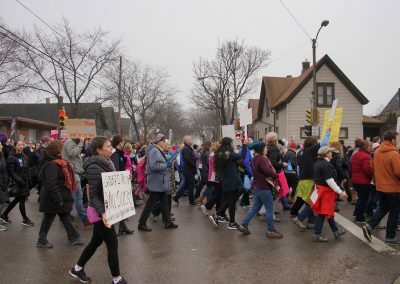 It was also a reflection of the vibrant community’s values and shared concern for the protection of rights, safety, and health of local children. 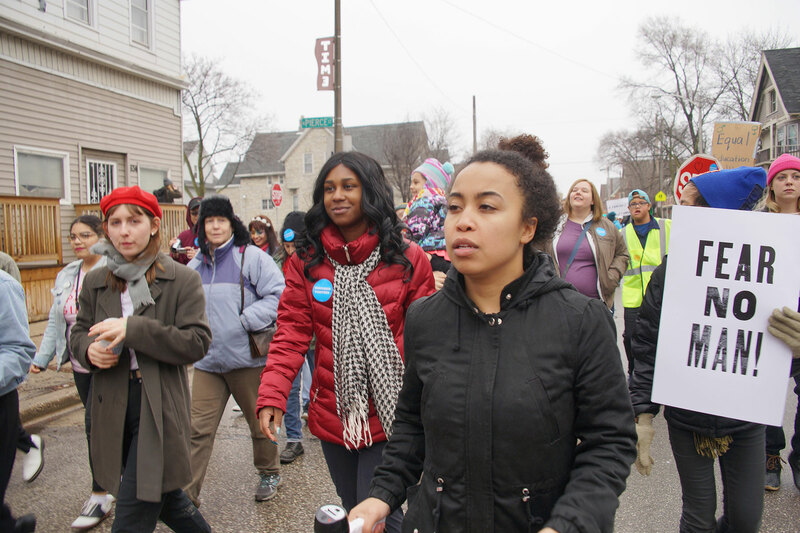 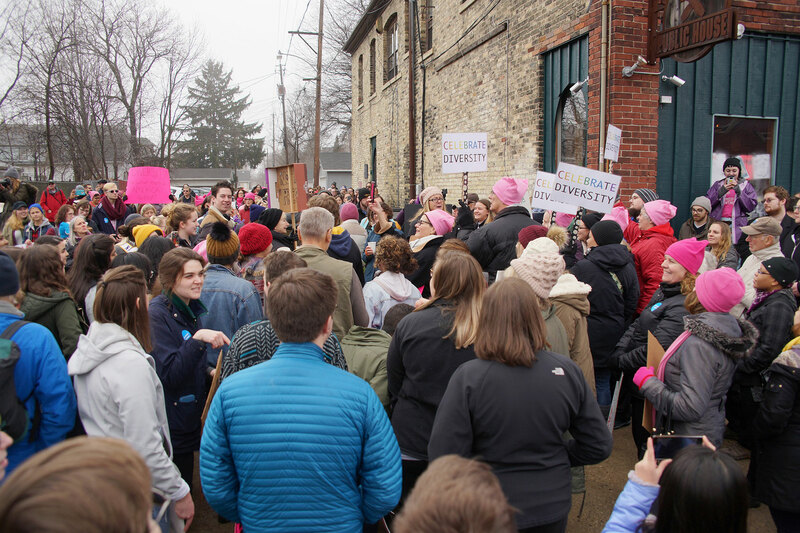 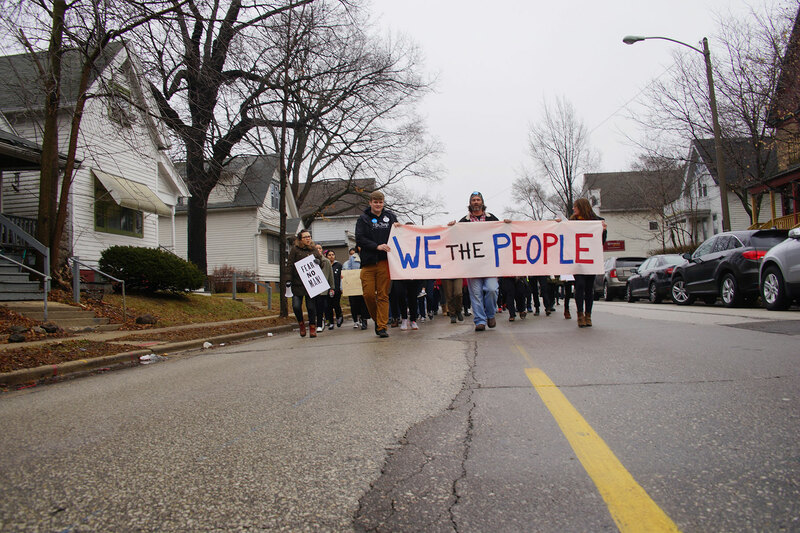 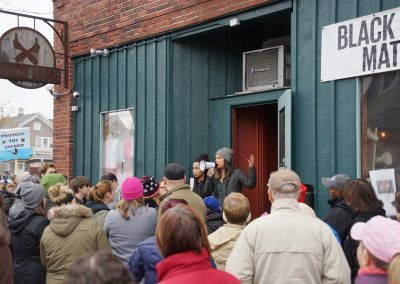 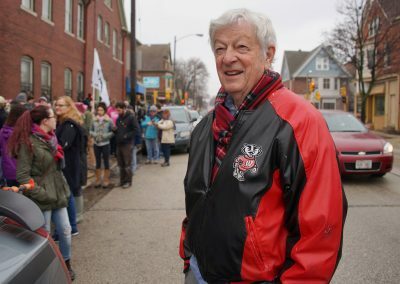 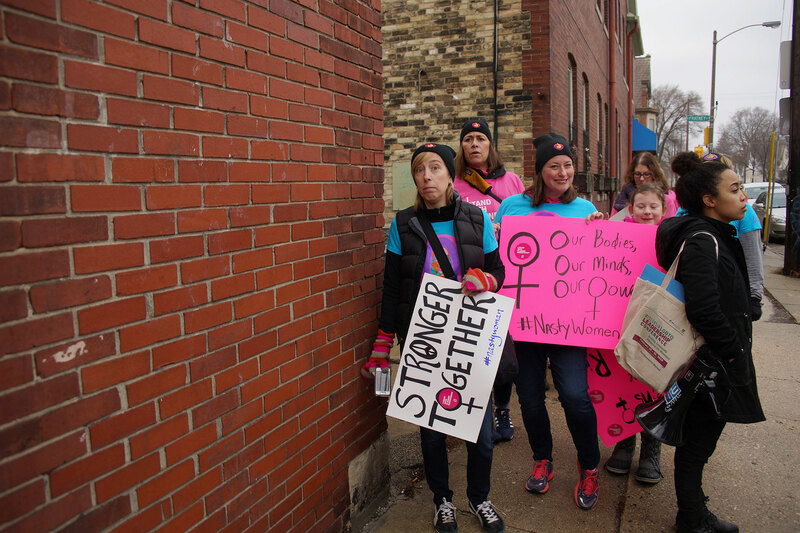 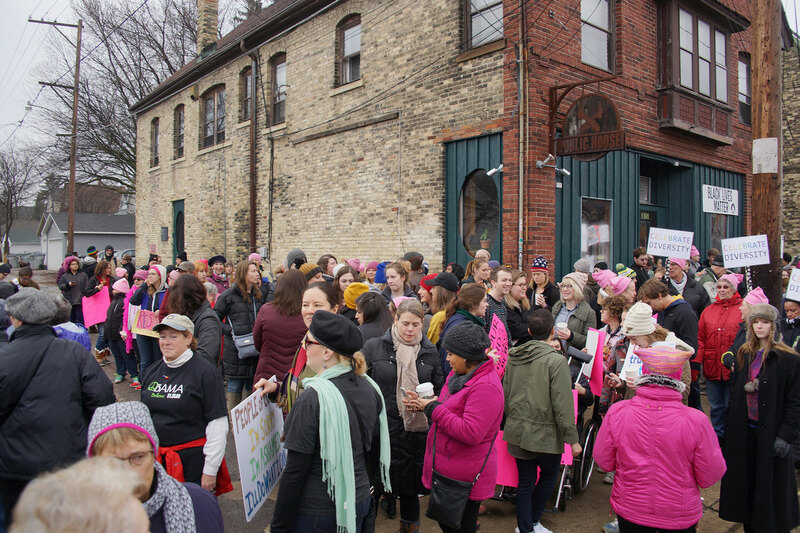 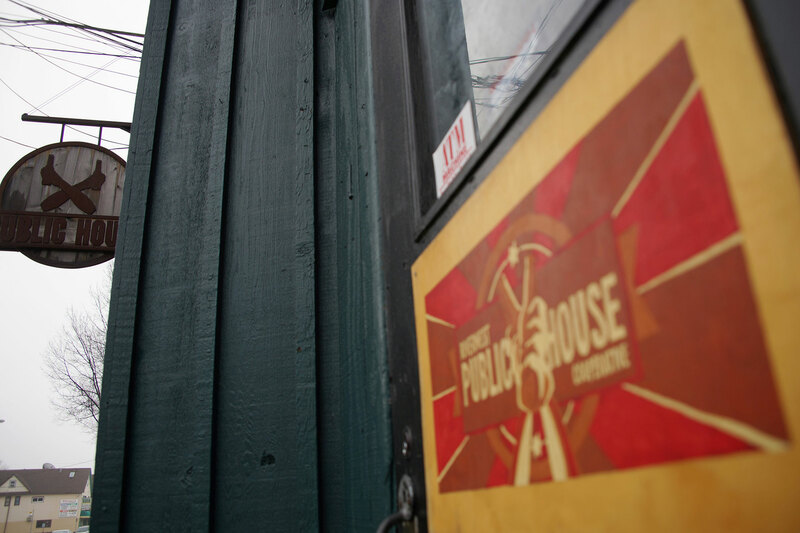 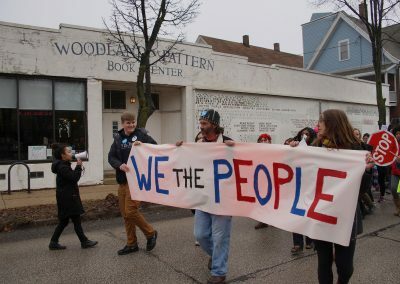 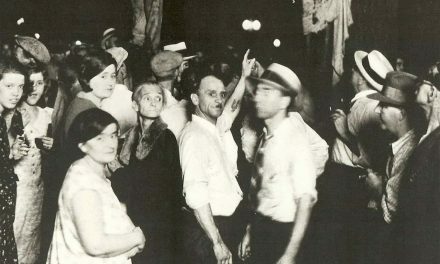 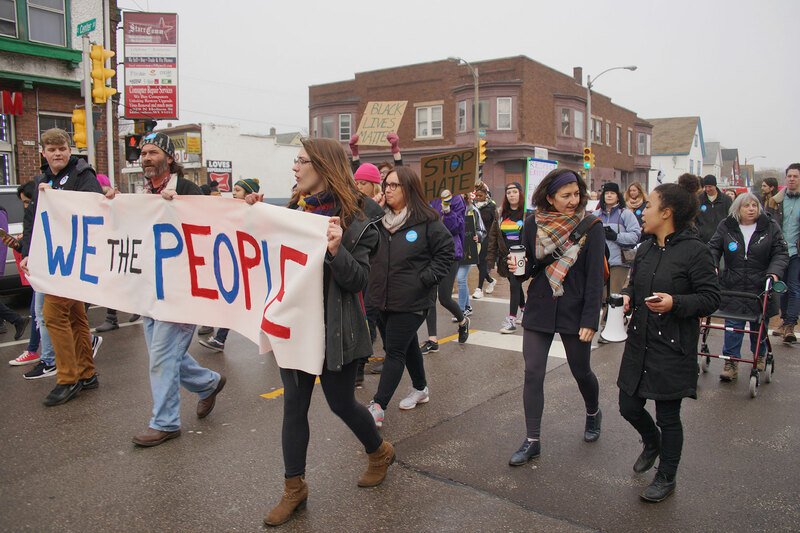 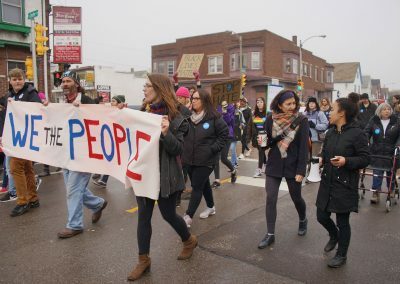 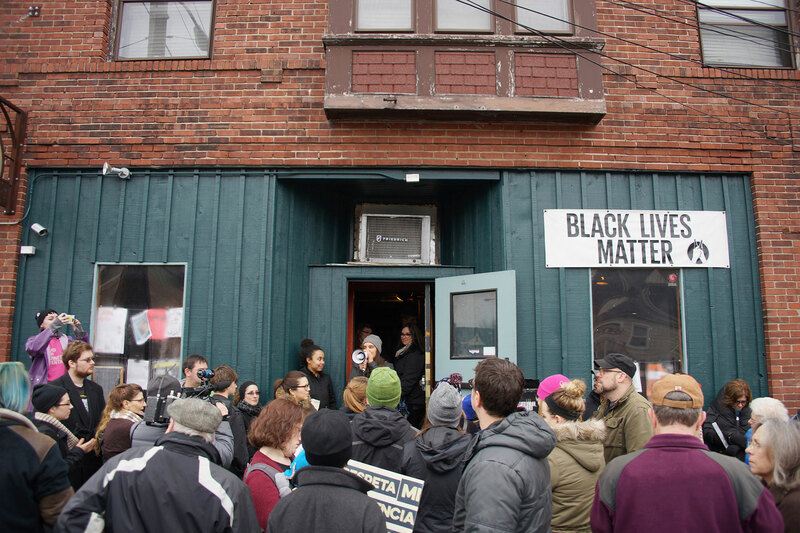 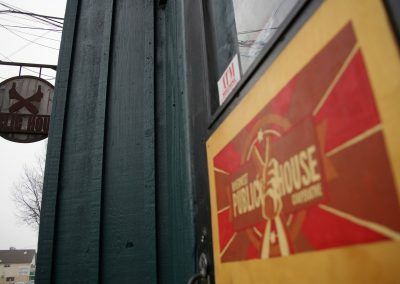 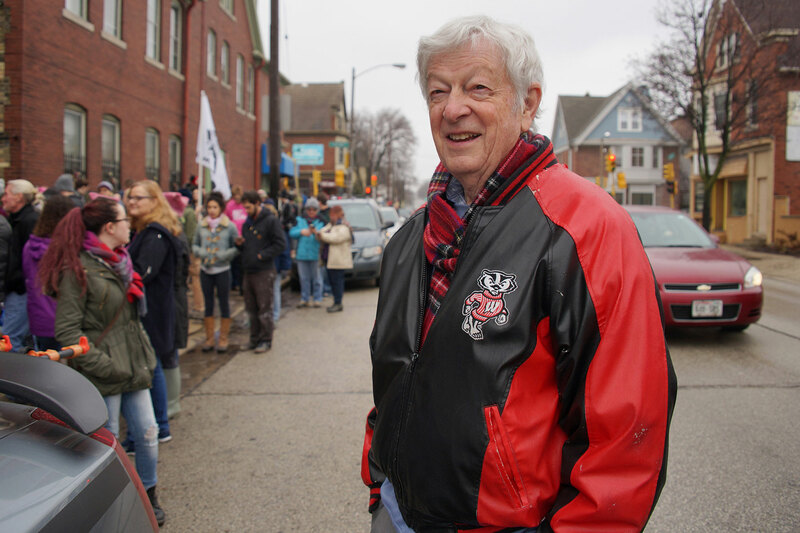 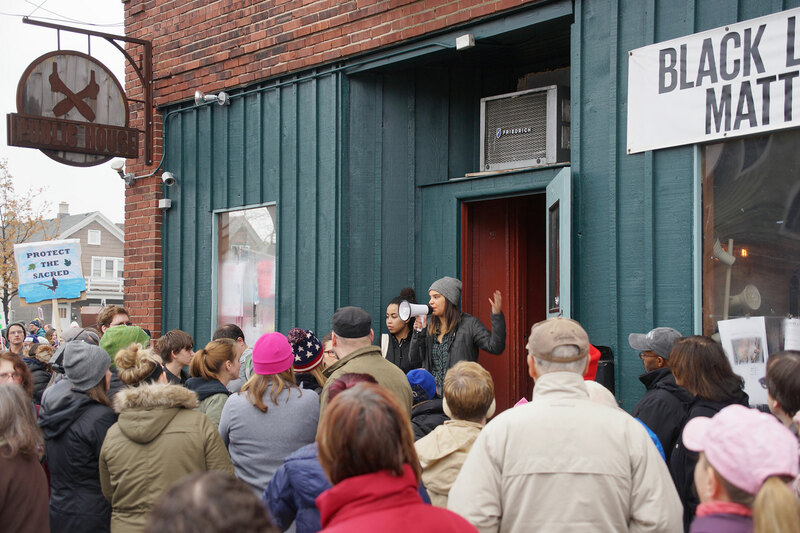 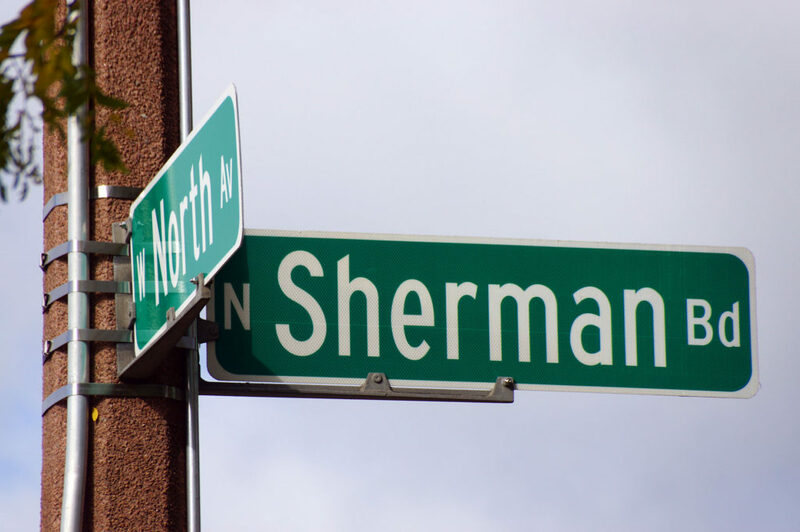 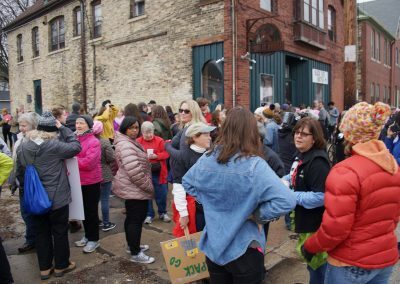 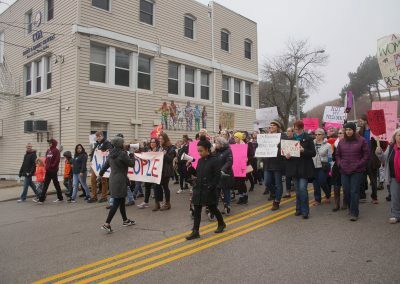 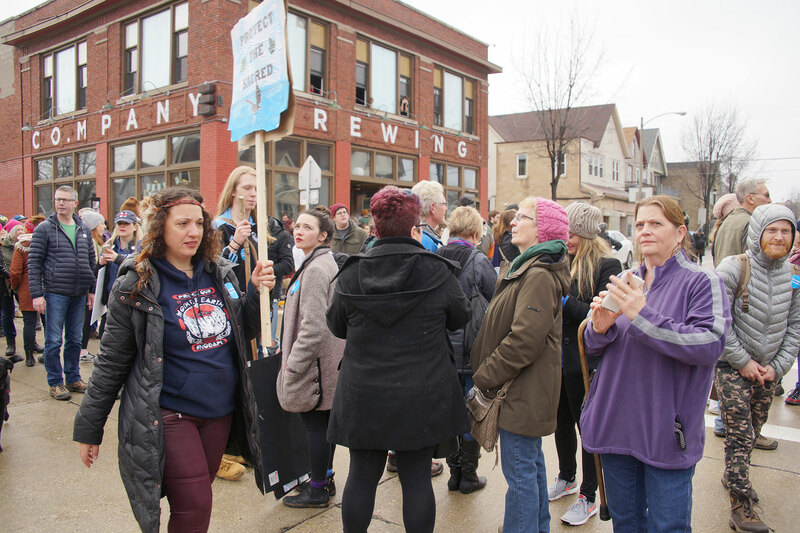 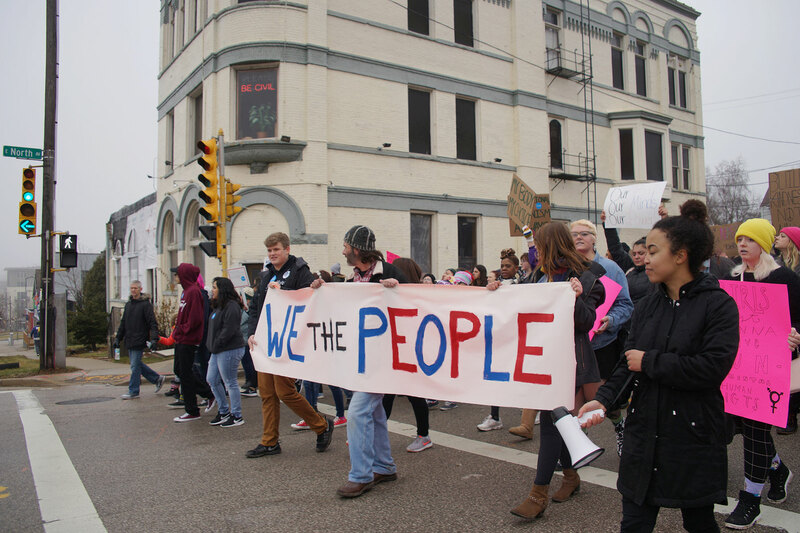 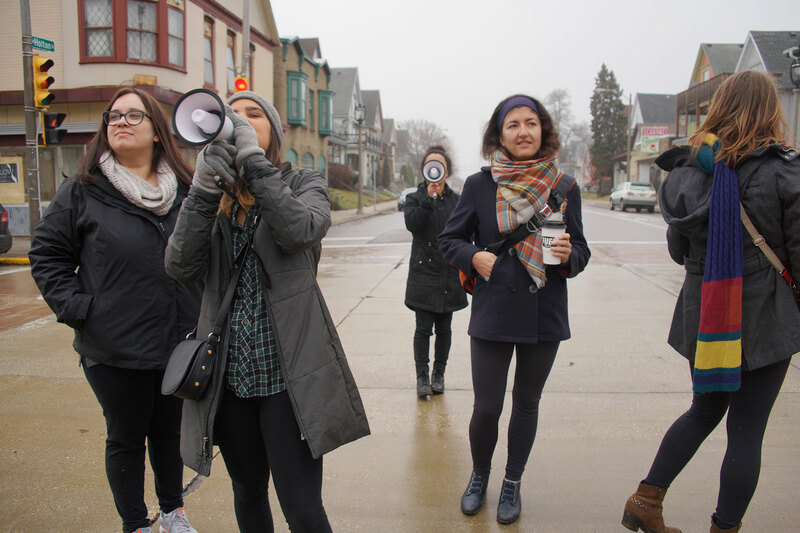 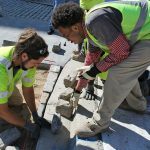 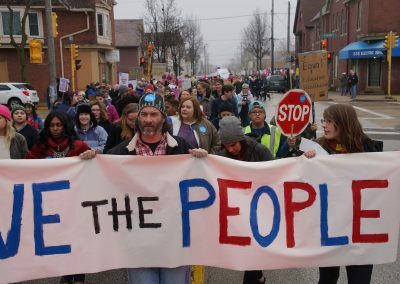 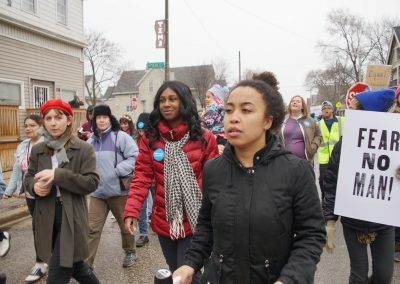 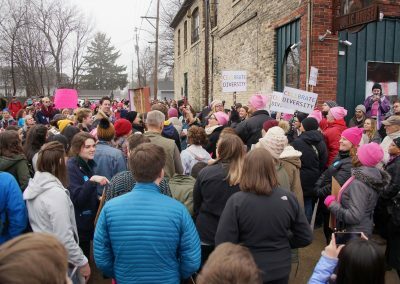 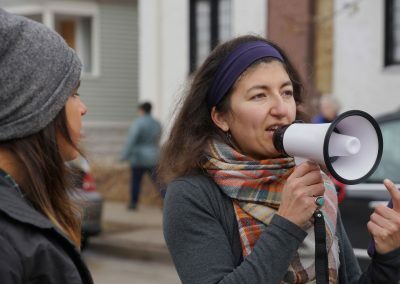 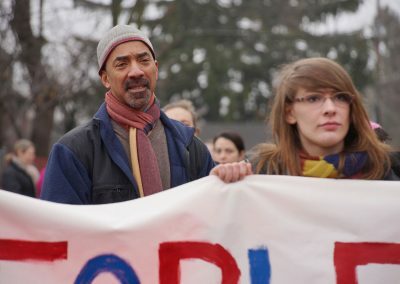 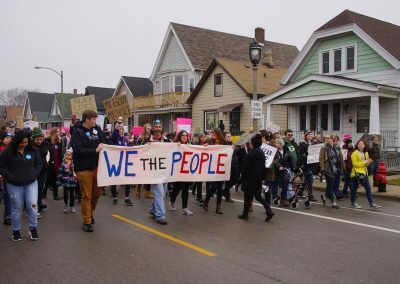 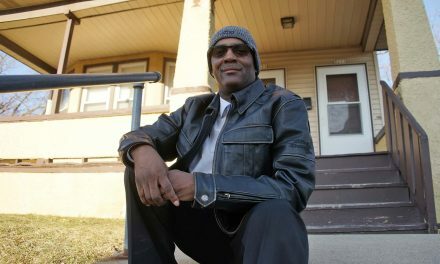 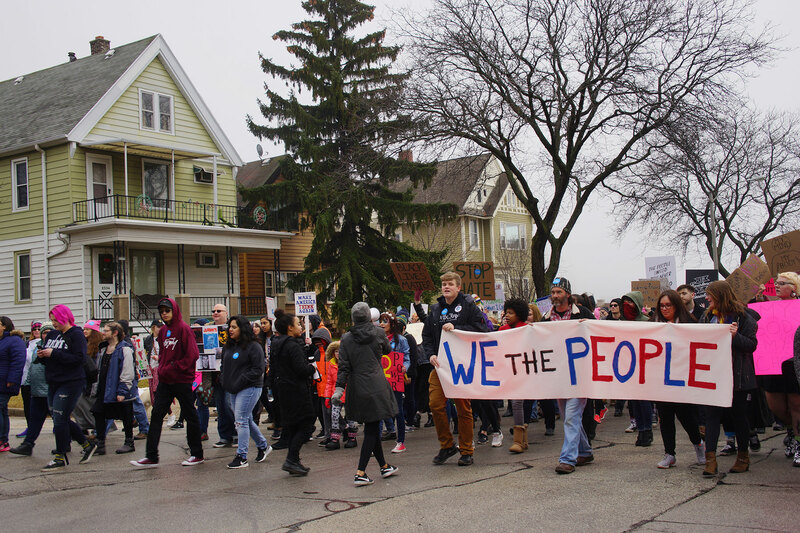 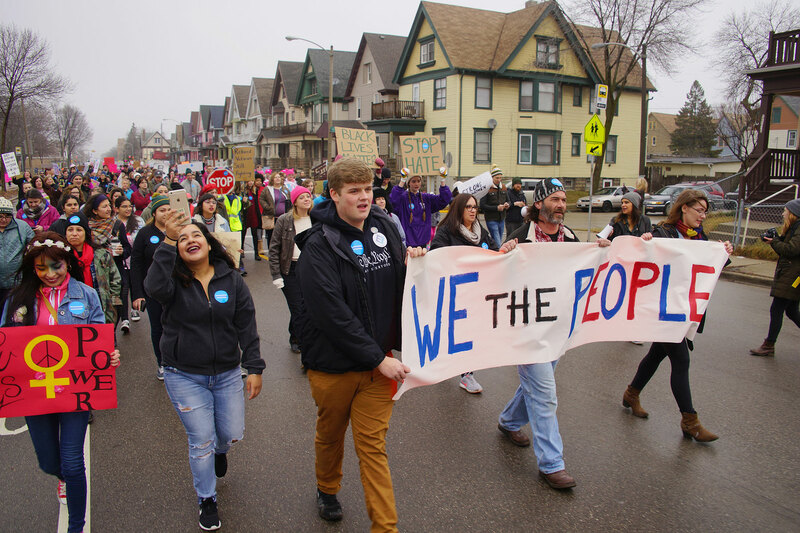 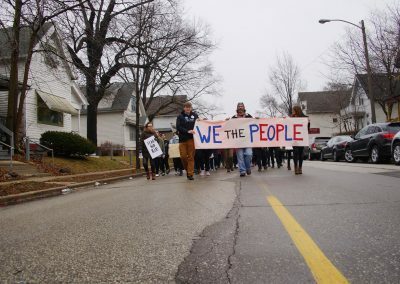 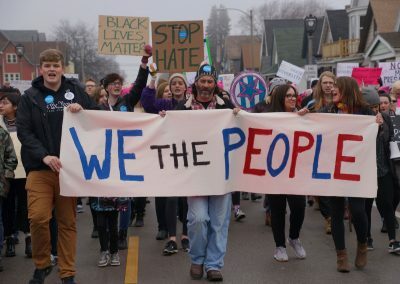 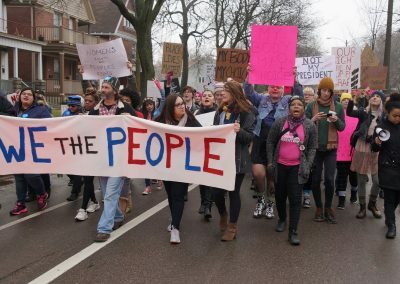 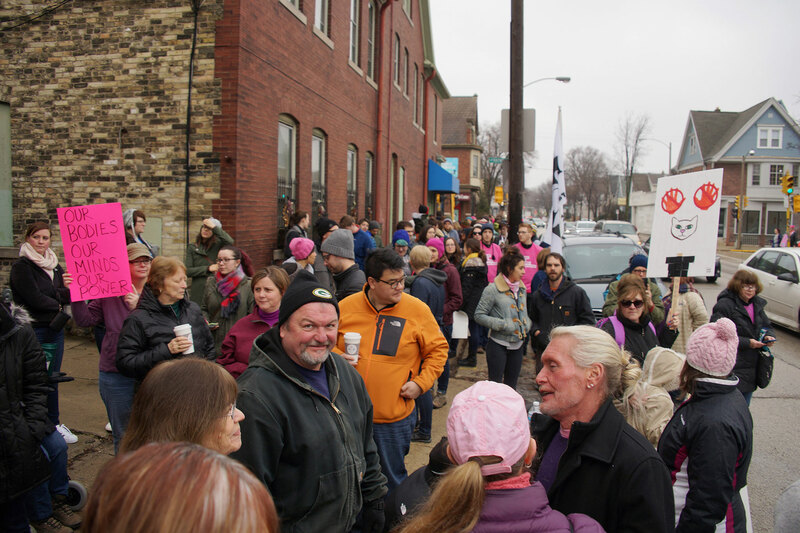 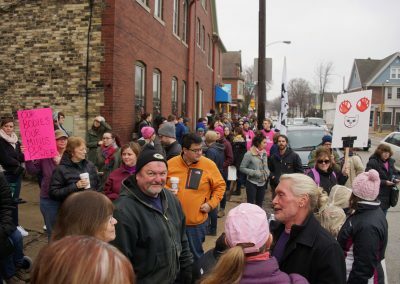 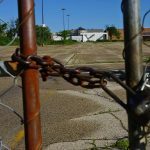 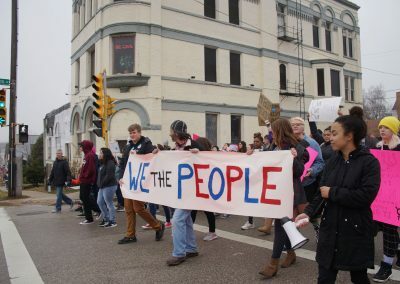 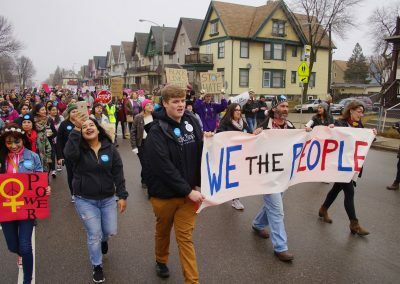 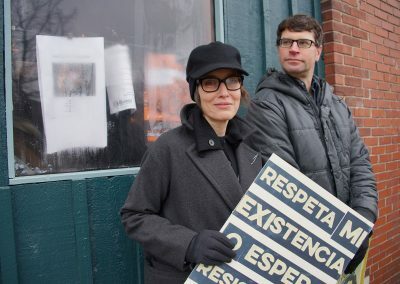 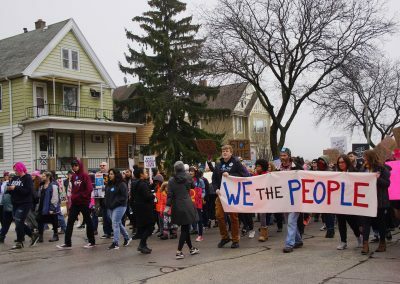 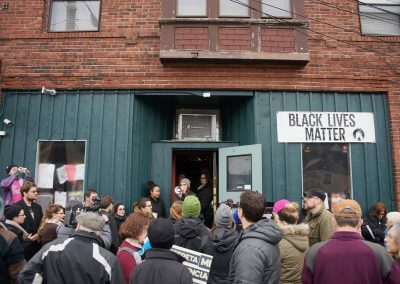 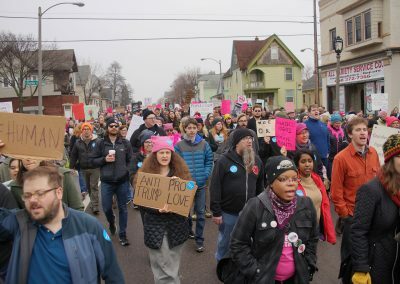 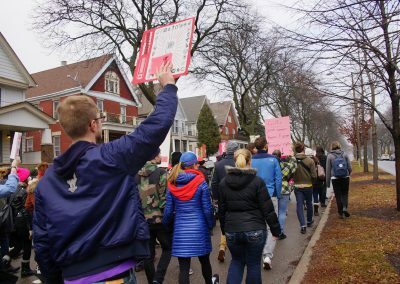 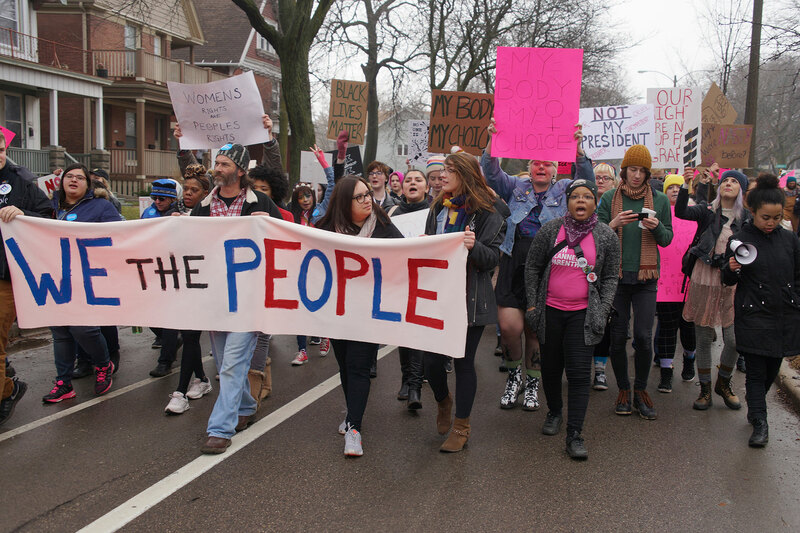 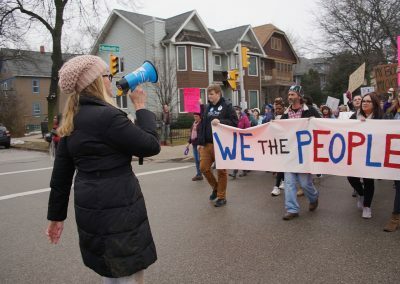 The two-mile route began at the Riverwest Public House Cooperative, and the Milwaukee Independent walked step-for-step with the marchers to documented it in images. 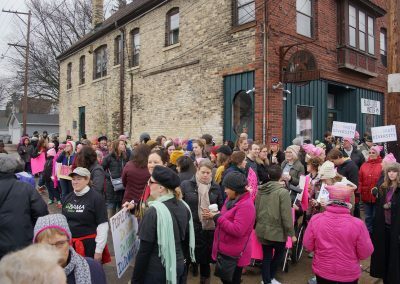 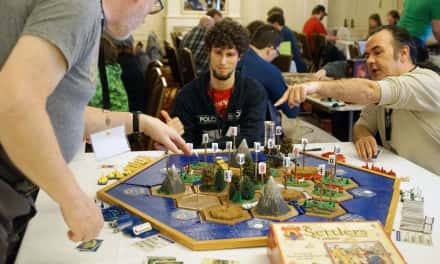 The event ended at Company Brewing and transitioned into Riverwest Femfest 2017 activities, featuring a film showcase and workshops.